This is a showcase of personalized items that I have been commissioned for. 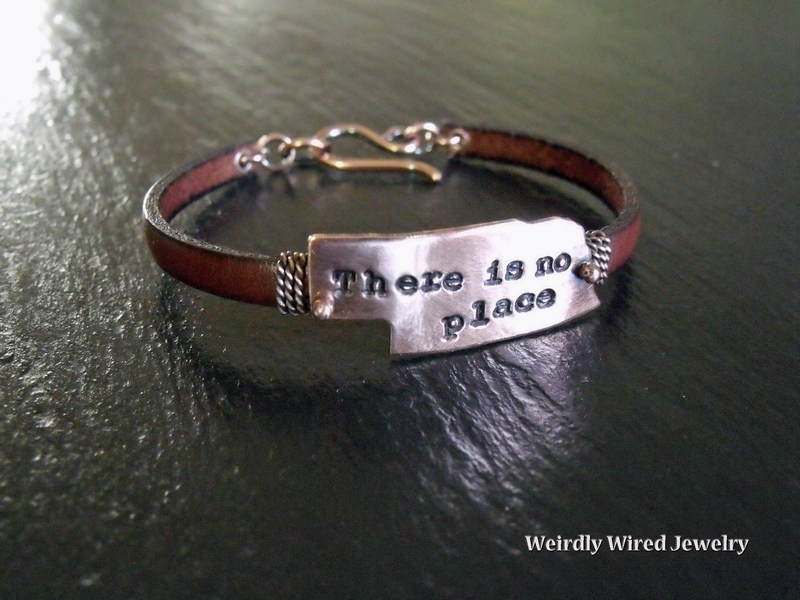 Please contact me (angie at weirdlywiredjewelry.com) if you have questions or would like a price for something similar. 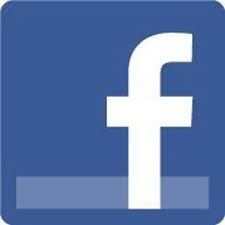 Please see FONTS AND SYMBOLS page for options. NEW! Click on the picture to order!!! 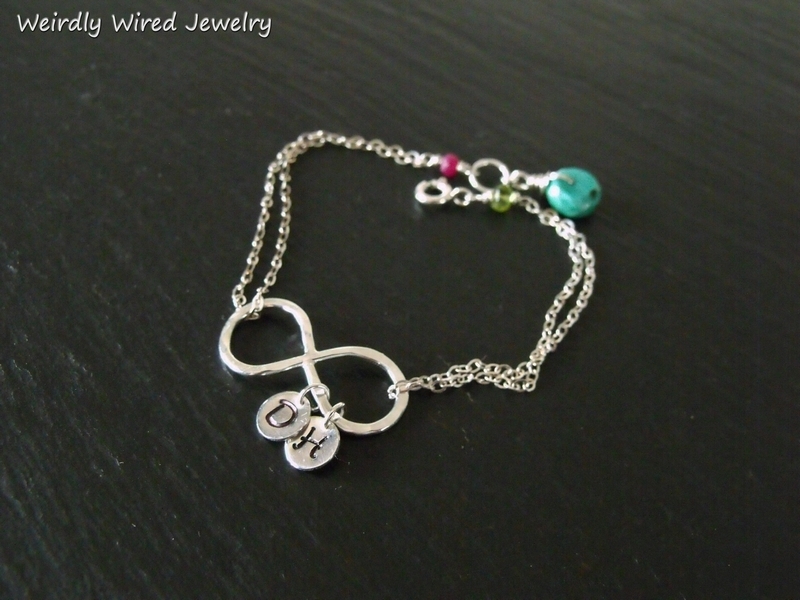 Infinity Bracelet with Stamped Initials - click the picture to order! NEW! Click on the picture to order!!! Nebraska-The Good Life Bracelet - send email. 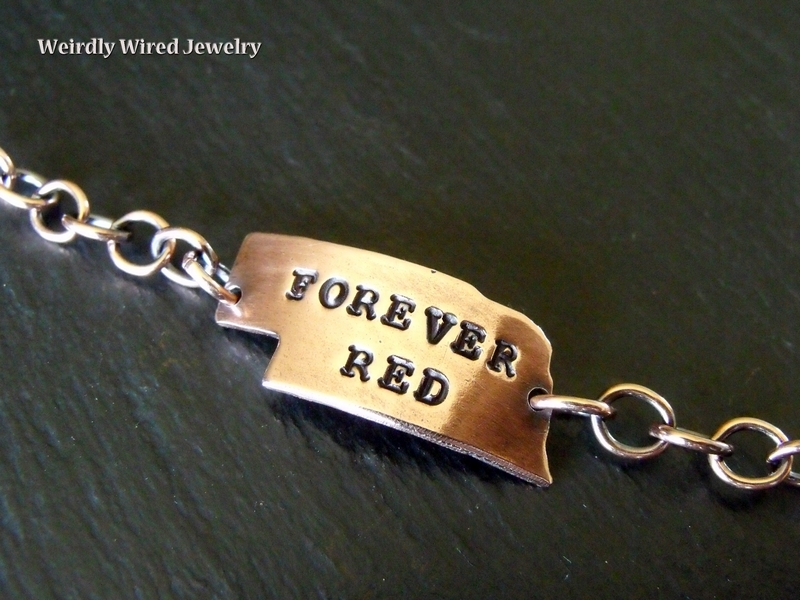 Forever Red NE Bracelet - send email. Copper Nebraska Bracelet - send email. 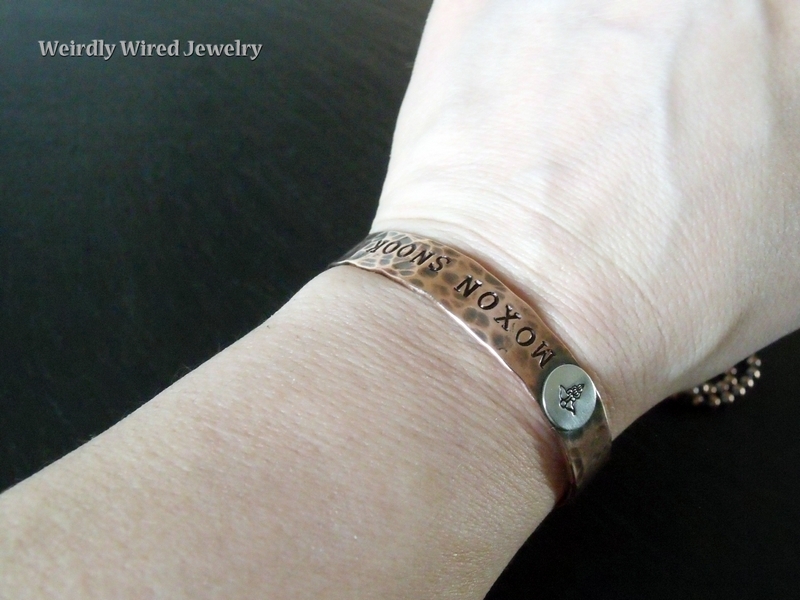 Custom Copper Medic Alert Bracelet - send email. 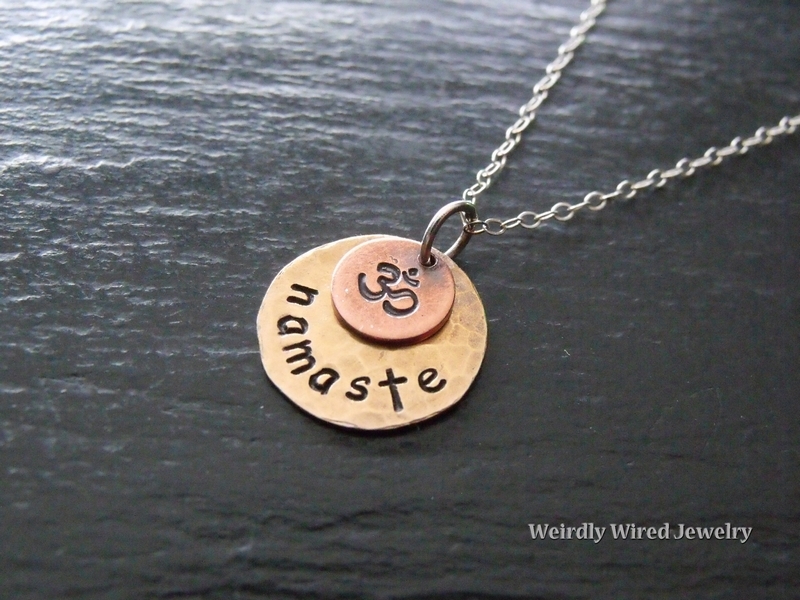 Namaste Om Symbol Necklace - send email. 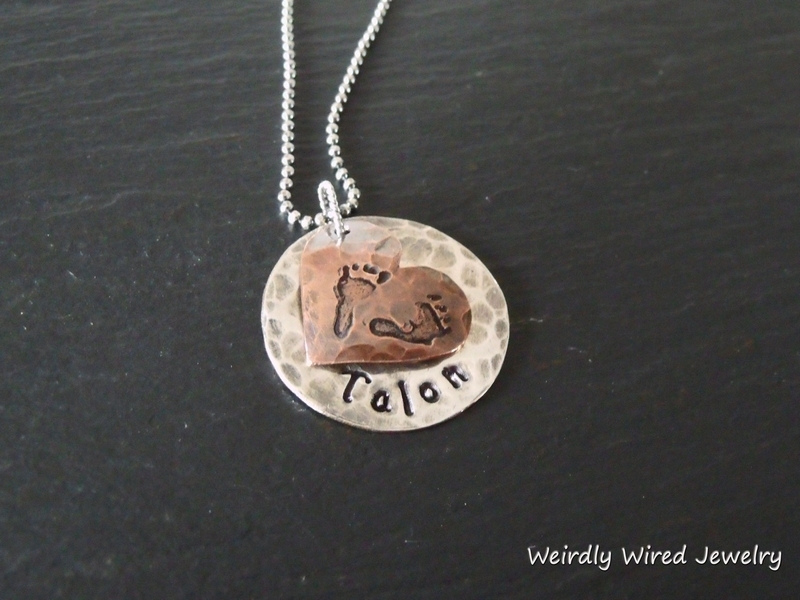 Baby Feet Stamped Mother's Necklace - send email. 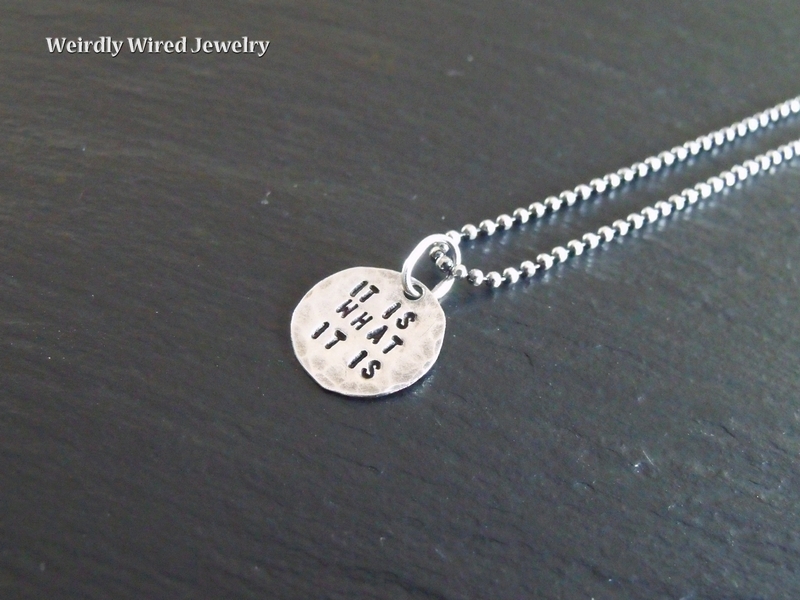 Tiny Messages Necklace-It is what it is - send email. 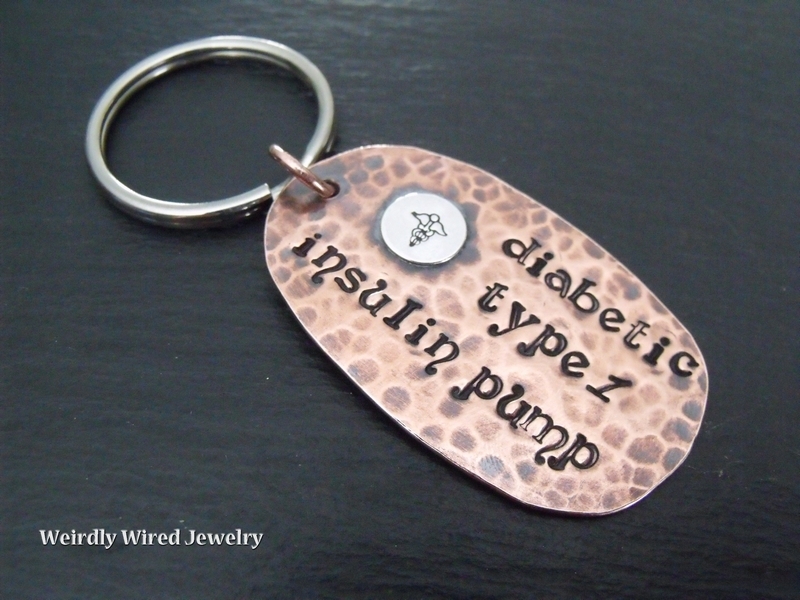 Custom Medic Alert Key Chain - send email. 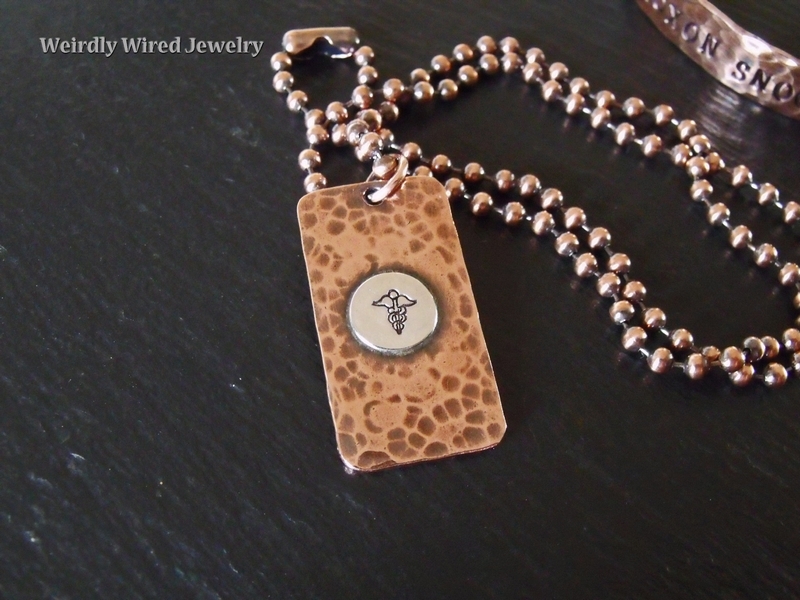 Medic Alert Dog Tag Necklace-Back - send email. Medic Alert Dog Tag Necklace-Front - send email. Medic Alert Cuff Worn - send email. Live To Quilt Bookmark - send email. 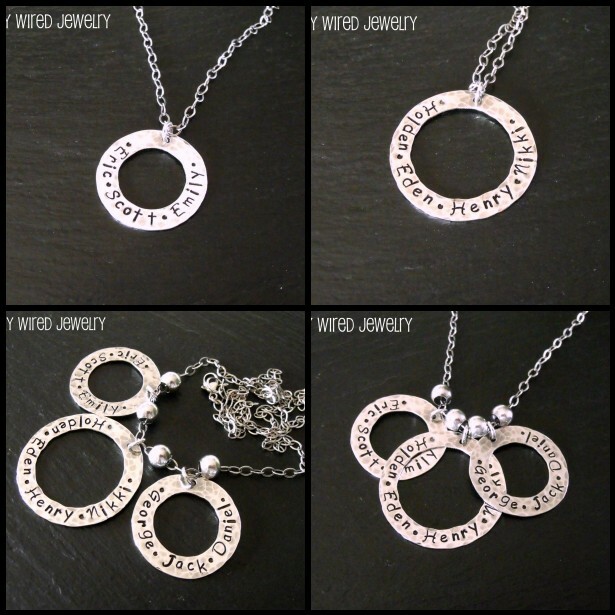 Stamped Interlocking Circles Necklace - send email. 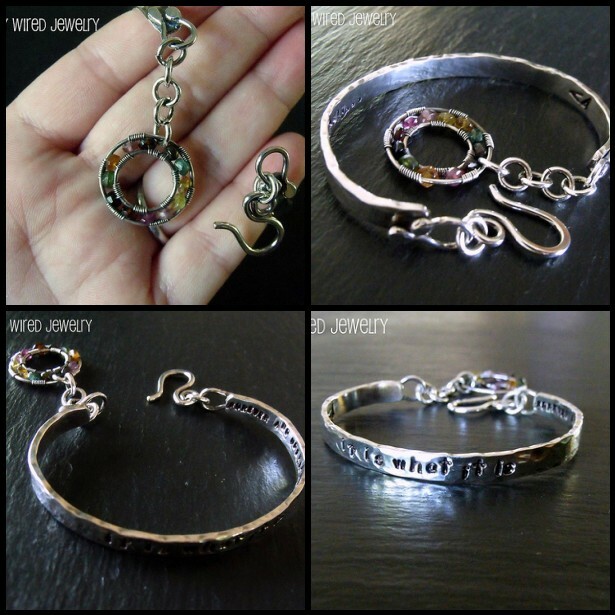 Infinity Mothers Charm Bracelet - send email. 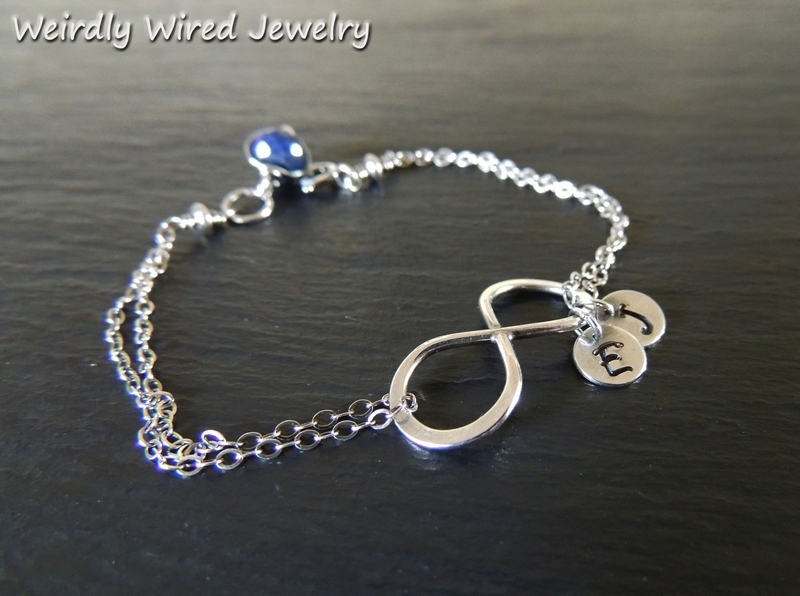 Infinity Bracelet Set-His and Hers - send email. Wide Leather Stamped Bracelet - send email. Trinity Pendant-Be Honest Be Kind Be True - send email. Trinity Pendant It is what it is - send email. Sterling Trinity Stamped Pendant - send email. Stamped Heart Pendant - send email. 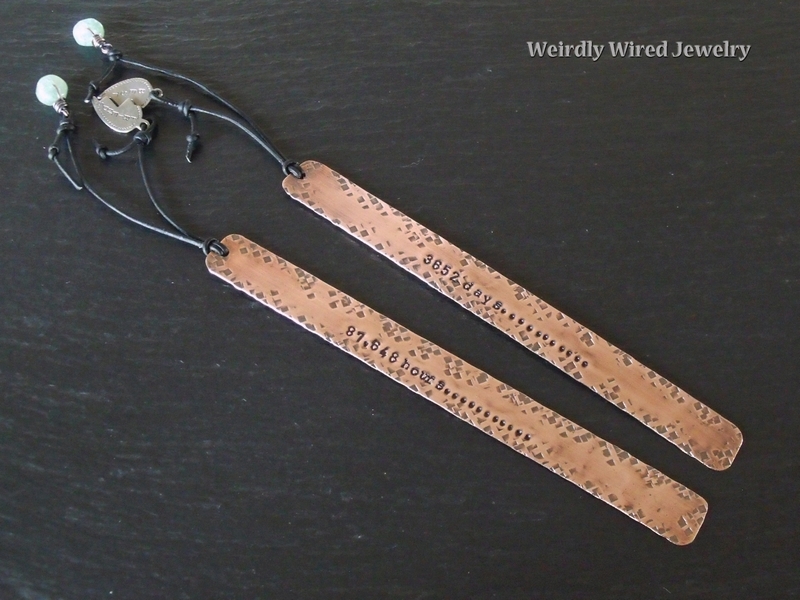 Stamped Bookmark Set - send email. 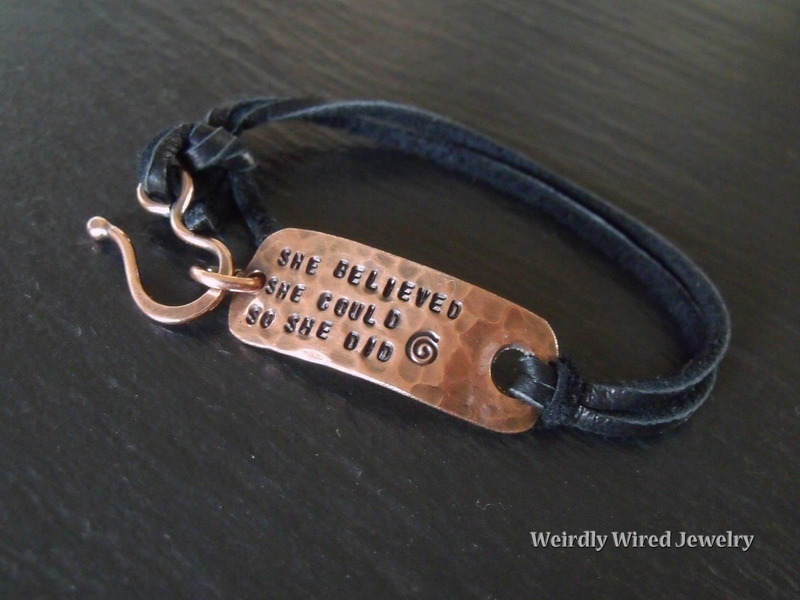 She Believed She Could So She Did Bracelet - send email. Tivoli Fest Iowa Key Chains - send email. 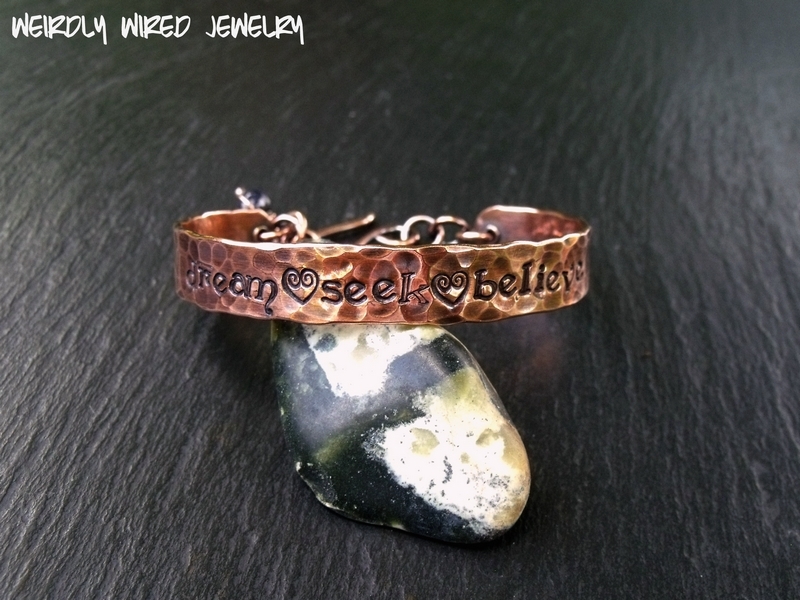 Believe Bracelet - send email. 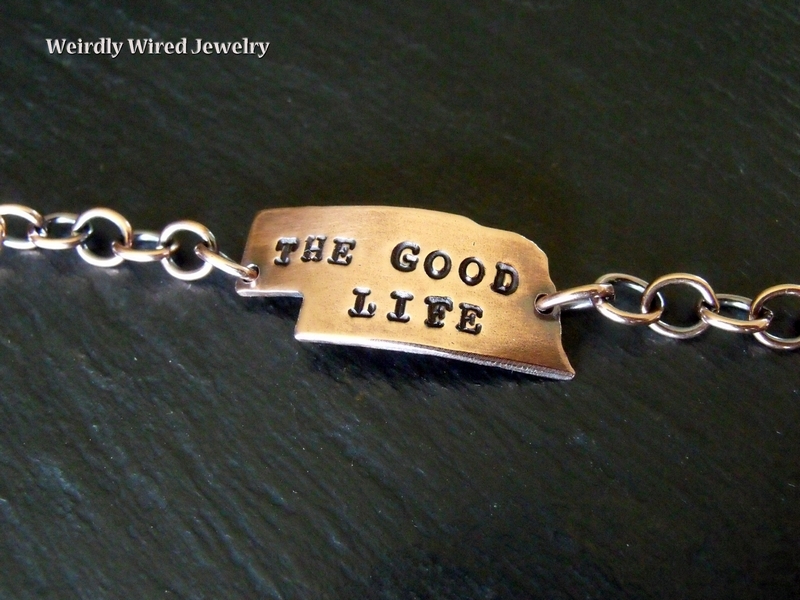 The Good Life Nebraska Bracelet - send email. 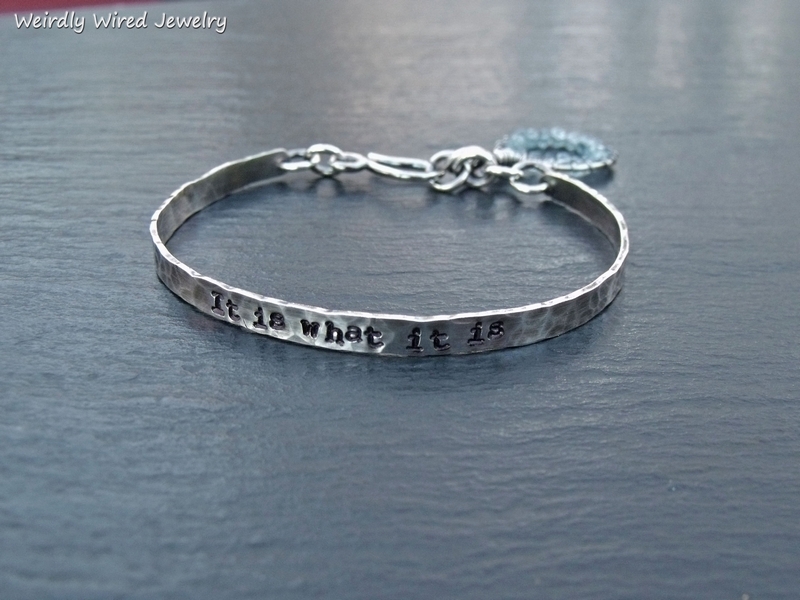 Sterling Quote Bracelet - send email. 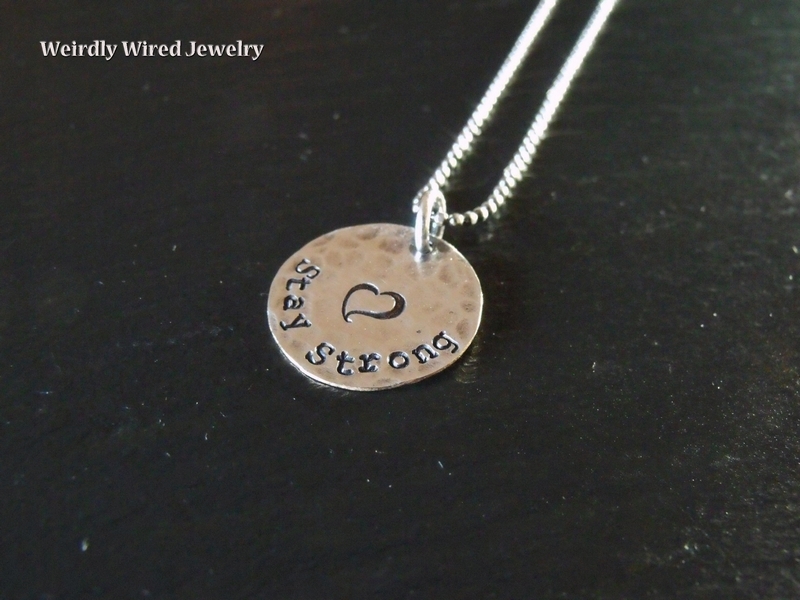 Stay Strong Stamped Necklace - send email. Nebraska Bracelet Brown Leather - send email. 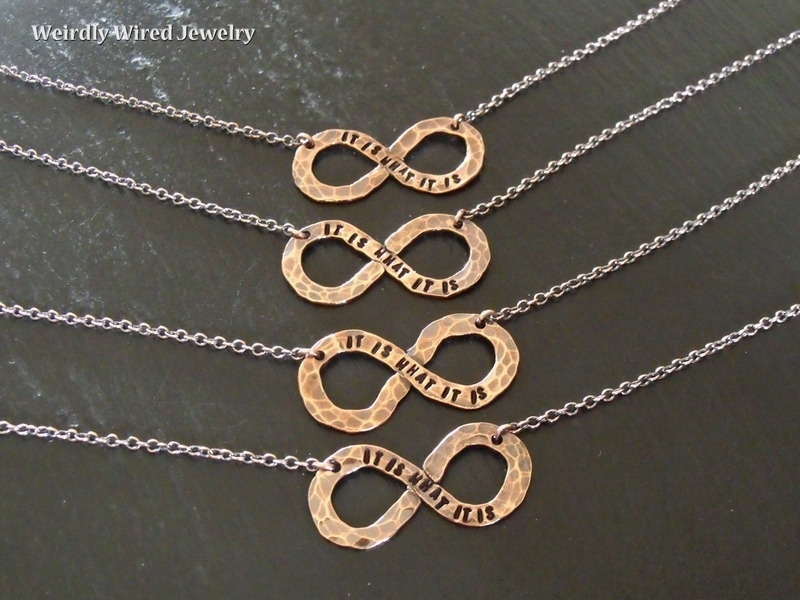 Infinity It is what it is Necklaces - send email. 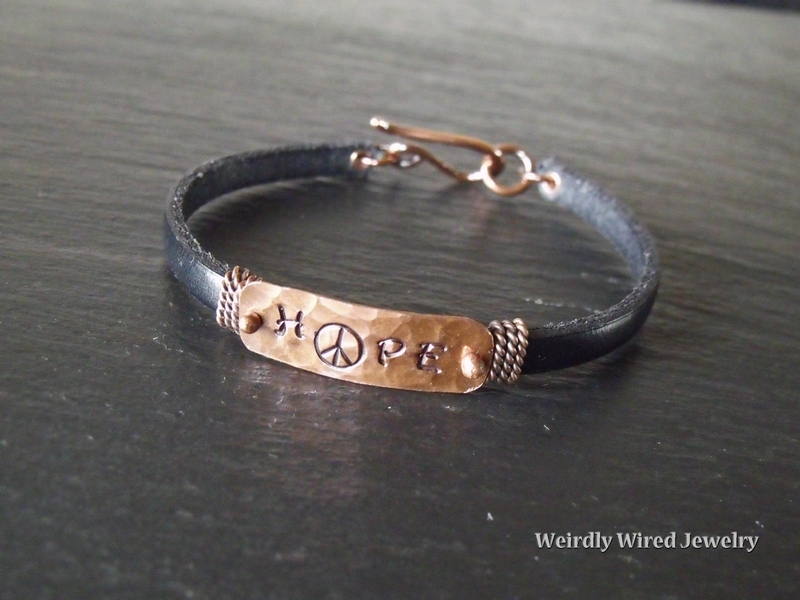 Hoping for Peace Bracelet - send email. 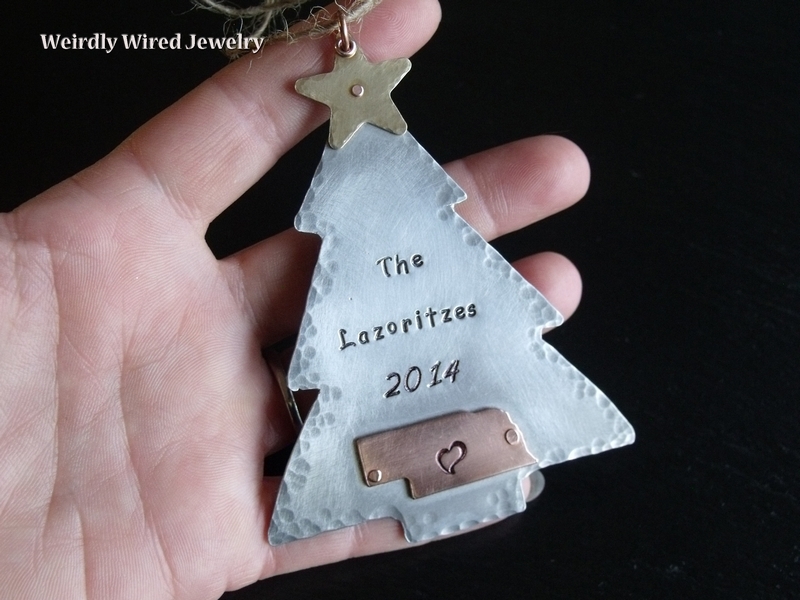 Custom Christmas Ornament - send email. Custom Cross Wall Hanging - send email. 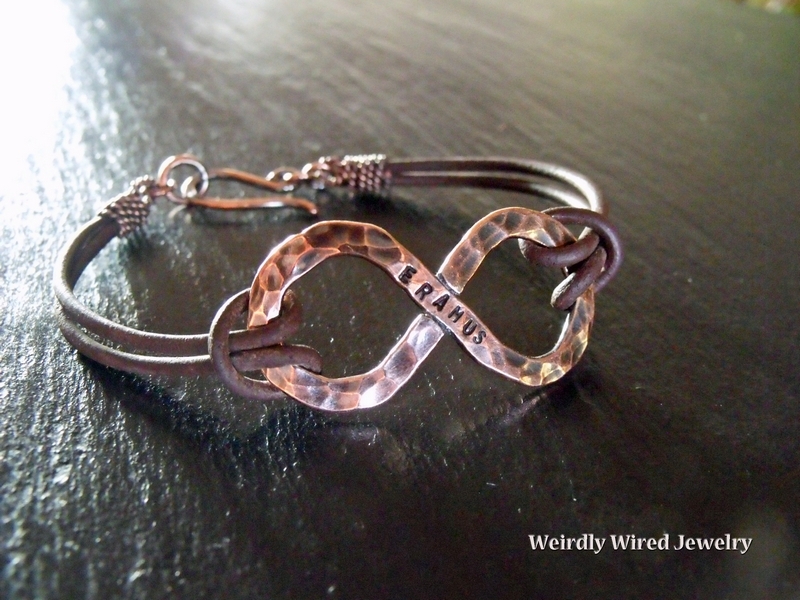 Copper Infinity Remembrance Bracelet - send email. 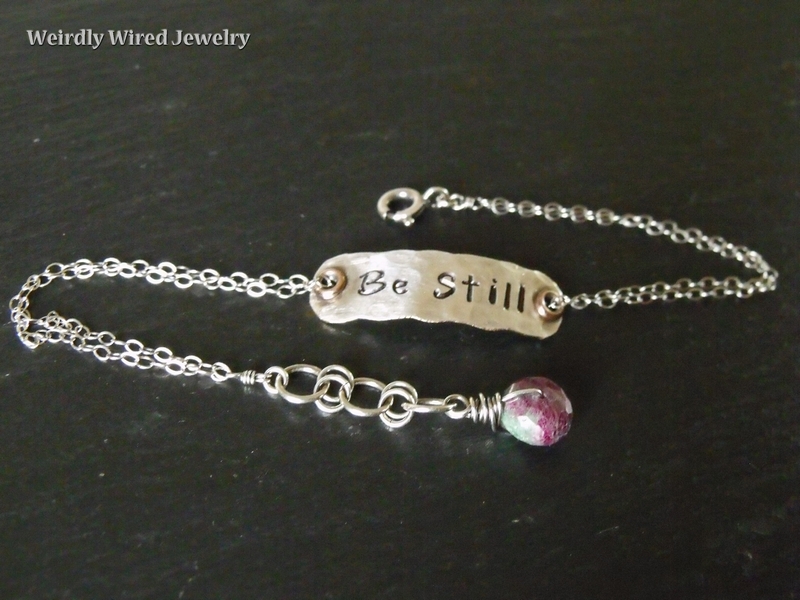 Be Still Ruby Zoisite Bracelet - send email. Stamped Plate on Leather Bracelet - send email. 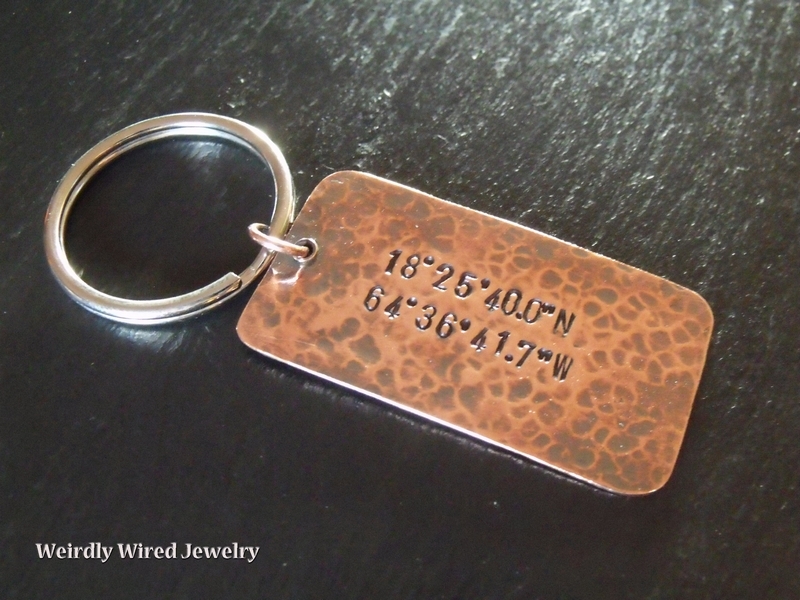 Dog Tag Key Chain with GPS - send email. 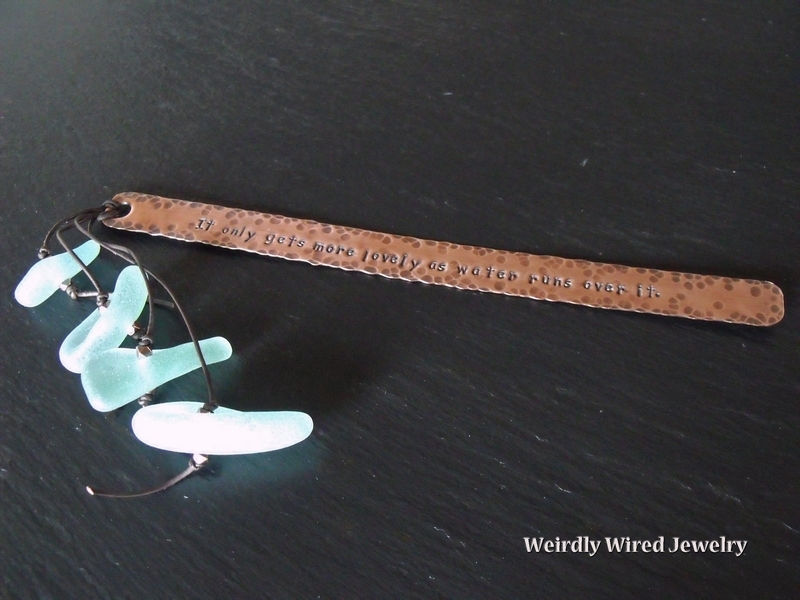 Sea Glass Copper Bookmark - send email. 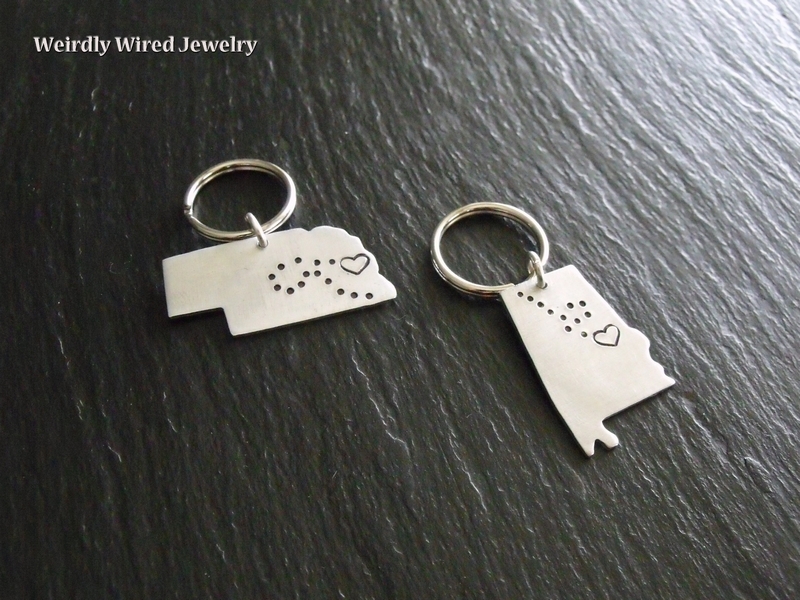 Nebraska Alabama Key Chains - send email. Mixed Metal Stacked Pendant - send email. 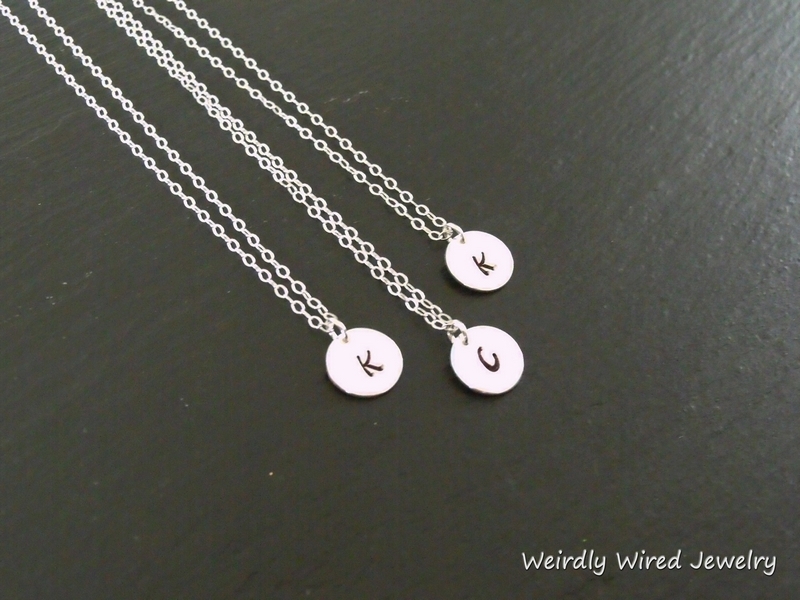 Custom Initials Necklace - send email. 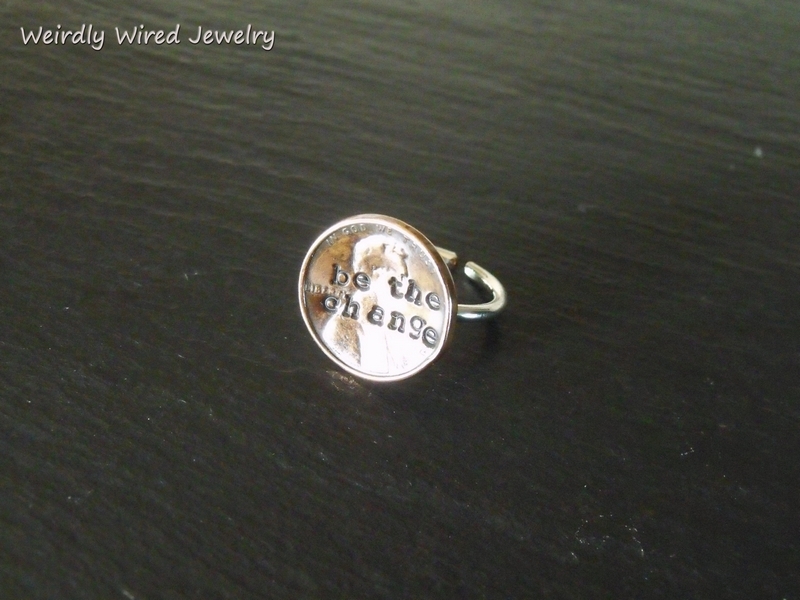 Be The Change 1972 stamped penny - send email. Updated Symbols Sampler - send email. 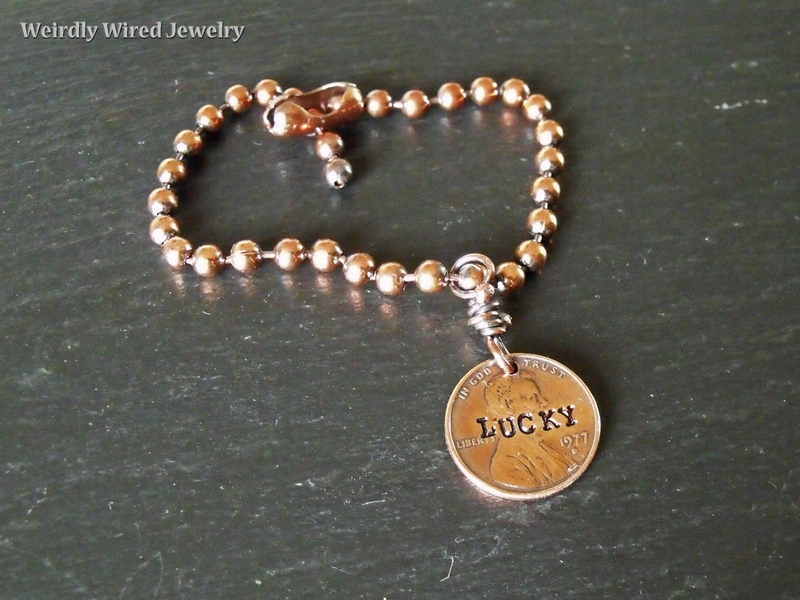 Stamped Lucky Penny Bracelet-CBC - send email. 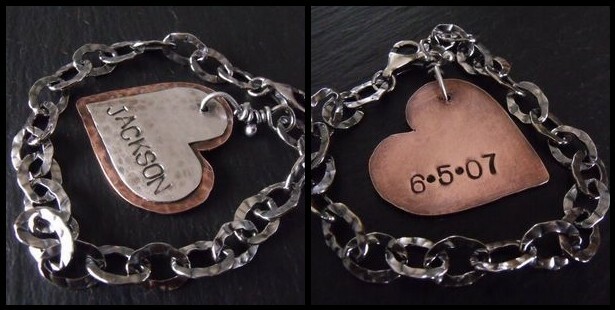 Lucky Penny Bracelet-1974 - send email. 1979 Stamped Lucky Penny - send email. 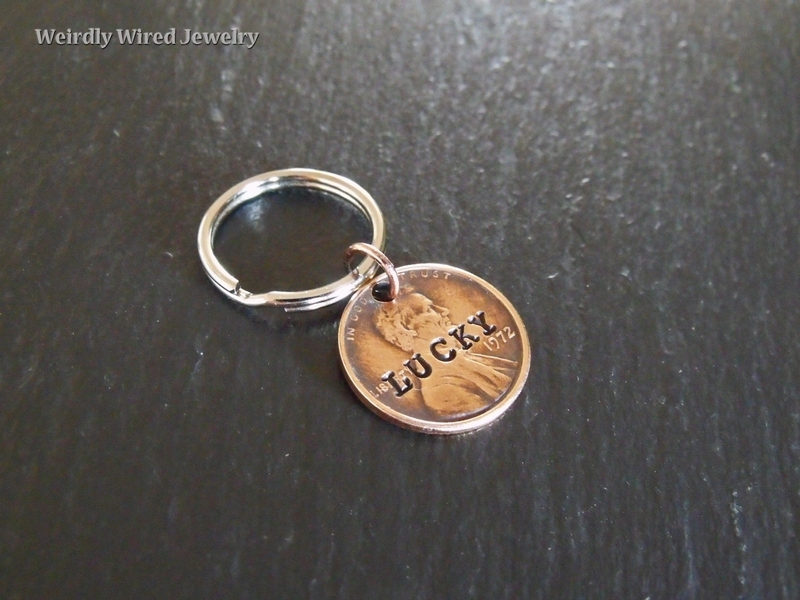 1978 Key Chain Lucky Penny - send email. 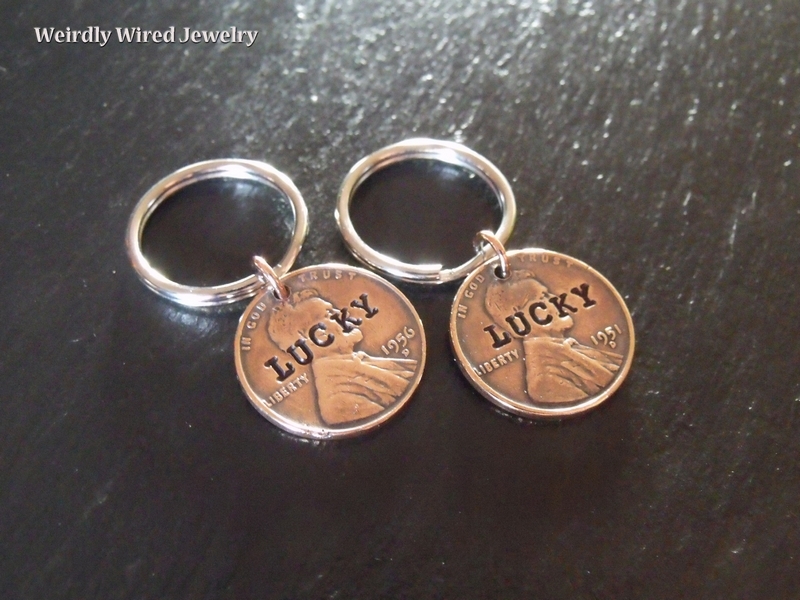 Stamped Penny Key Chain Set - send email. 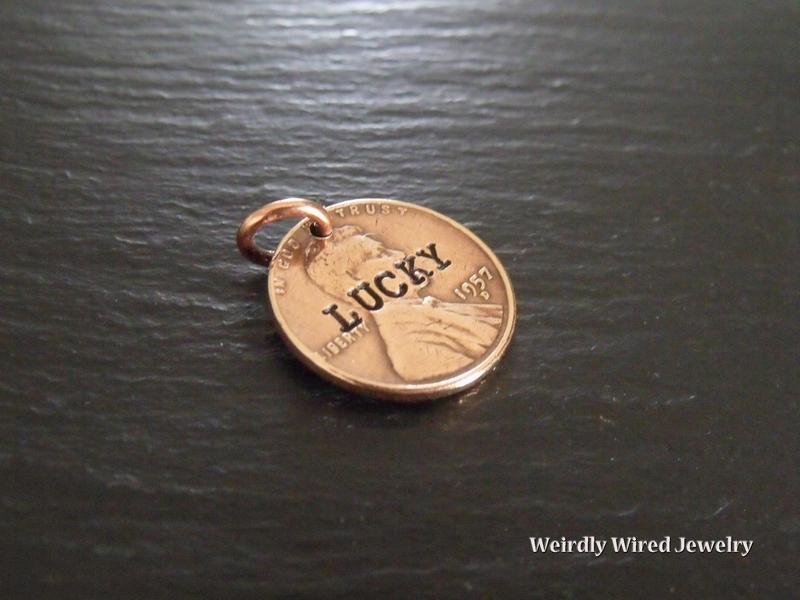 Lucky Penny Key Chain-1991 - send email. 1972 Penny-stamped key chain - send email. 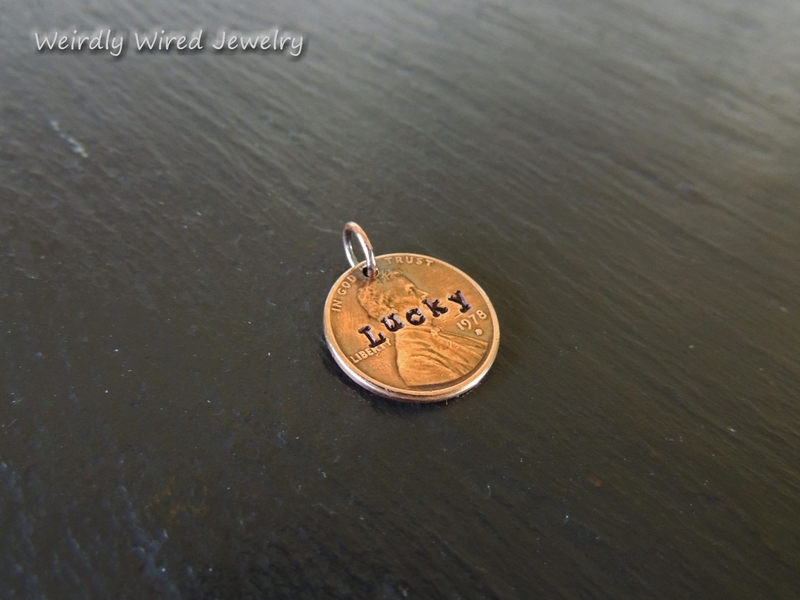 1957 LUCKY Penny - send email. 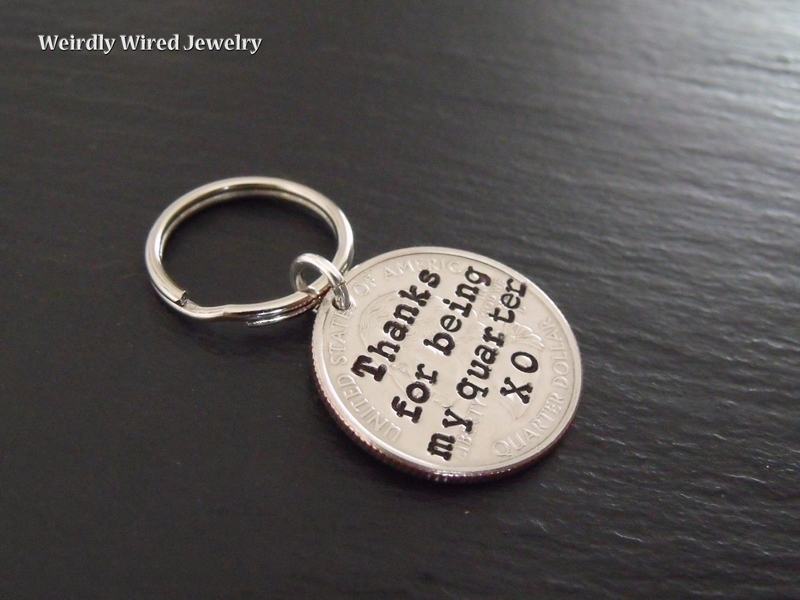 Quarter Key Chain - stamped - send email. 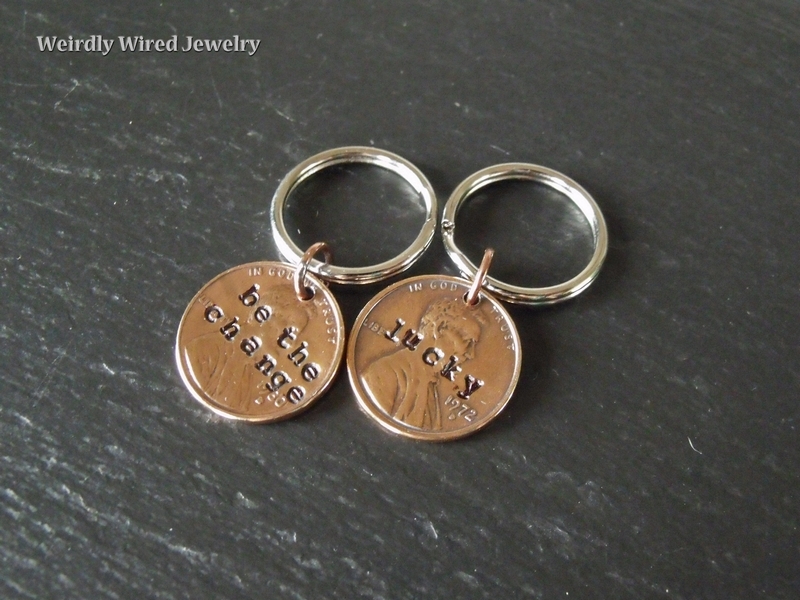 Stamped Penny Key Chains - send email. 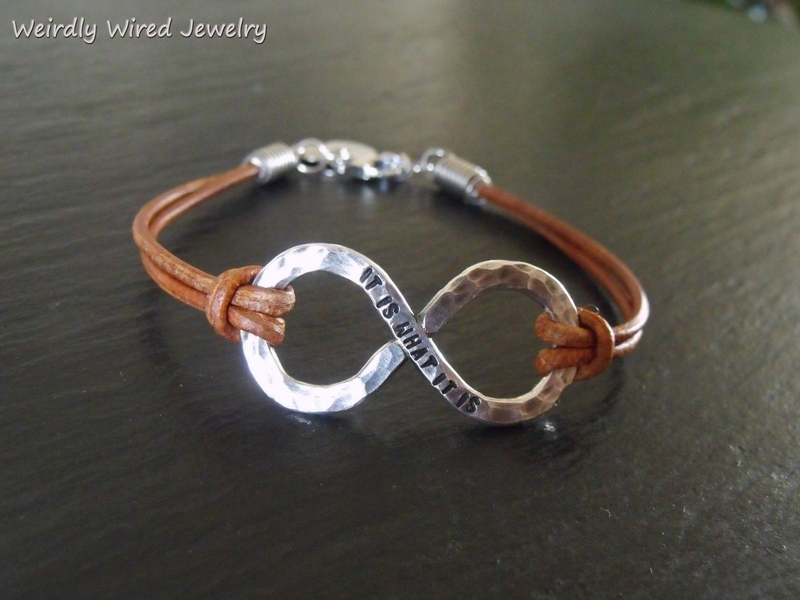 Men's Infinity Bracelet-Stamped - send email. Stamped Remembrance Keychain - send email. 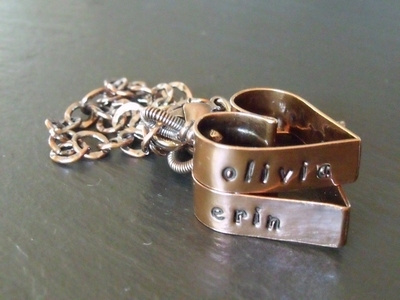 Stamped Rings Remembrance Necklace - send email. 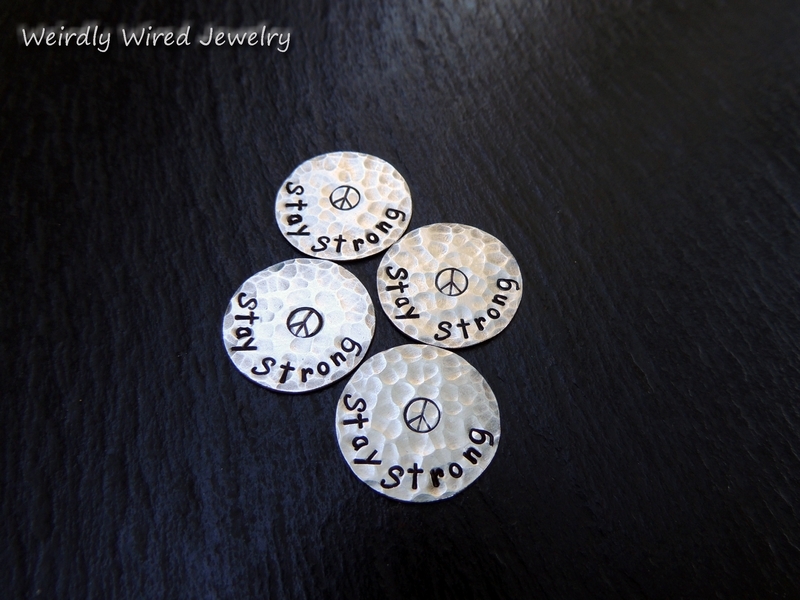 Stay Strong Charms - send email. Infinity bracelet with large Labradorite - send email. 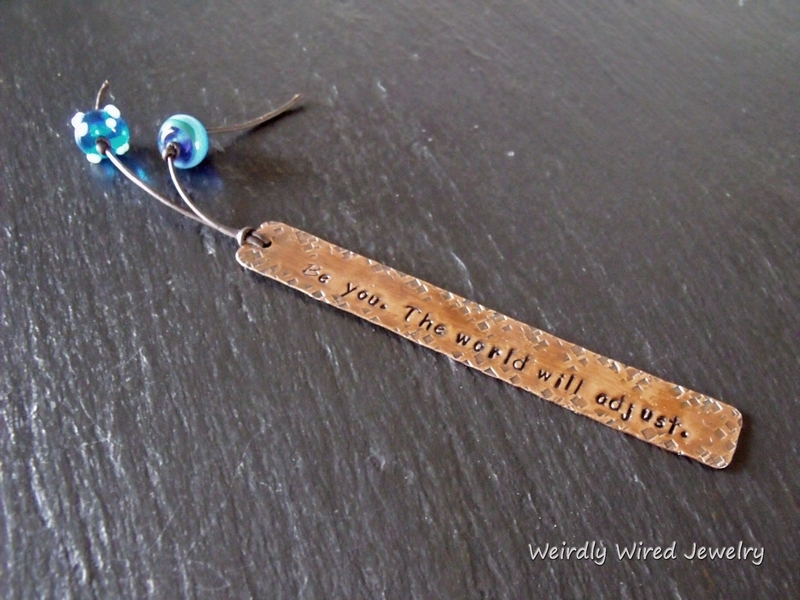 Stamped bookmark-Be You. The world will adjust. - send email. 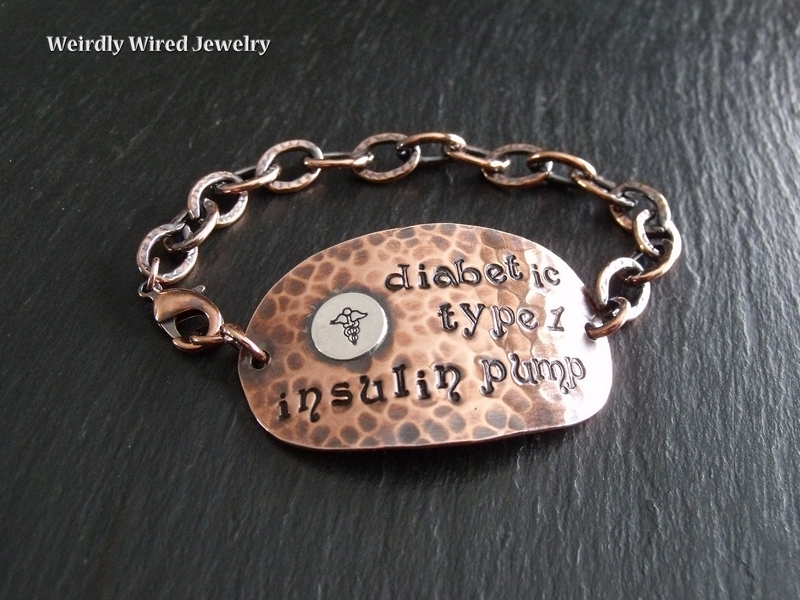 Type 1 Diabetic Medic Alert Bracelet - send email. 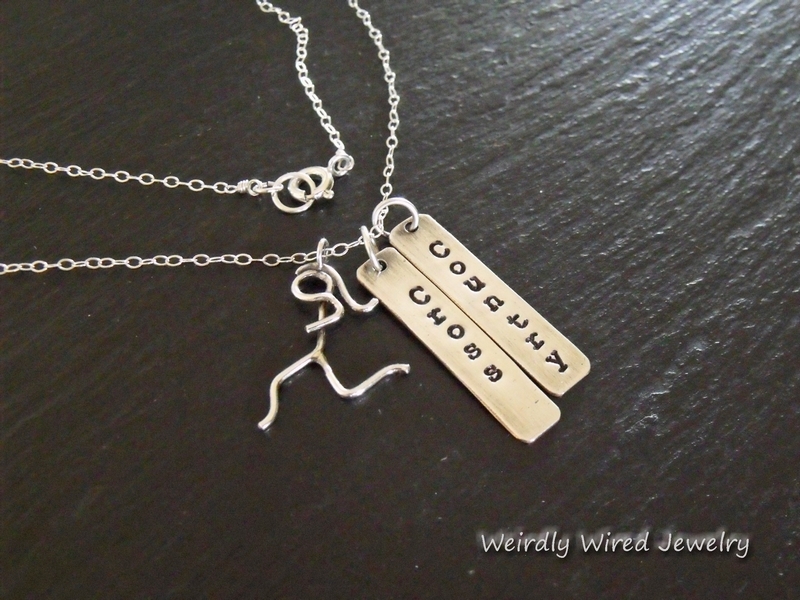 Cross Country Running Necklace - send email. 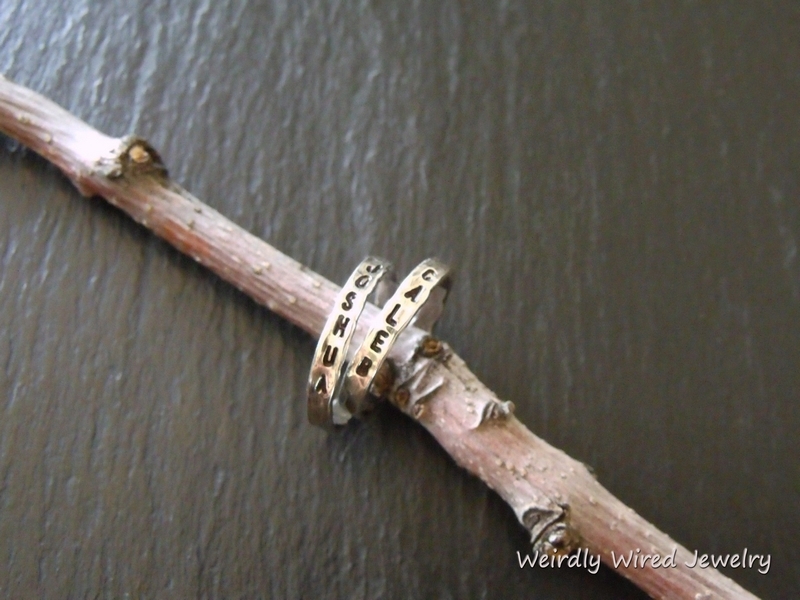 Four names stamped rings Mother's Bracelet - send email. 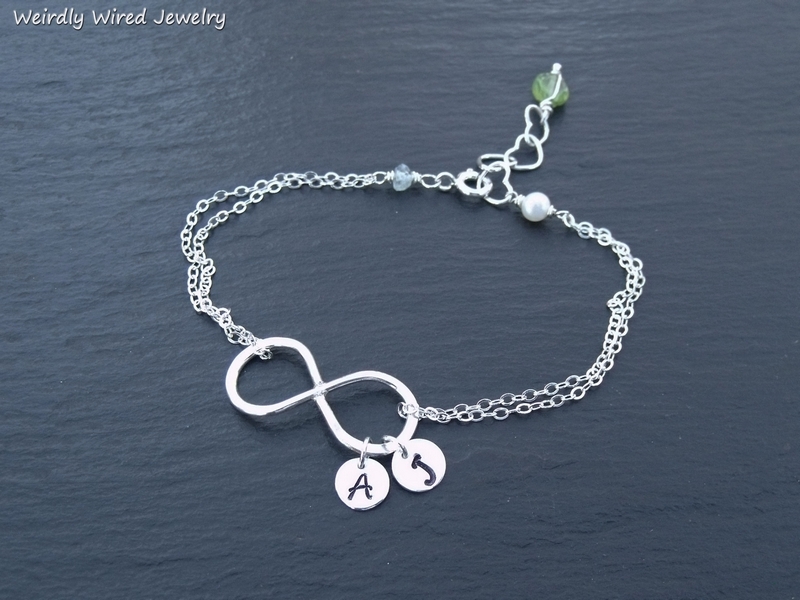 Women's Infinity Bracelet with Sapphire - send email. 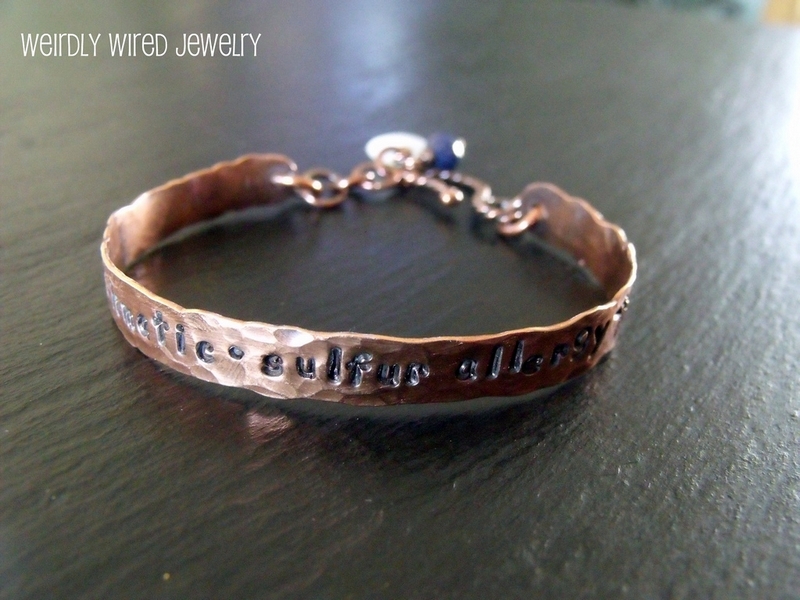 Copper and Sterling Medic Alert Bracelet - send email. 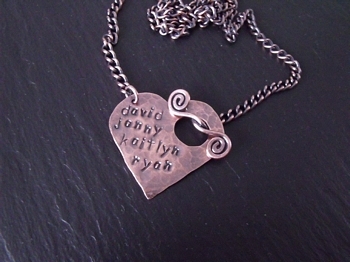 Dad's Copper washer stamped necklace - send email. 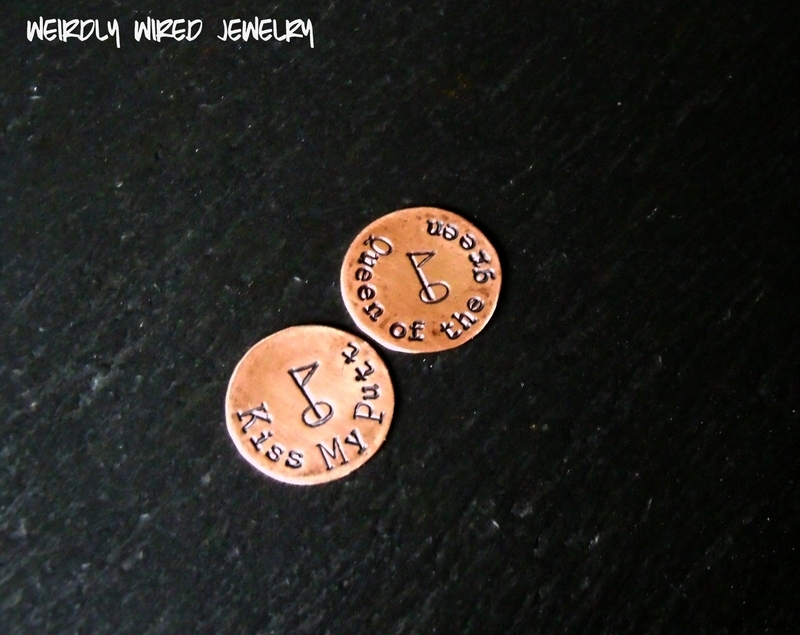 Copper washer stamped with birthstone - send email. 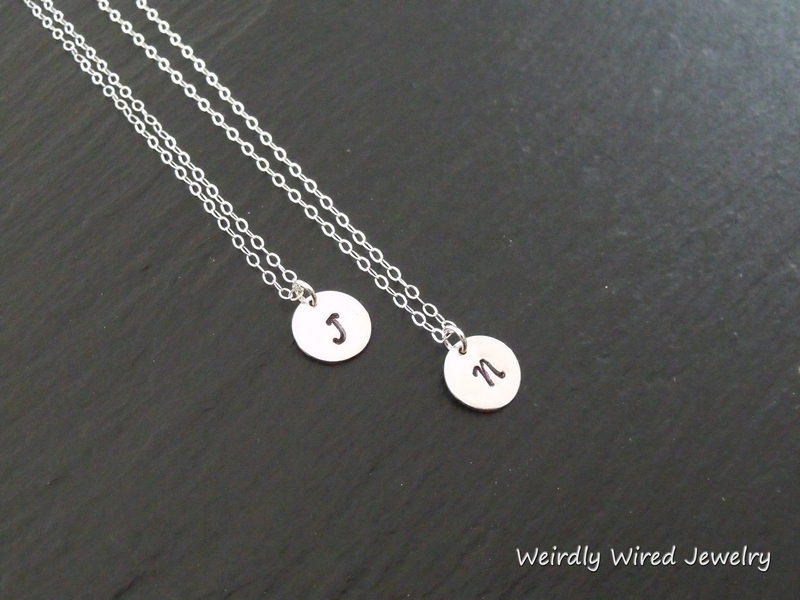 Four stamped intials necklace - send email. 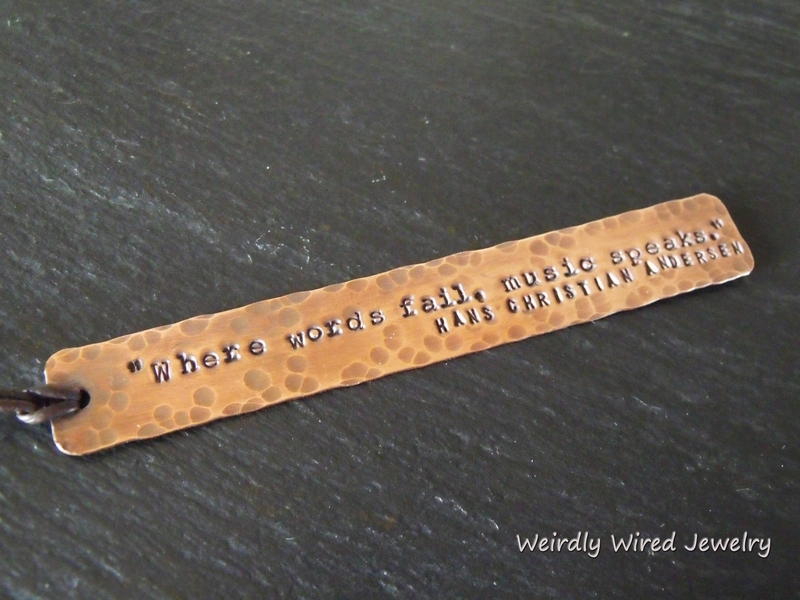 Author quote stamped bookmark - send email. 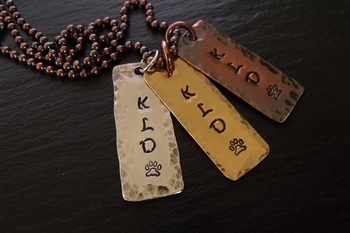 Stamped Dog Tags-Mixed Metals - send email. Stamped Intial Bar Pendant - send email. 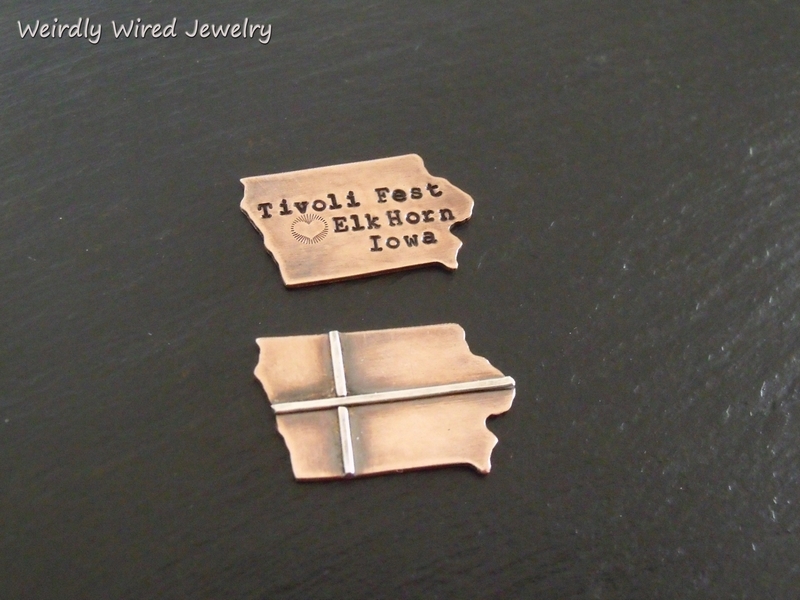 Stamped Iowa Copper - send email. 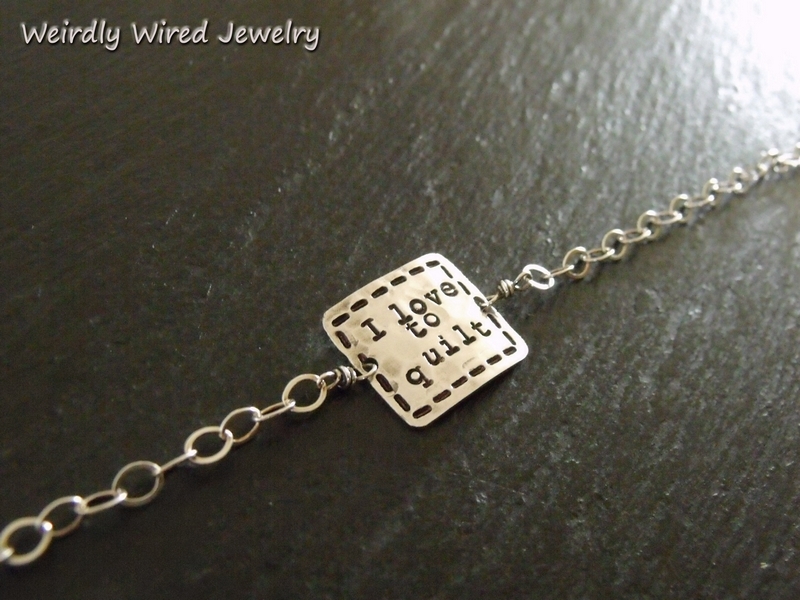 I love to quilt stamped bracelet - send email. H.C. Andersen Bookmark - send email. Stamped Disney bookmark - send email. 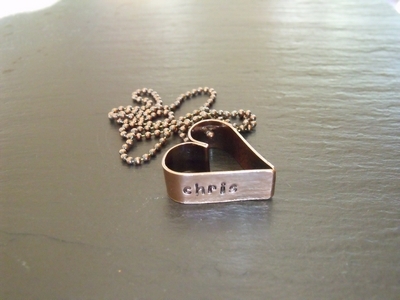 SS Infinity with Copper Heart Initial Slide Pendant - send email. 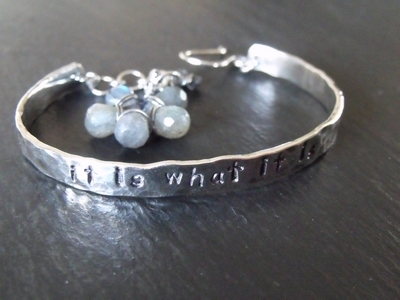 Stamped Quote Bracelet-PJ - send email. 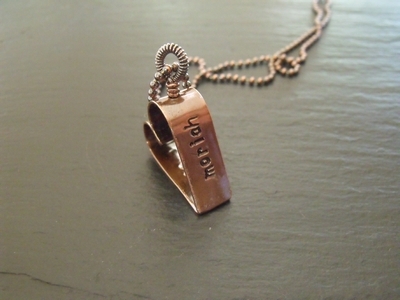 Sterling Stamped Rings-Mothers Necklace - send email. 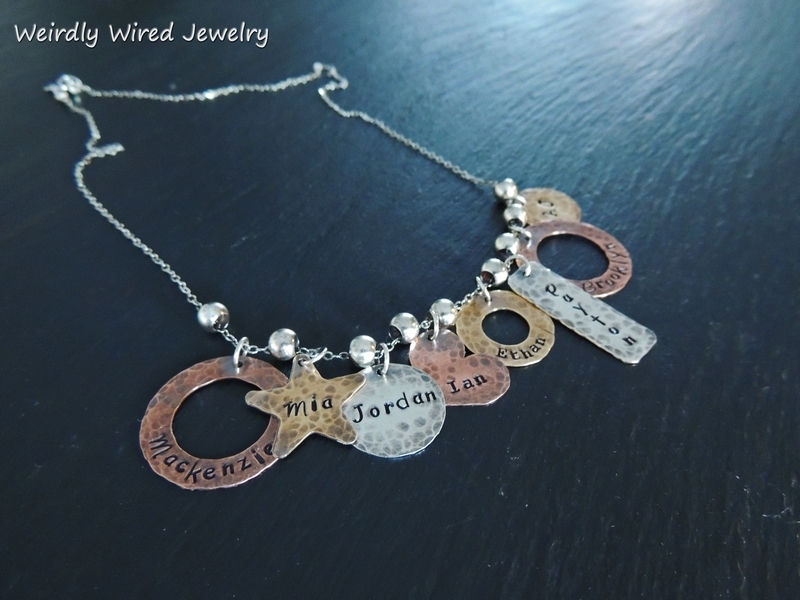 Stamped Copper Washer-MOTHER necklace-PJ - send email. Stamped Sterling Rings - Stackers-PJ - send email. 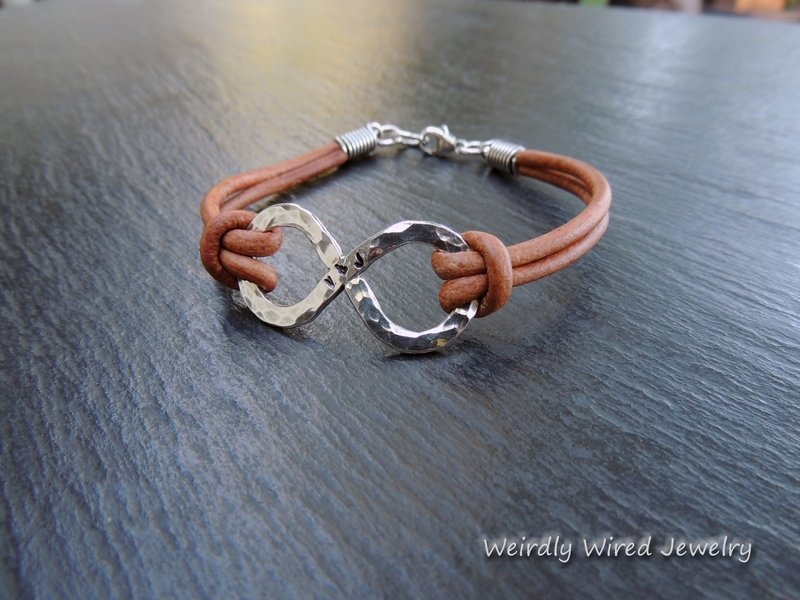 Infinity IT IS WHAT IT IS Leather Bracelet-PJ - send email. Grandmother's Necklace - send email. 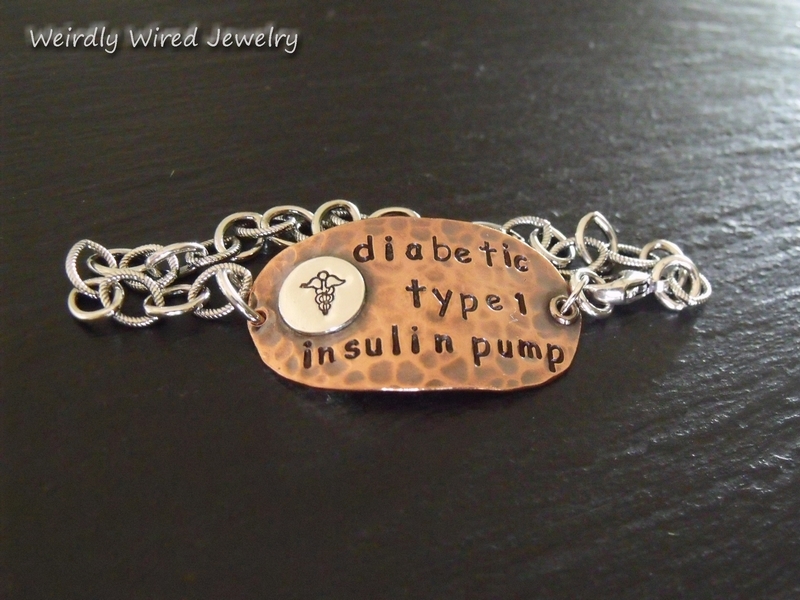 Stamped Medical ID Copper Cuff-PJ - send email. 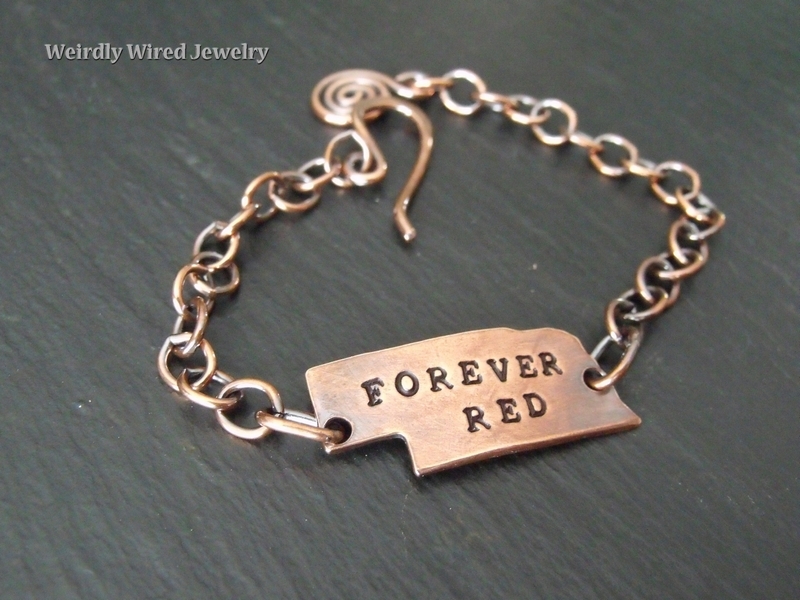 Custom Stamped Copper Cuff-PJ - send email. 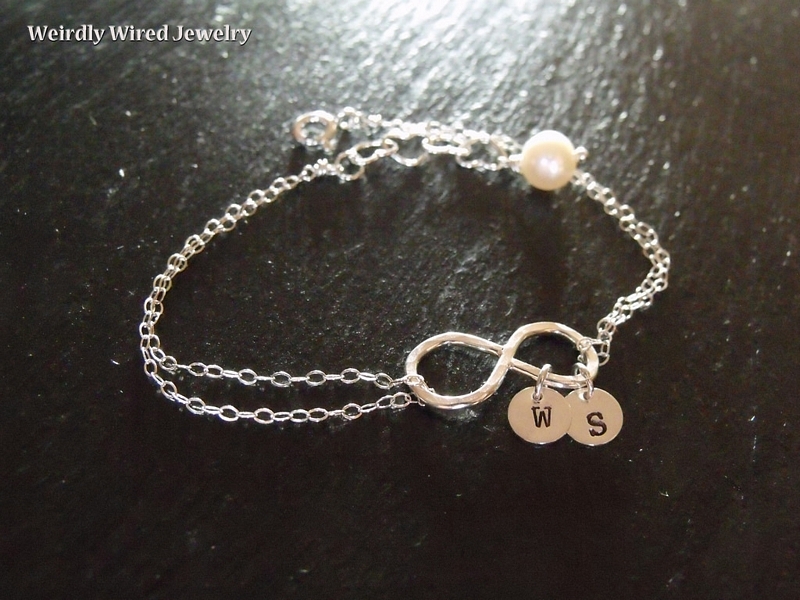 Bridesmaid Infinity Bracelets - send email. 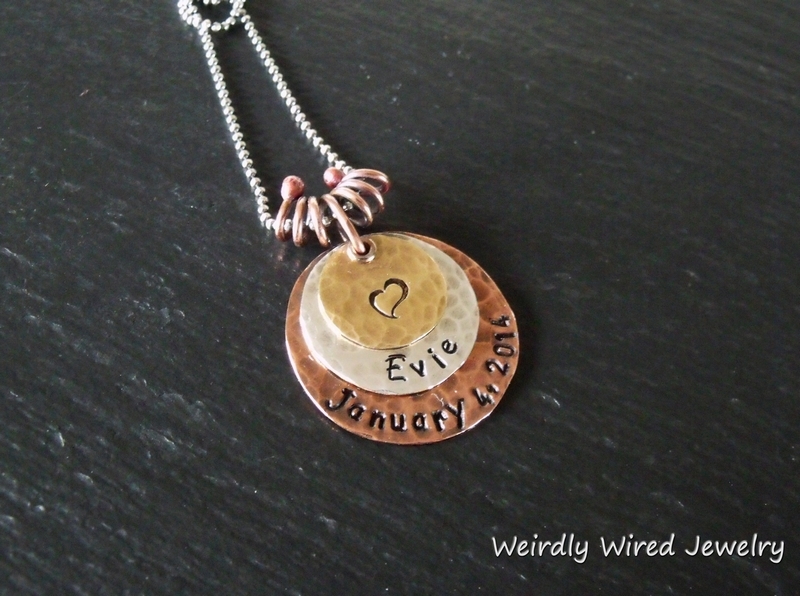 Stamped Mother's Necklace with Puffy Heart - send email. 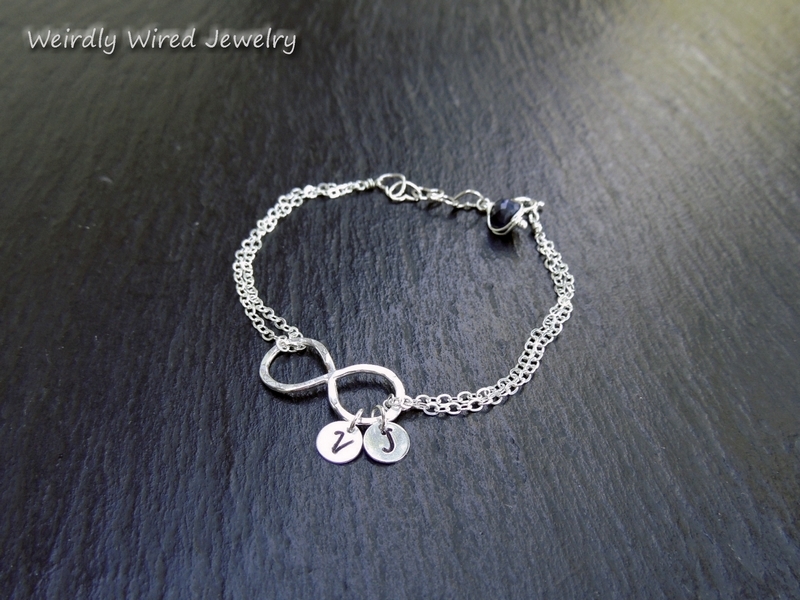 Sterling Infinity Bracelet-stamped - send email. 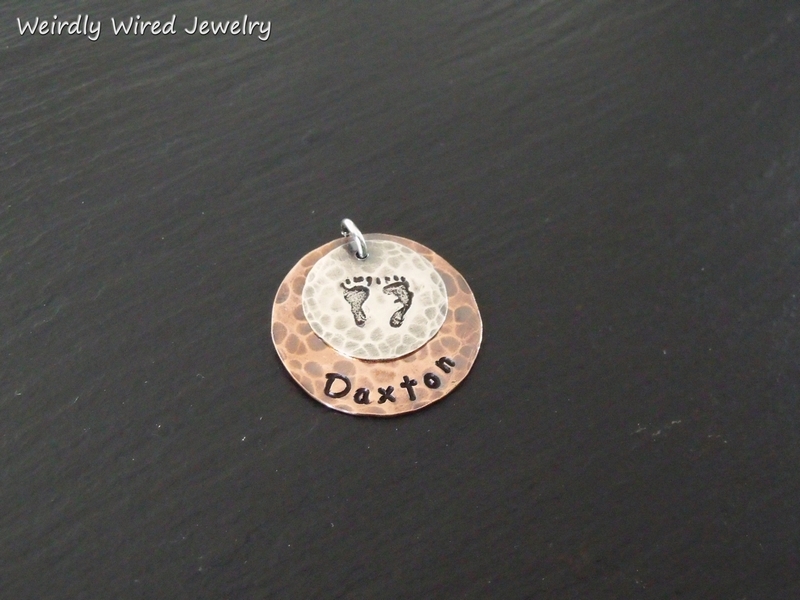 Name Charm with Baby Feet - send email. 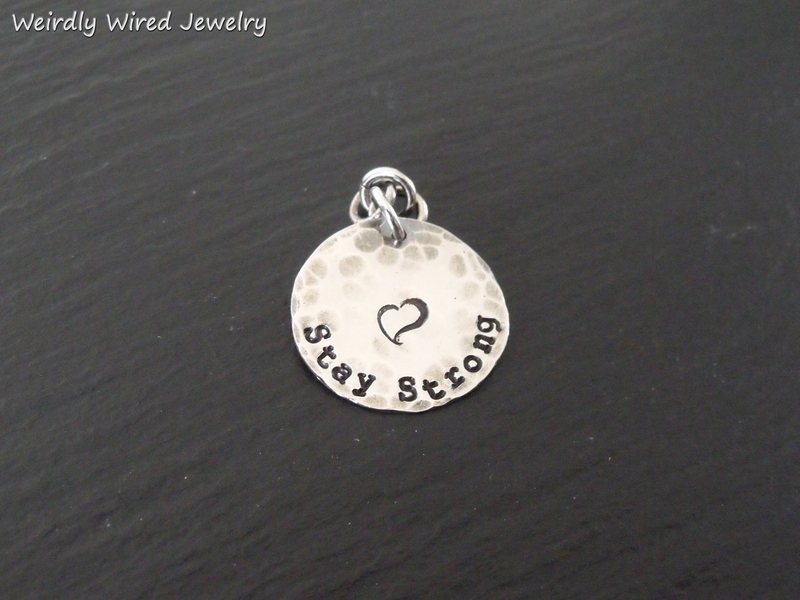 Stay Strong Sterling Charm - send email. 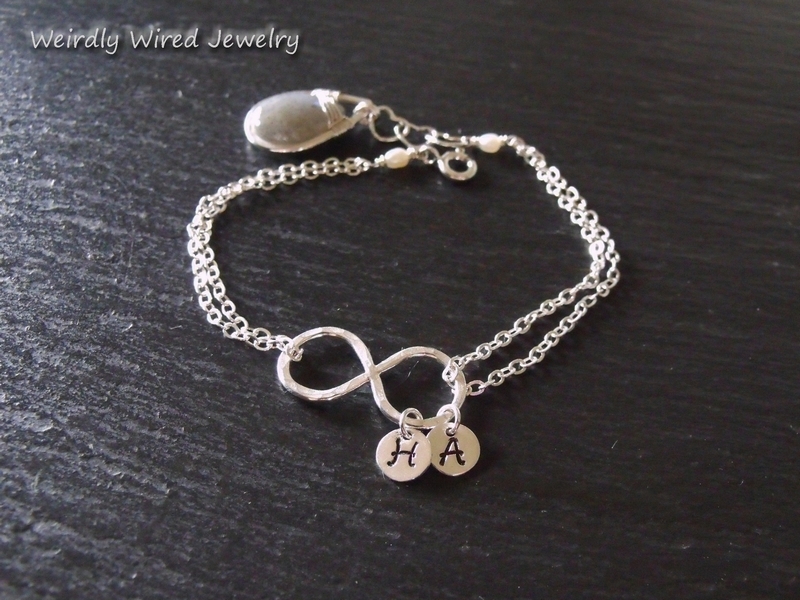 Infinity Bracelet with Stamped Initials - click the picture to order! 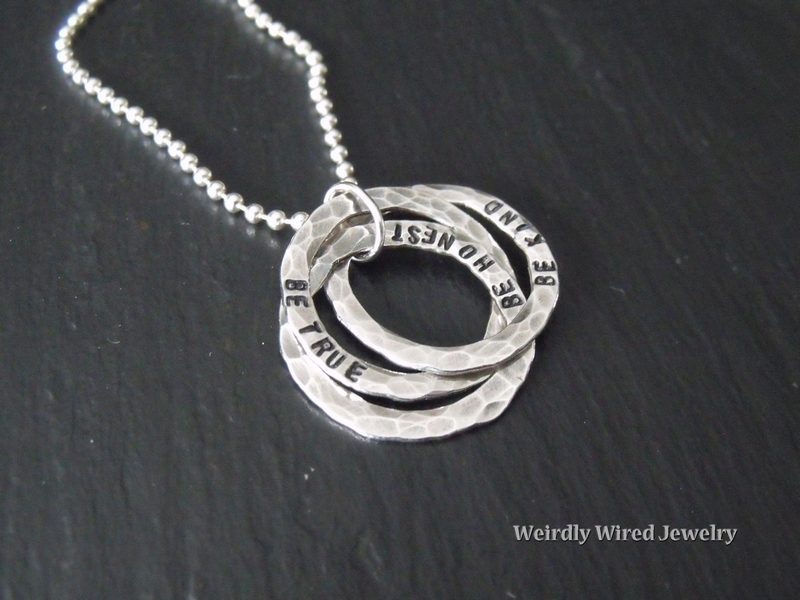 Mother's Pendant-Name and Birthdate - send email. 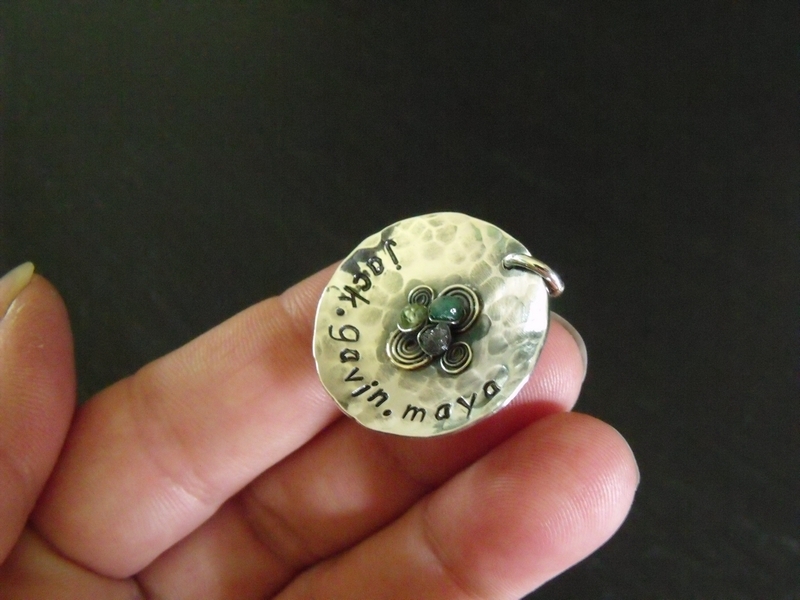 Stamped Mothers Pendant with name and date - send email. NEW! Click on the picture to order!!! 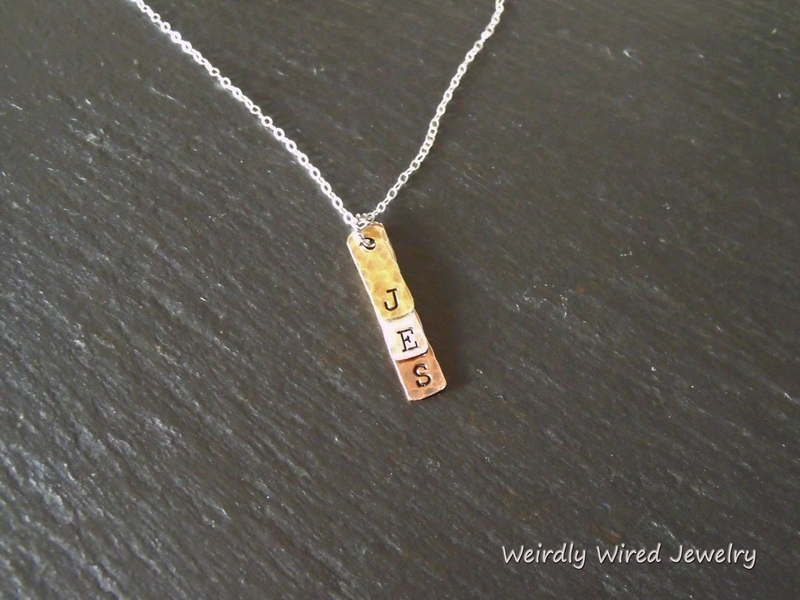 Stamped Grandmothers Necklace with eight names - send email. Four names stamped washer with birthstones - send email. 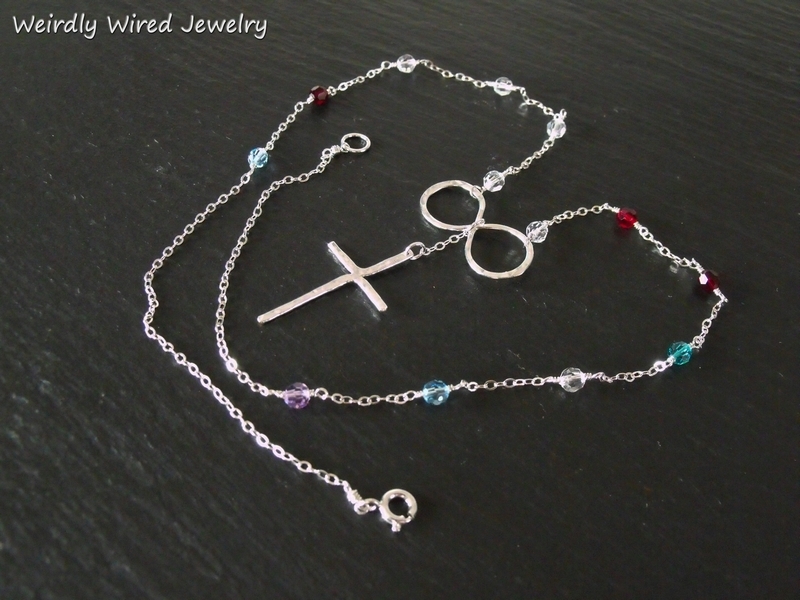 Infinity and Cross Necklace-Swarovski Birthstone - send email. 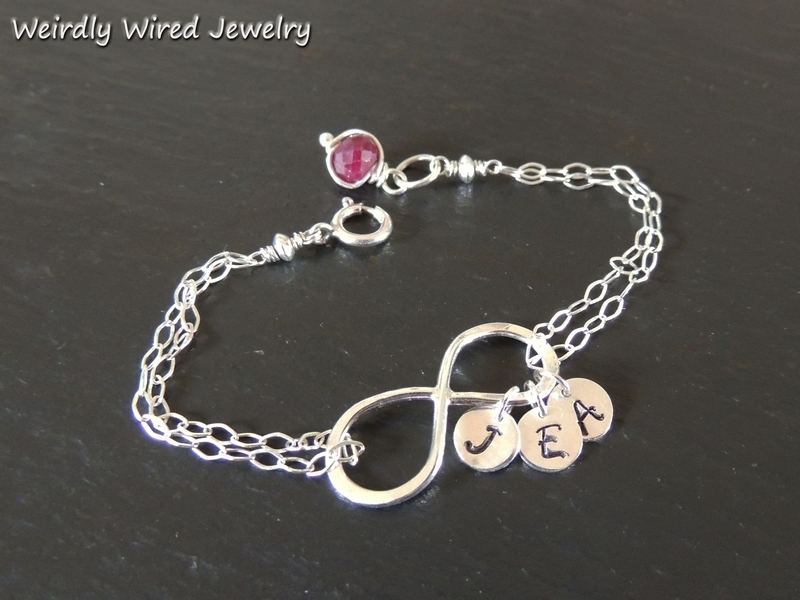 Infinity Bracelet-Stamped Charms/Birthstones - send email. 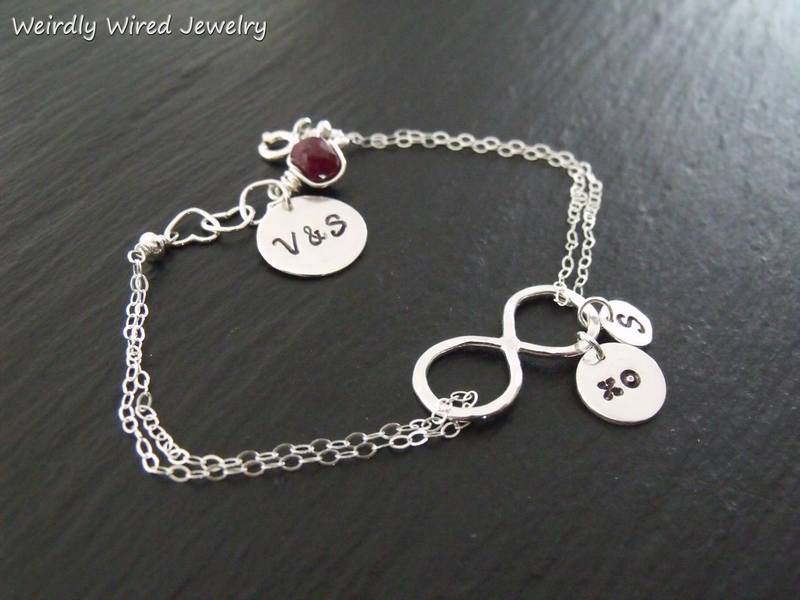 Infinity Bracelet with Initials and Birthstones - send email. 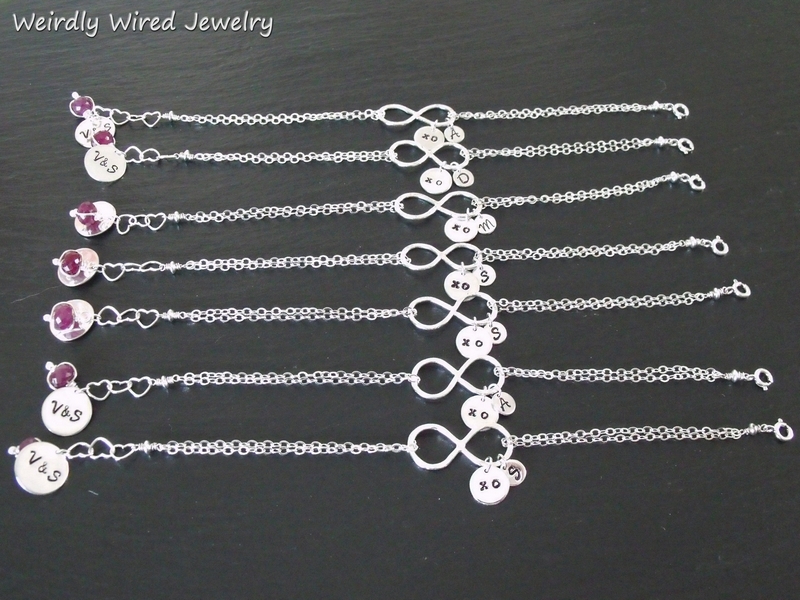 Mothers Infinity Bracelet with Stamped Charms - send email. 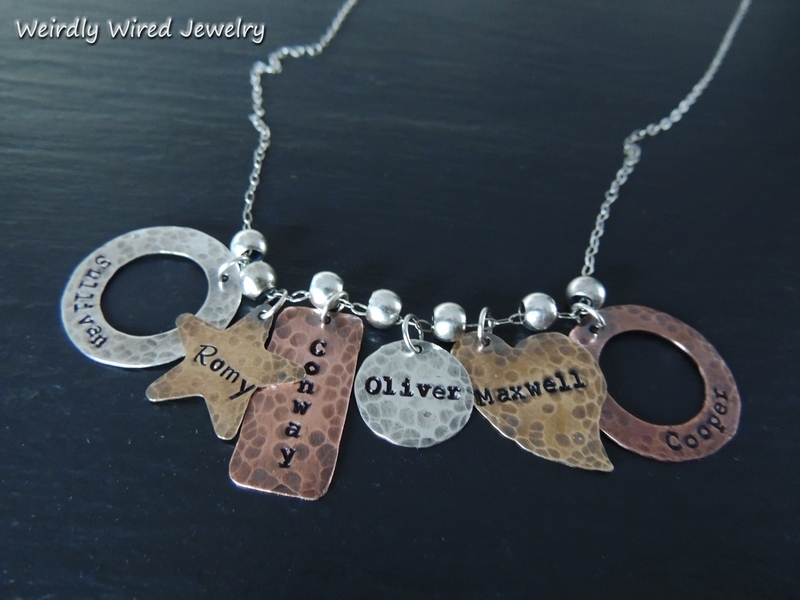 Stamped Grandmothers Necklace 6 Names - send email. 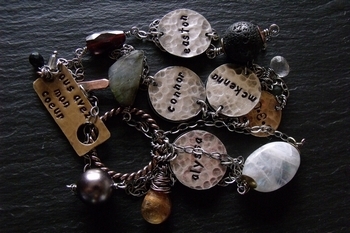 Grandmothers Necklace - Five Names - send email. tamped Washer Pendant-Labradorite - send email. 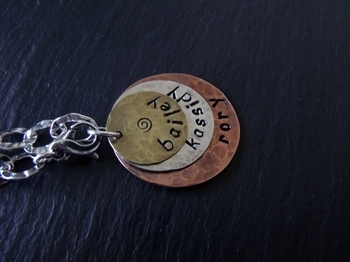 Stamped Mothers Pendant with birthstones and spirals - send email. Stamped Sterling Cuff-Ruby Bouquet - send email. Sterling Bracelet Aquamarine Charm - send email. 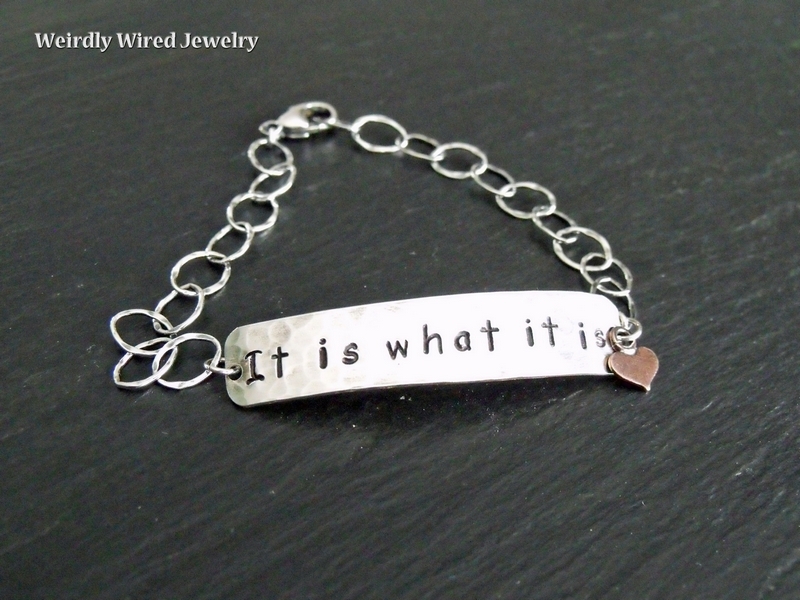 It is what it is stamped light bracelet - send email. 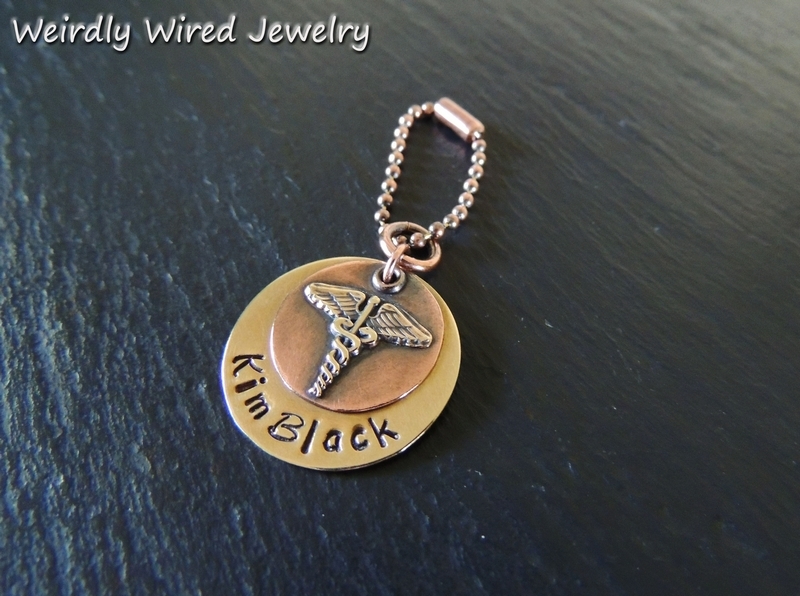 Stamped Nurse Charm - send email. Mothers Necklace with Baby Feet - send email. 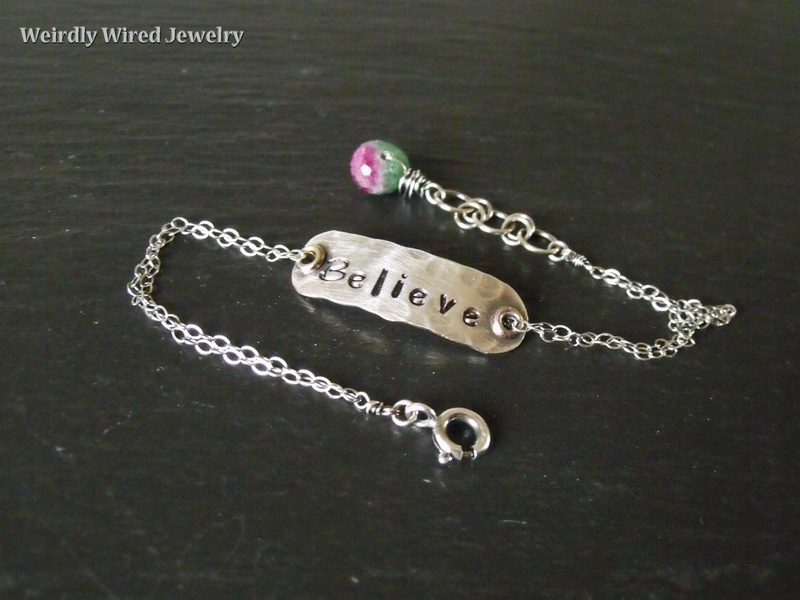 Light Weight Sterling Stamped Bracelet - send email. Sterling Cuff Labradorite Charm - send email. 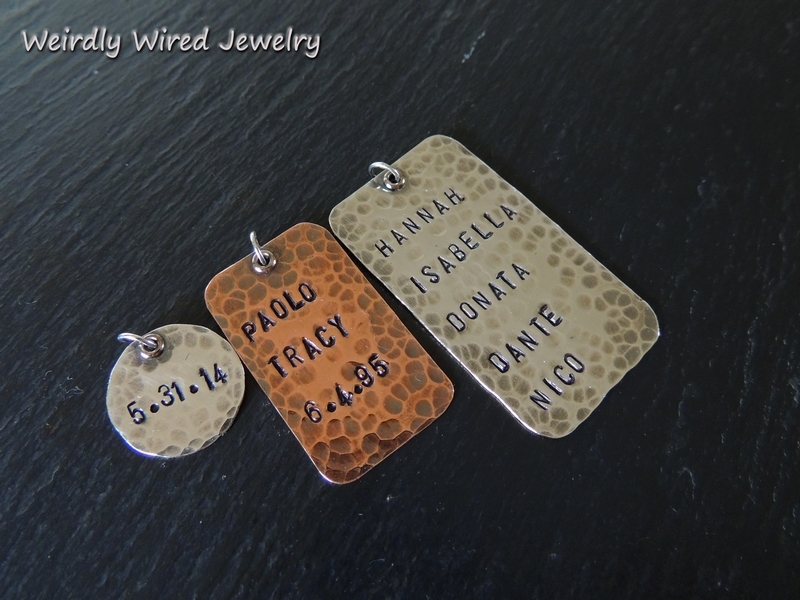 Individual Stamped Name Charm - send email. 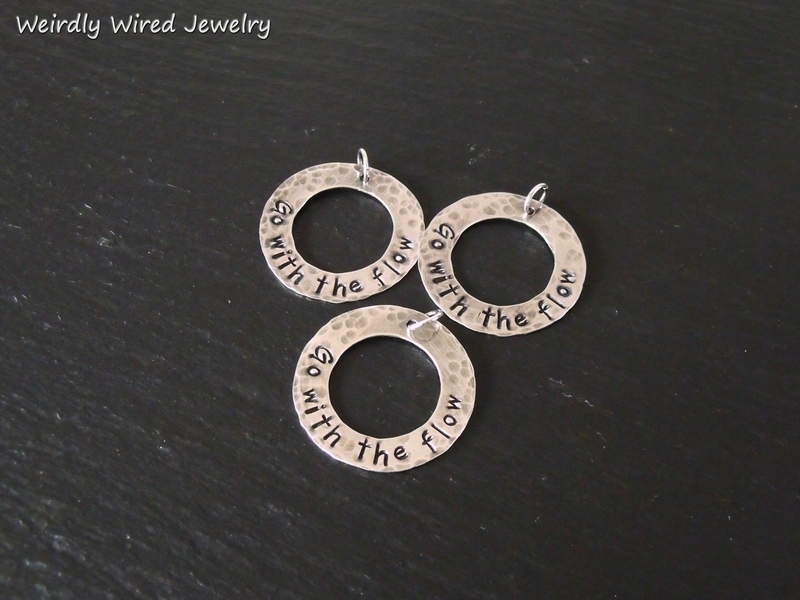 Go with the flow stamped washer - send email. Sterling Stamped Cuff Bracelet - send email. Nurse's Stethoscope Marker - send email. 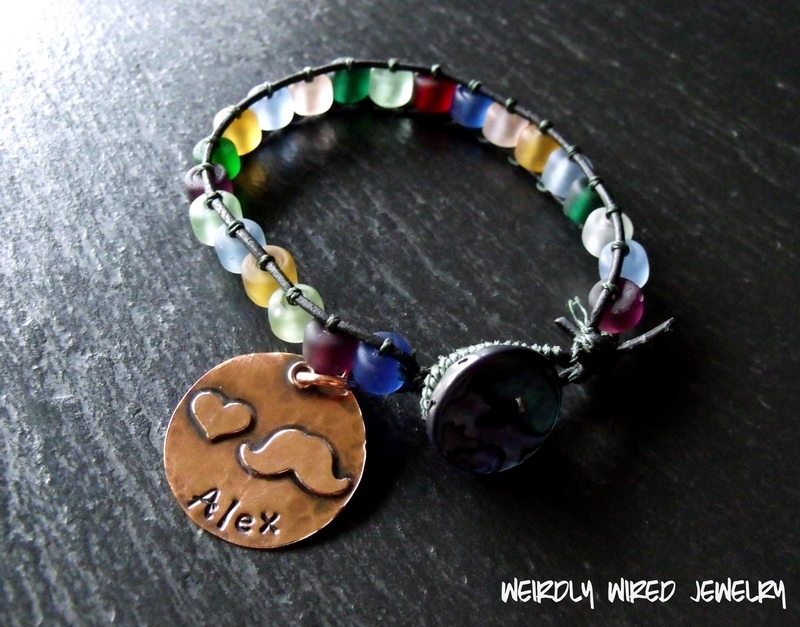 Leather Wrap Bracelet with Moustache Charm - send email. 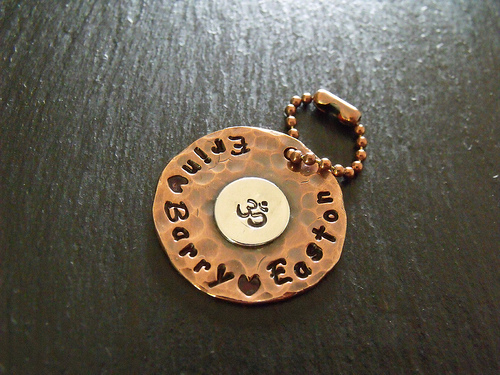 Stamped Copper Golf Marker - send email. 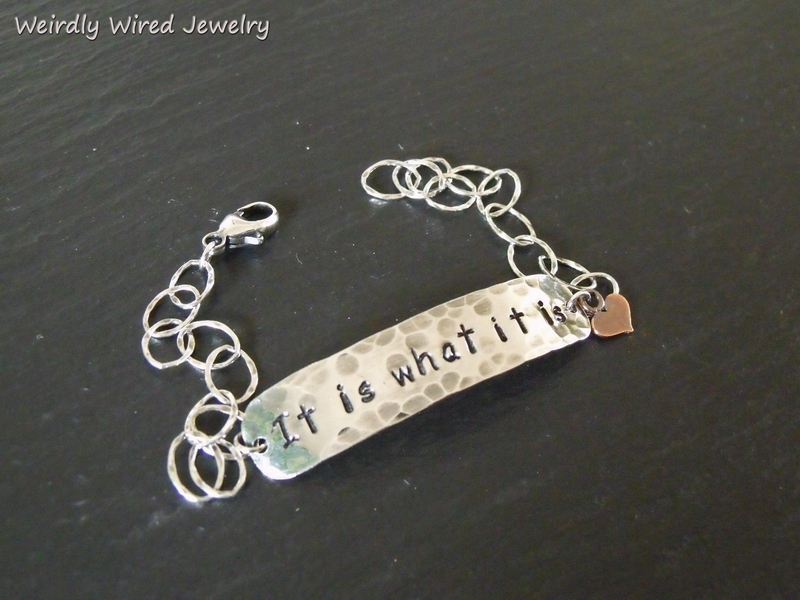 It is what it is light bracelet - send email. Heart Moustache Necklace - send email. 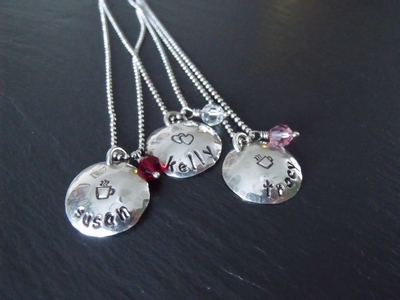 Stamped and Domed Mothers Necklace with Swarovski - send email. 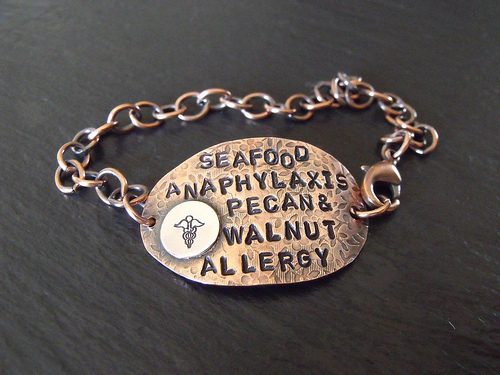 Three Line Stamped Medical Alert Bracelet - send email. Silver Washer stamped with two names - send email. 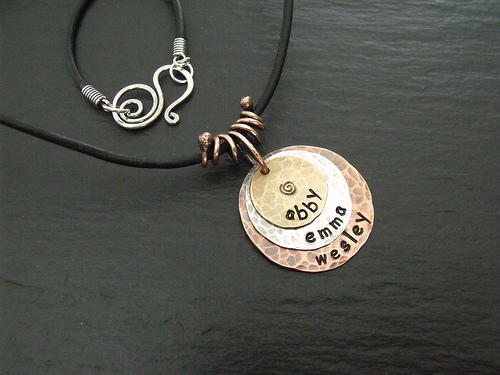 Stamped Sterling Disc with Copper Flower - send email. Ranch Brand Necklace - send email. Sinlge Wrap Leather Bracelet wit Message - send email. 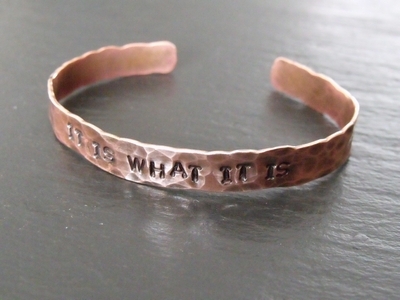 It is what it is Copper Cuff Set - send email. 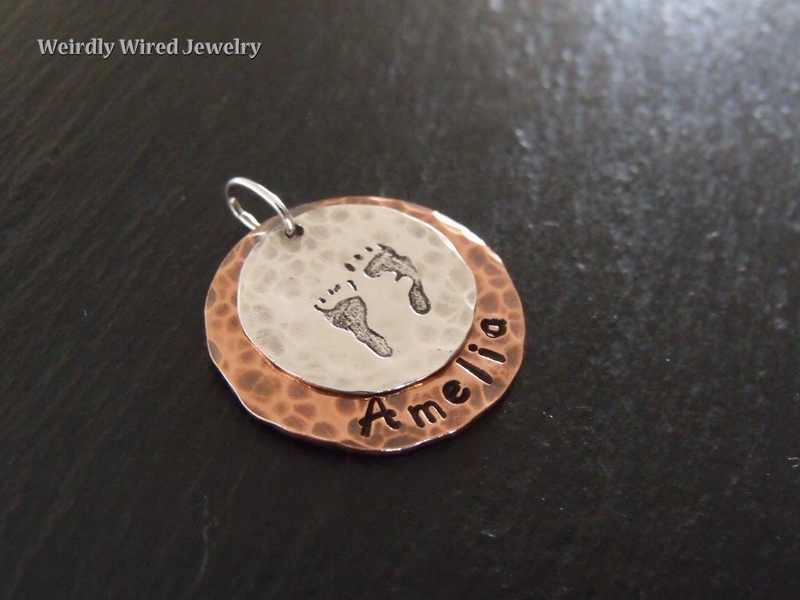 Mother's Remembrance Necklace with Baby Feet - send email. 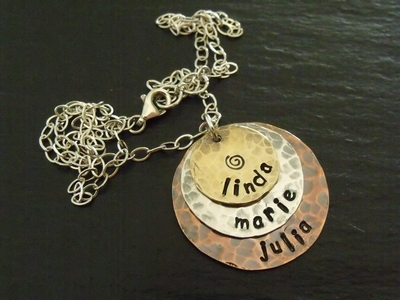 Stamped Mother's Necklace-Riveted - send email. 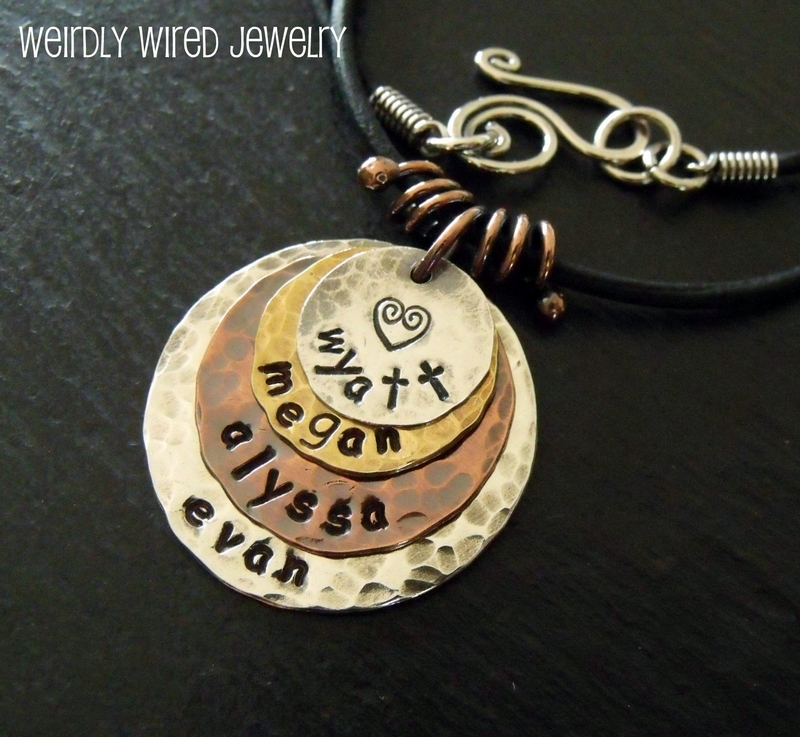 Stamped Washer Remembrance Necklace - send email. Heart and Flower Stamped Bracelet with Ruby - send email. 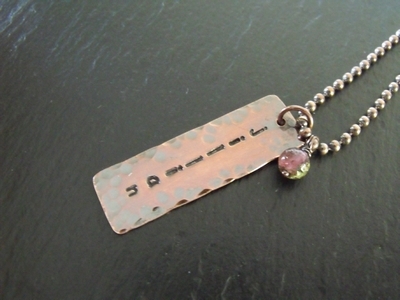 Stamped Copper Mother's Necklace with Birthstones - send email. 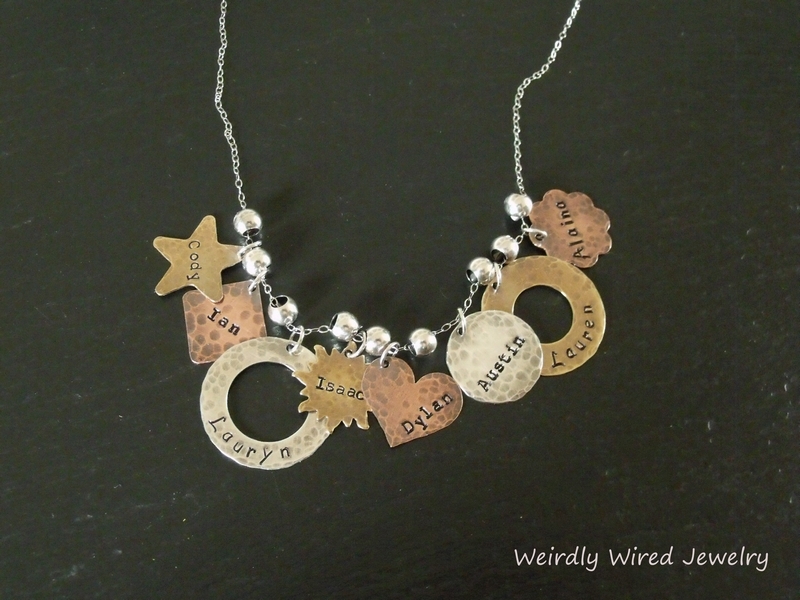 Mixed Metals and Shapes Stamped Grandmother's Necklace - send email. Sterling Brass Copper layered Necklace - send email. 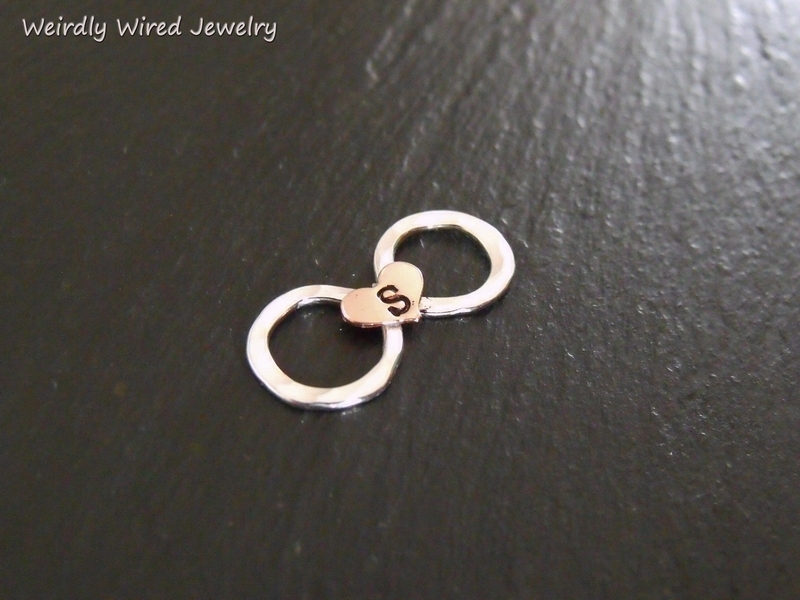 Stamped Sterling Washer with Swarovski - send email. Names, Dates and Stones Stamped Washer - send email. 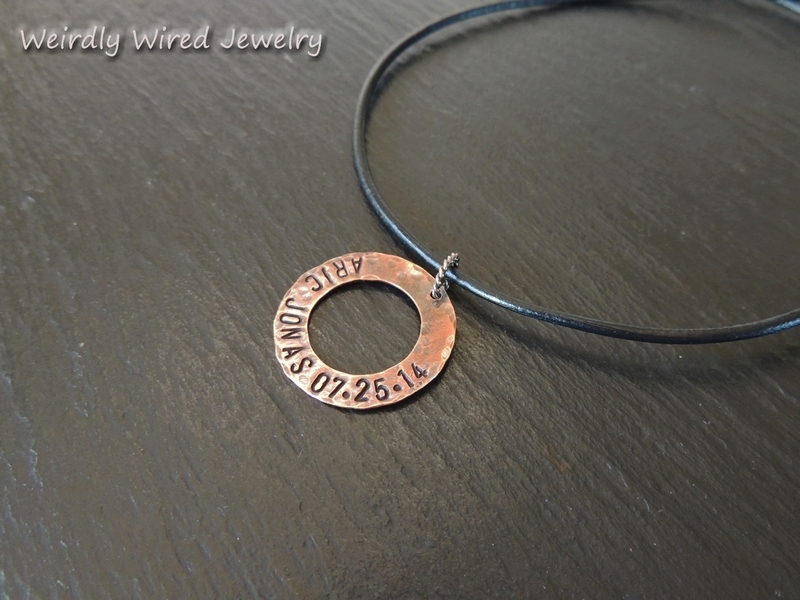 Stamped Copper Washer with Ruby - send email. 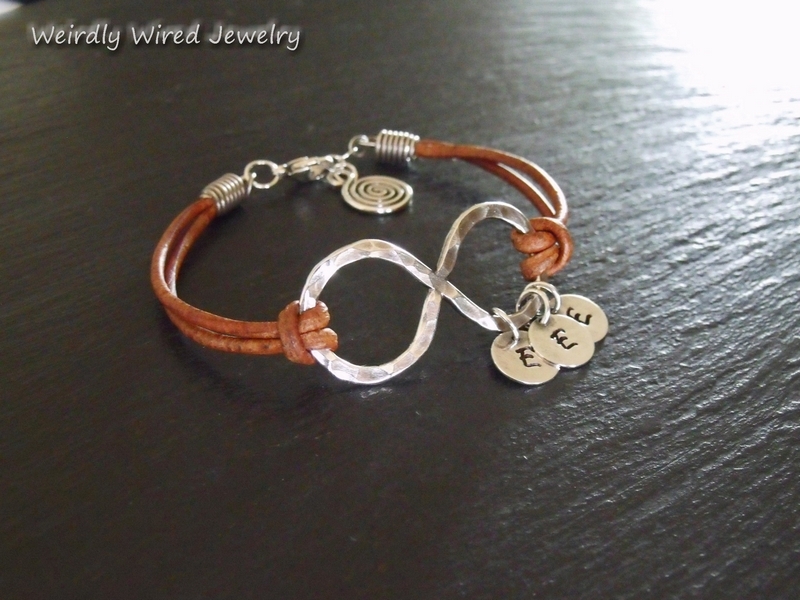 Two Stamped Hearts Bracelet - send email. 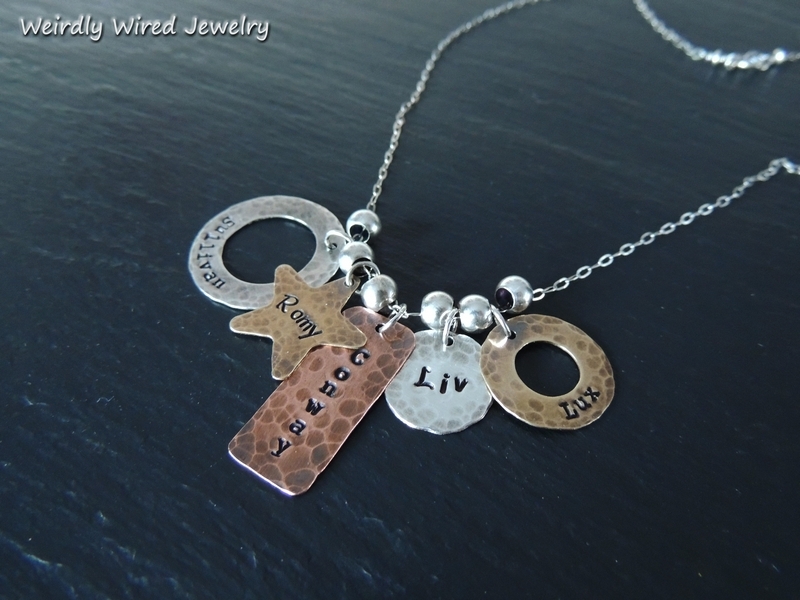 Layered Stamped Mixed Metal Necklaces-Grady Girls! - send email. 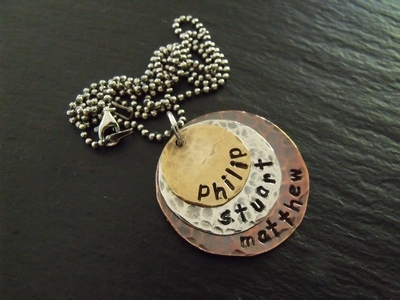 Three Layer Stamped Pendant - send email. 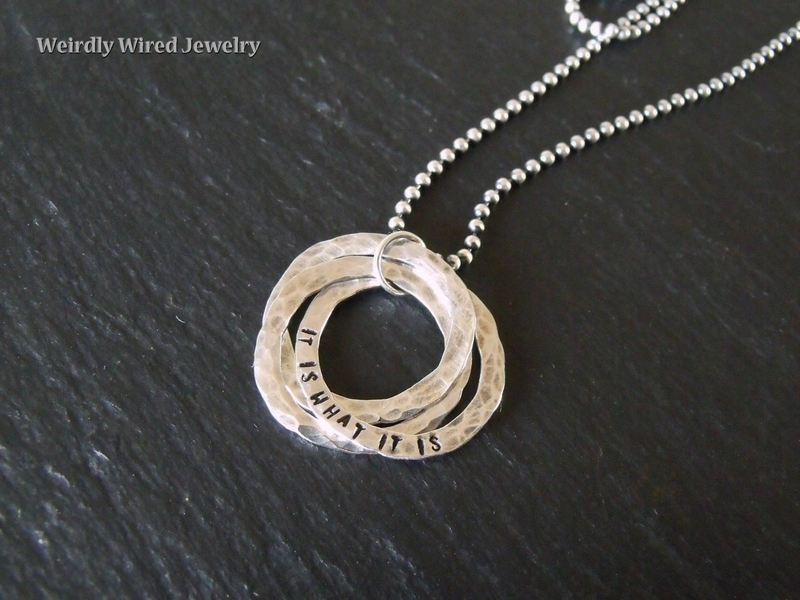 Stamped Sterling Washer's Necklace-Kim - send email. 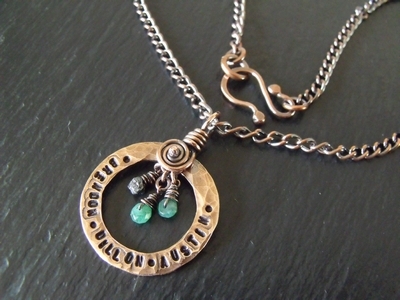 Copper Washer Mother's Necklace with Aquamarine - send email. 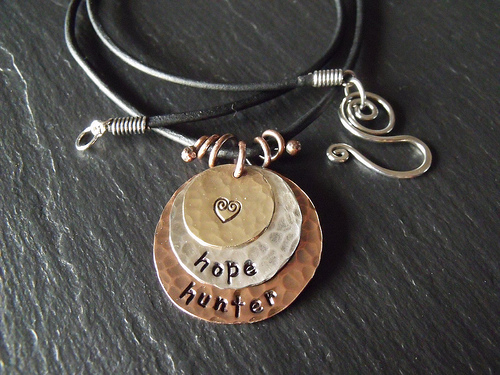 Stamped Copper Washer's Necklace-Dan - send email. 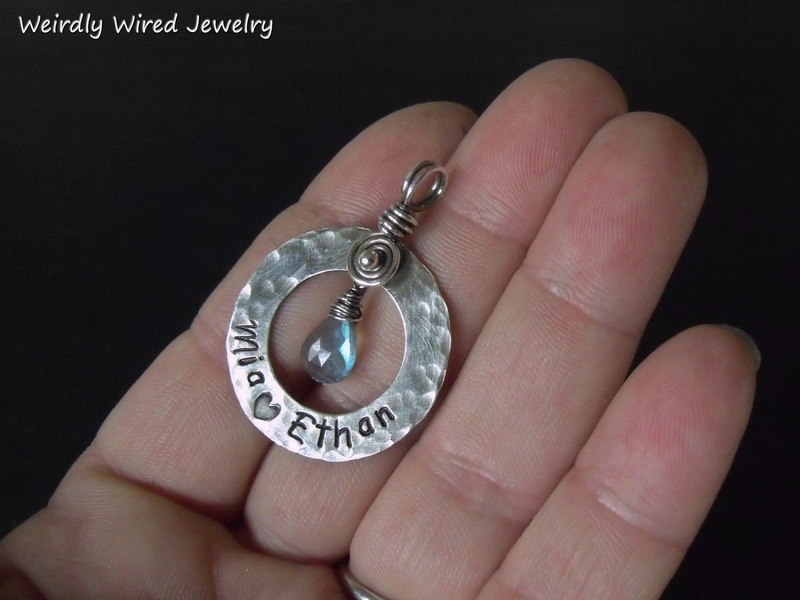 Mixed Metal Mother's Pendant with Swarovski - send email. Sterling Washer Pendant with Labradorite - send email. 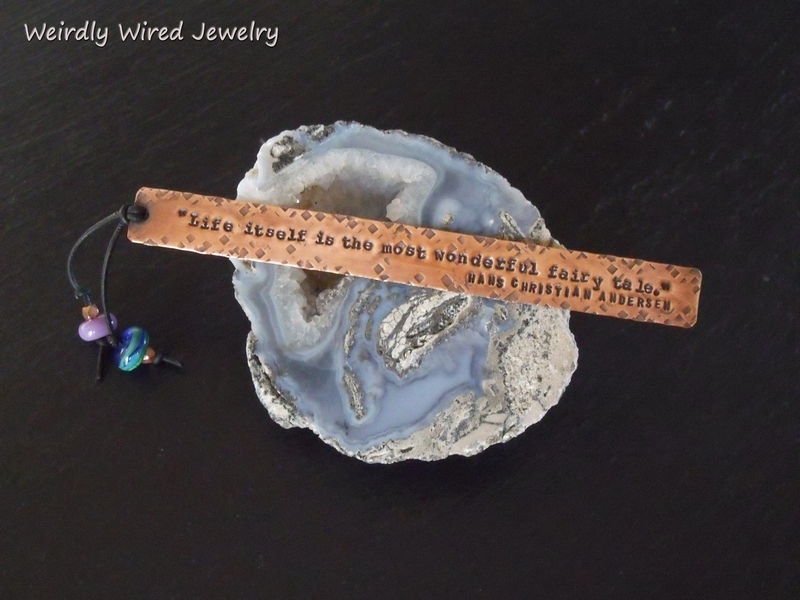 Well behaved women rarely make history-Stamped Sterling cuff - send email. 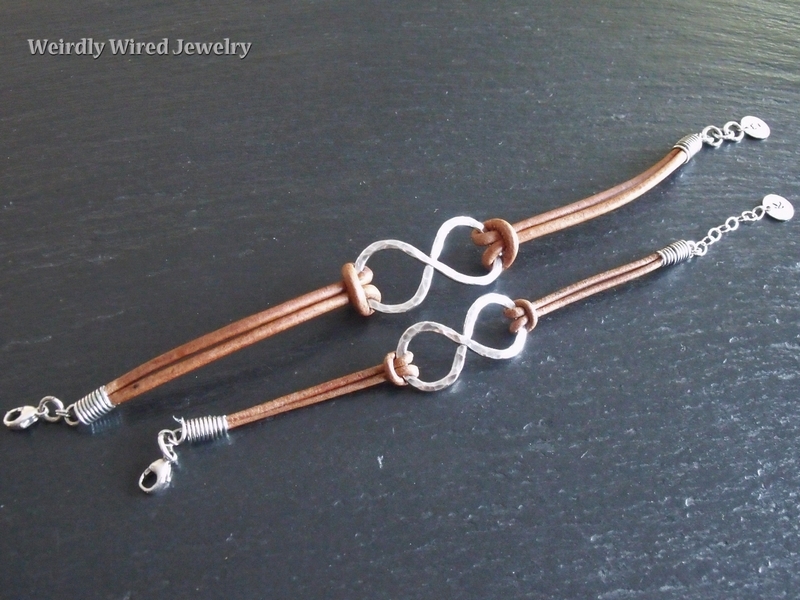 Two sided Infinity Charm Pendant - send email. 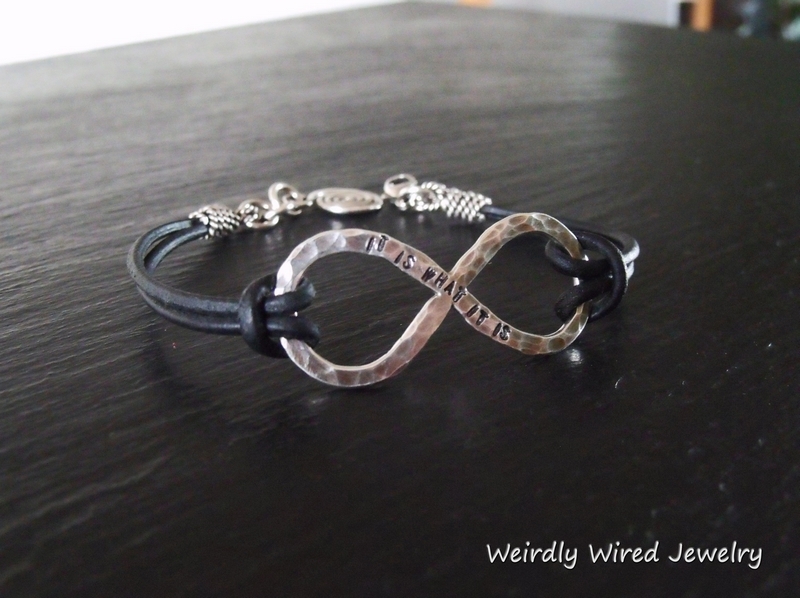 Infinity Charm-Back with Intials - send email. 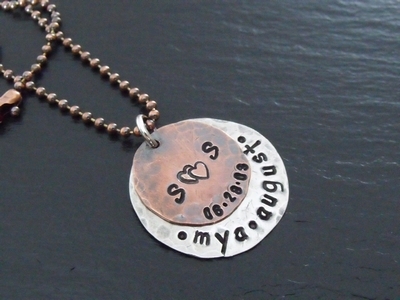 Stamped Mothers Pendant-Sarah - send email. 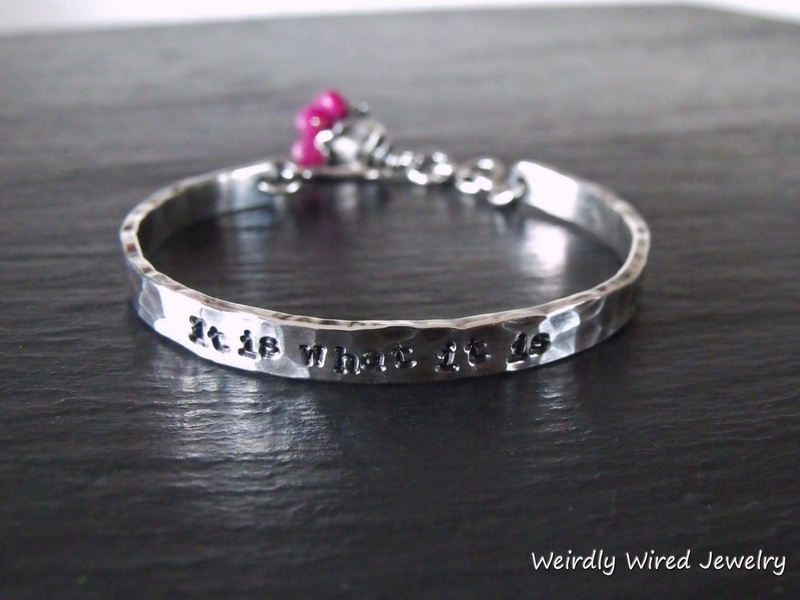 Tiny Messages Stamped Bracelet-Sterling - send email. 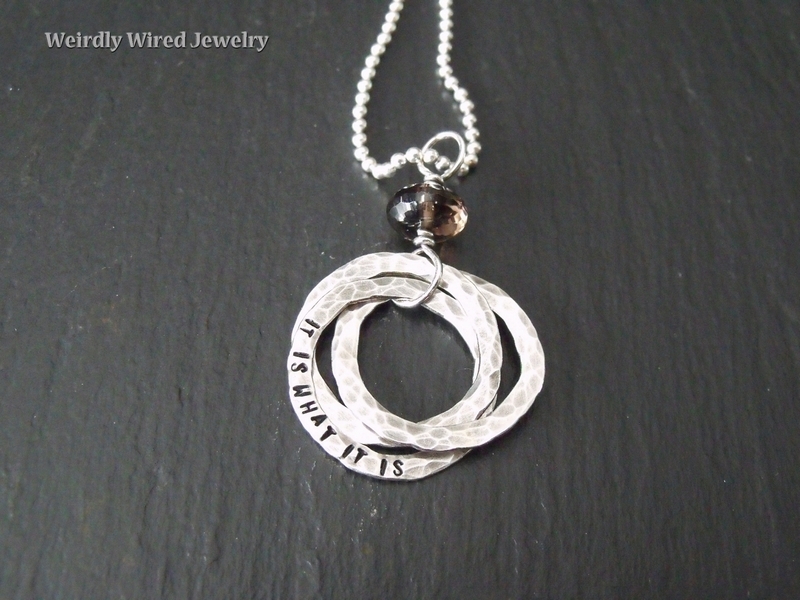 Sterling Washer Stamped Pendant Necklace - send email. 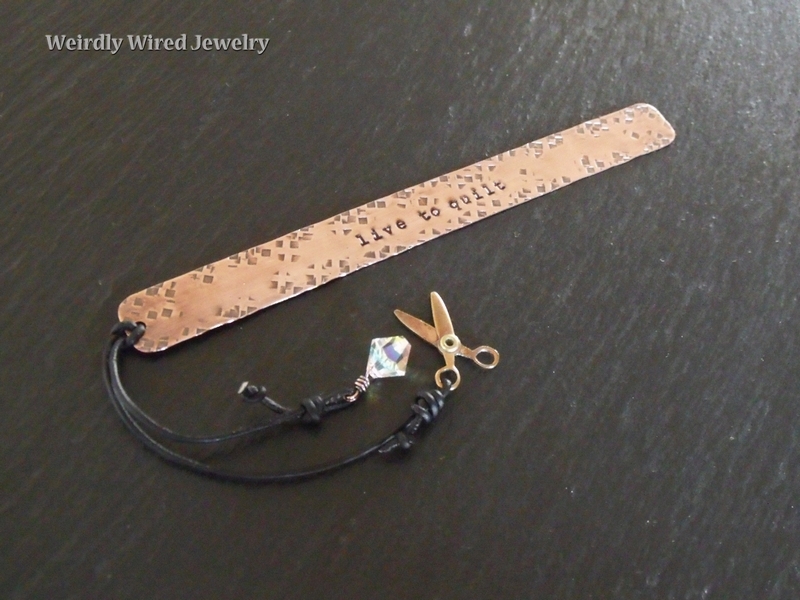 Keep Calm and Carry On Copper Bracelet - send email. Hollow Copper Heart with Turquoise - send email. Stamped Sterling Bracelet Set-Mosaic - send email. 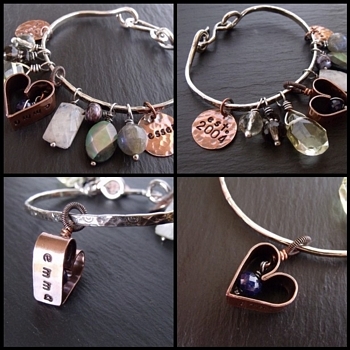 Stamped Copper Heart Bracelet - send email. Gemstone Charm Bracelet - send email. Mother's Stamped Bracelet Charm - send email. 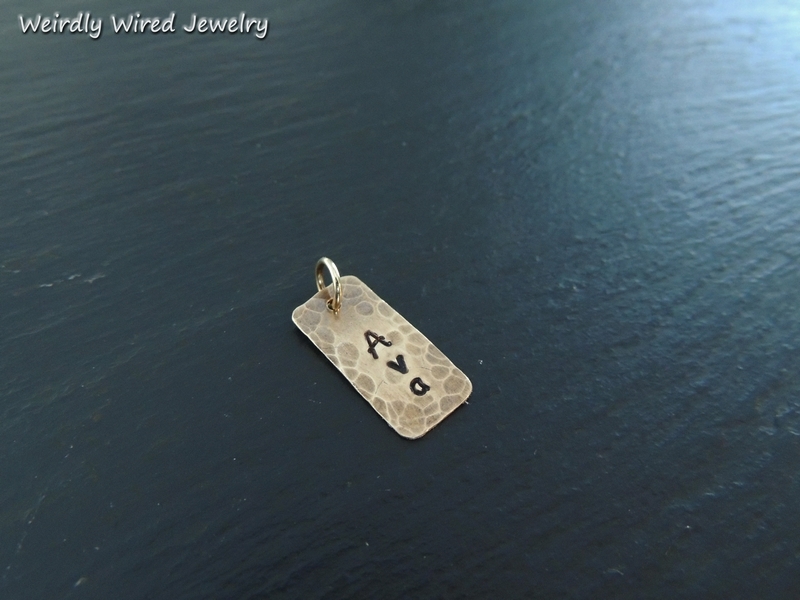 Riveted Mixed Metal Stamped Dog Tag - send email. Stamped Sterling Silver Bracelet-Amethyst Charm - send email. 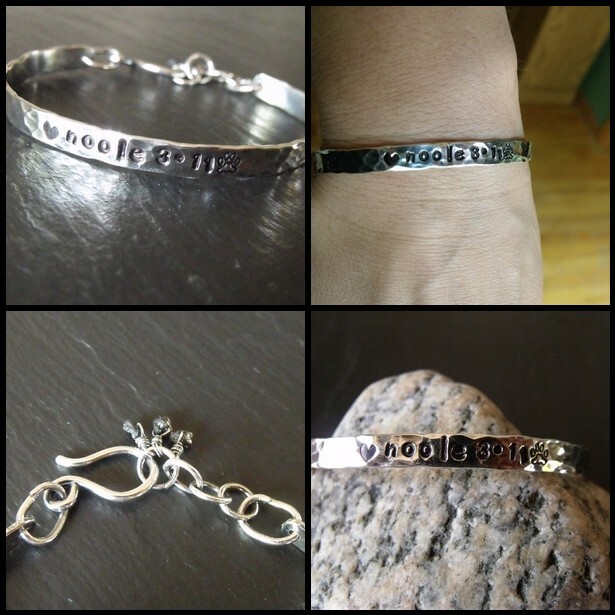 Stamped Sterling Silver Bracelets - send email. 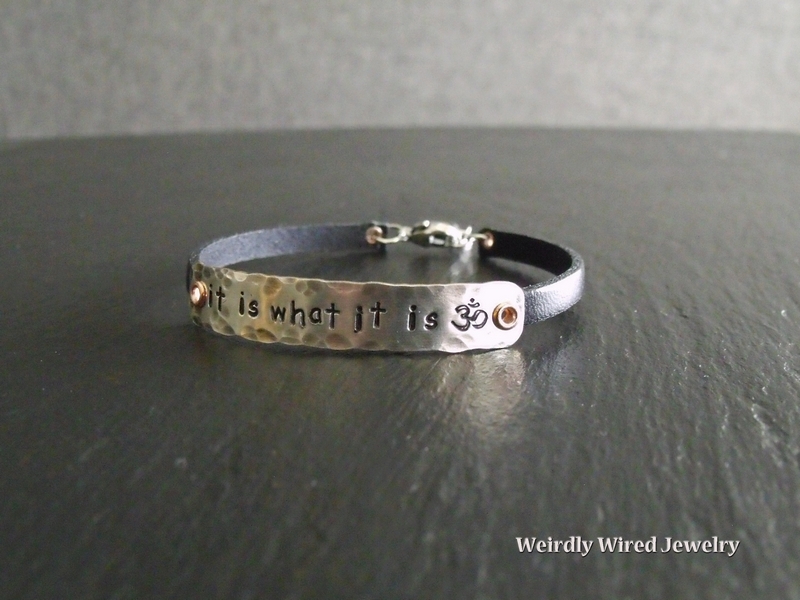 Infinity SS Bracelet-It is what it is - send email. 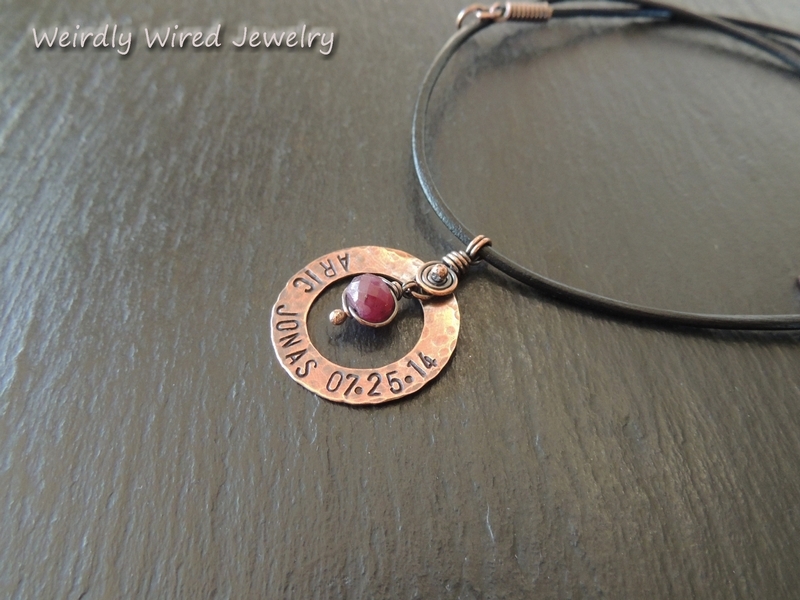 Stamped Copper Medic Alert Bracelet-Donna - send email. 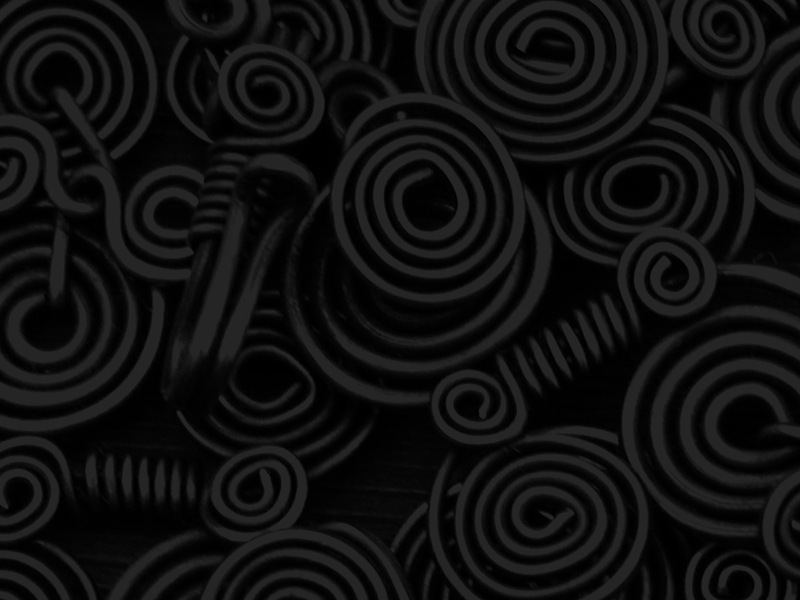 Wire Cross - Smith - send email. 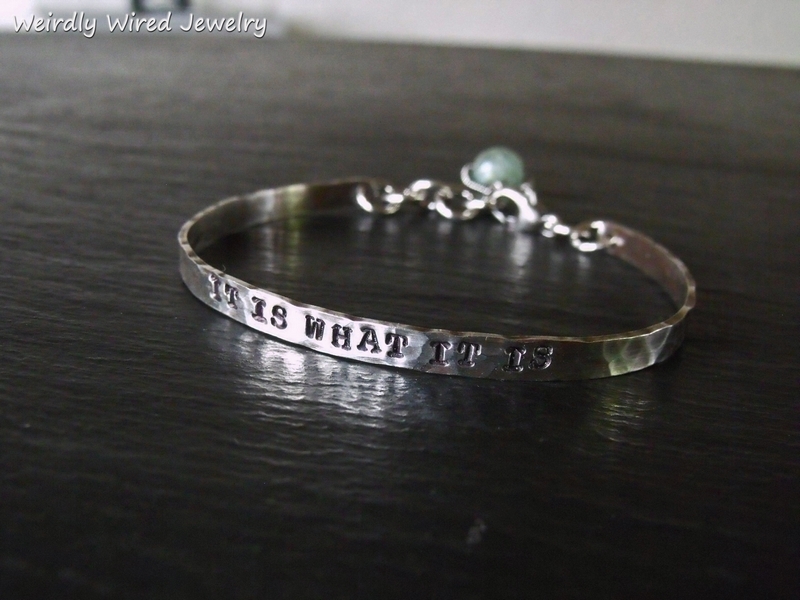 It is what it is Bracelet-Tourmaline Circle2 - send email. Magnesite Black Stone Engraved Bracelet - send email. Stamped Layered Keychains - send email. 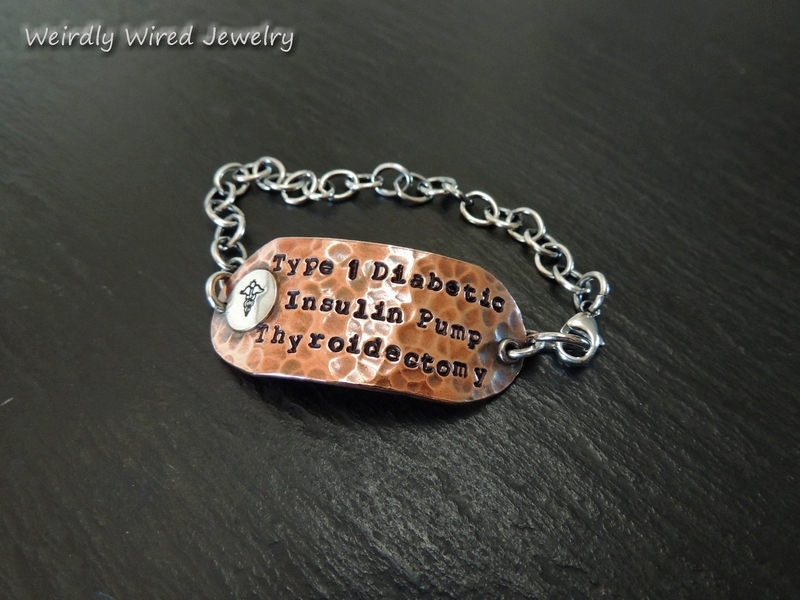 Medical Alert Stamped Charm Bracelet - send email. 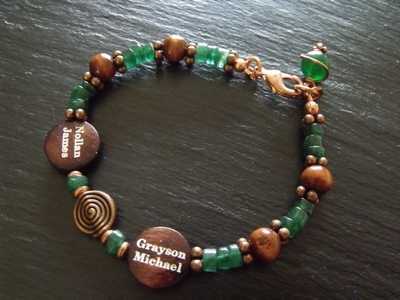 Picture Jasper Engraved Bracelet - send email. Rhodochrosite Engraved Bracelet - send email. 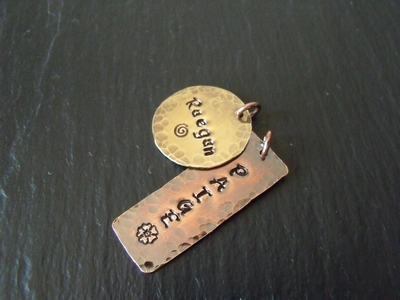 Stamped Tags-Coppers & Brass - send email. Mother's Necklace-Swarovski Birthstone Charm - send email. Mother's Necklace - Kay - send email. Layered Mother's Pendant-Four Names - send email. 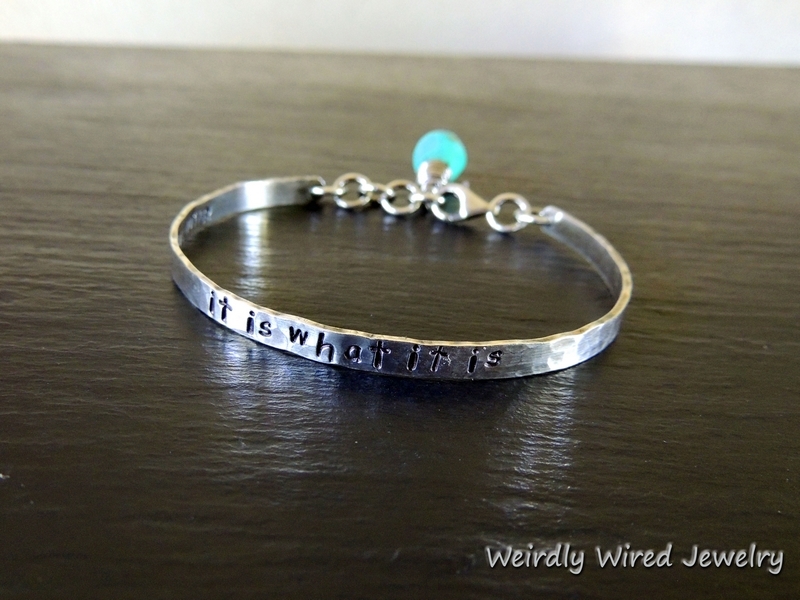 It is what it is-turquoise charm - send email. It is what it is-inside stamp detail - send email. 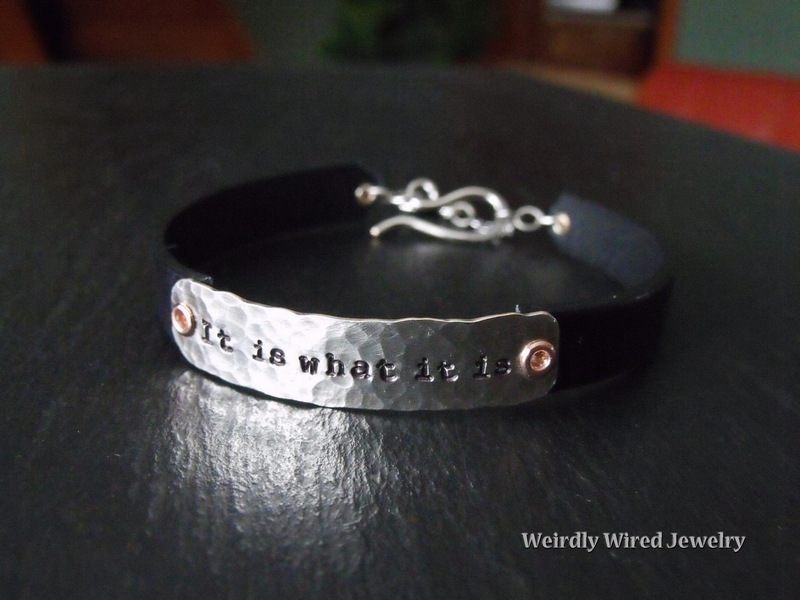 It is what it is sterling bangle - send email. Stamped Copper Washer-Aquamarine & Tourmaline - send email. Stamped Sterling Cuff-Inside stamping detail - send email. Stamped Sterling Cuff-Block Uppercase - send email. 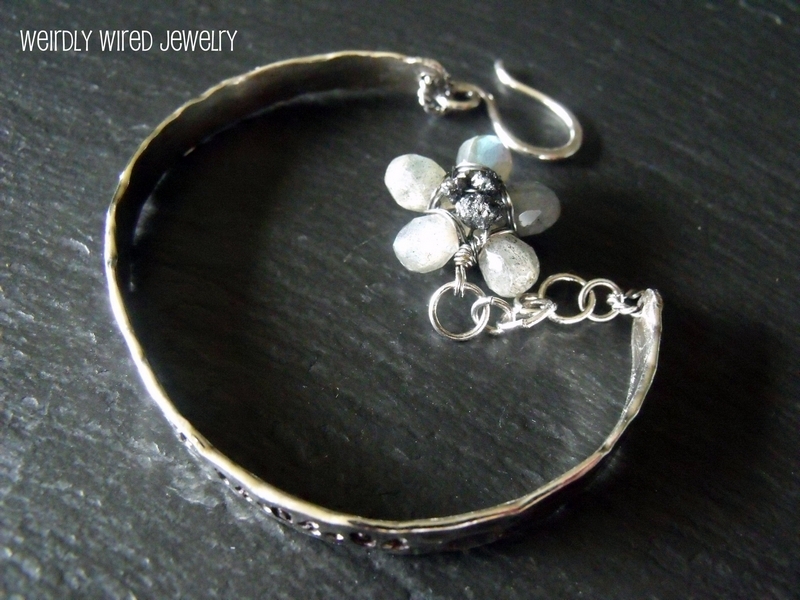 Sterling Cuff Bracelet-Aquamarine Charm - send email. 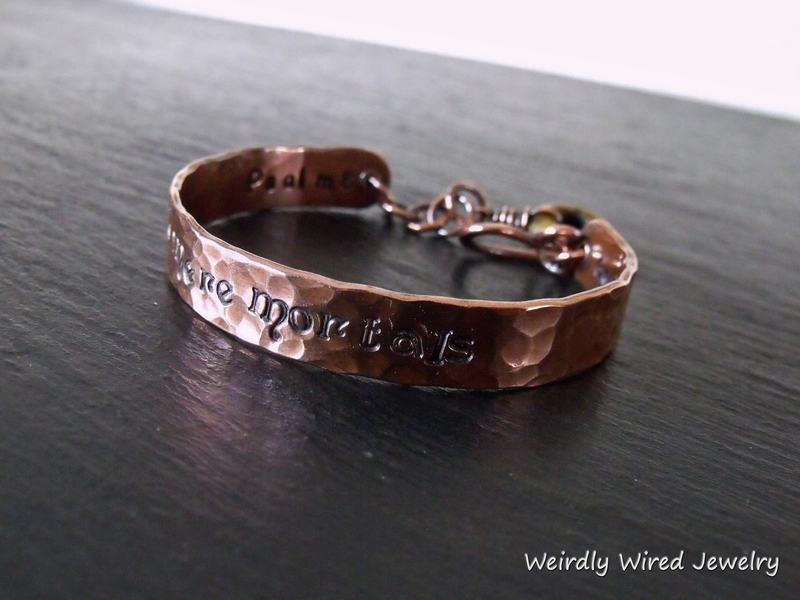 Copper Cuff Bracelet-Stamped - send email. Sterling Cuff Bracelet-Sapphire Charm - send email. 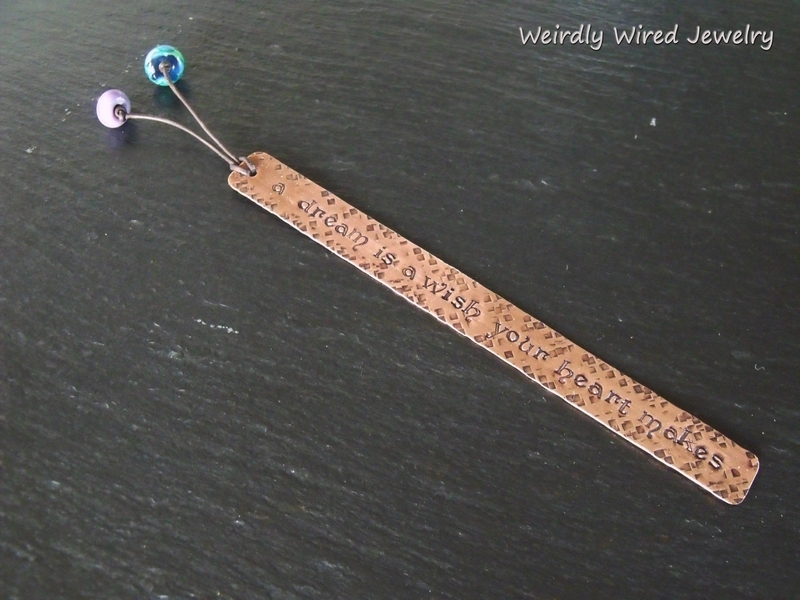 Love knows no distance bracelet - send email. 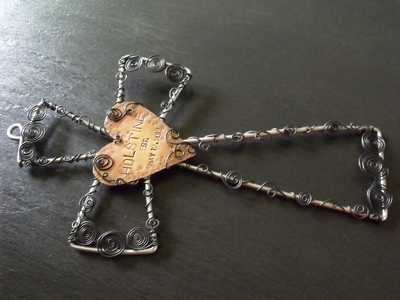 Wire Wall Cross-Mulek - send email. Mother's Bracelet-Stamped Charms - send email. Stamped Necklace & Earrings Set - send email. Stamped Earrings - send email. Custom Wired & Stamped Cross-Gesser - send email. 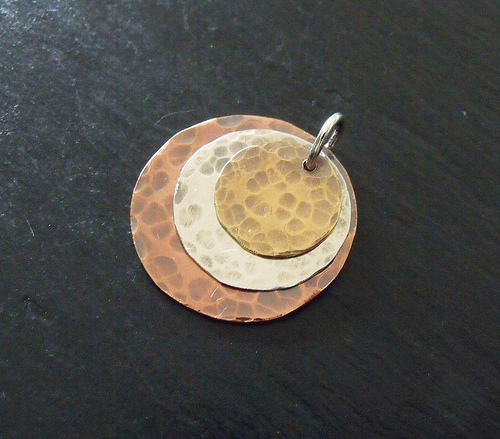 Stamped Sterling & Brass Pendant - send email. Stamped Mother's Pendant - send email. 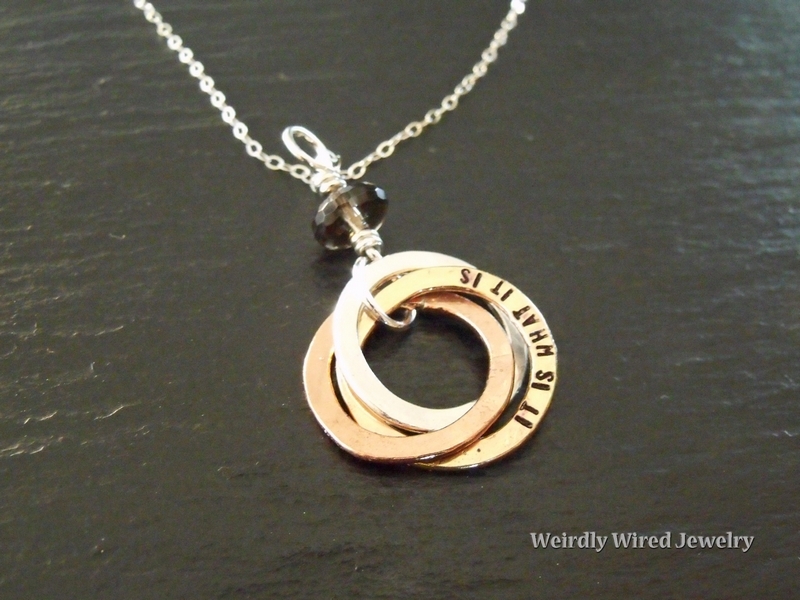 Mother's Birthstone Necklace-Twisted Copper - send email. Custom Wire and Stamped Cross-Olson - send email. 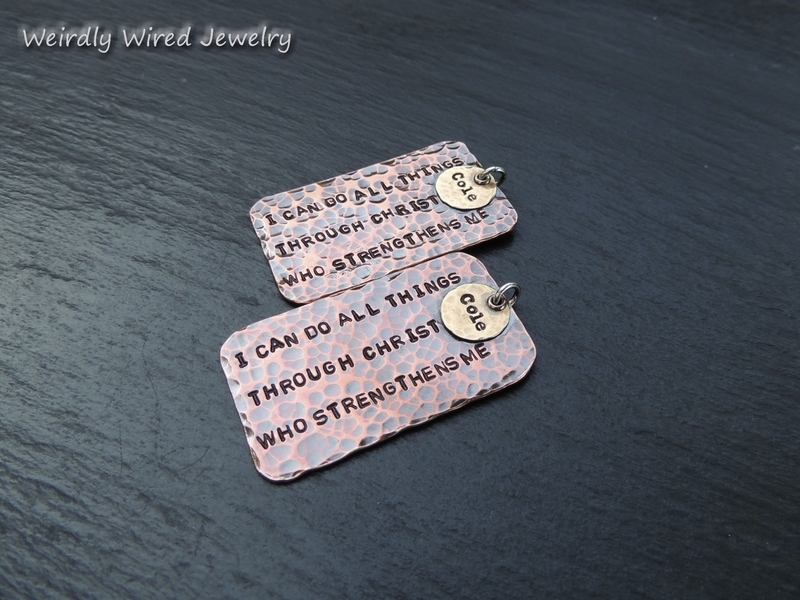 Custom Wire and Stamped Cross-Chonis - send email. 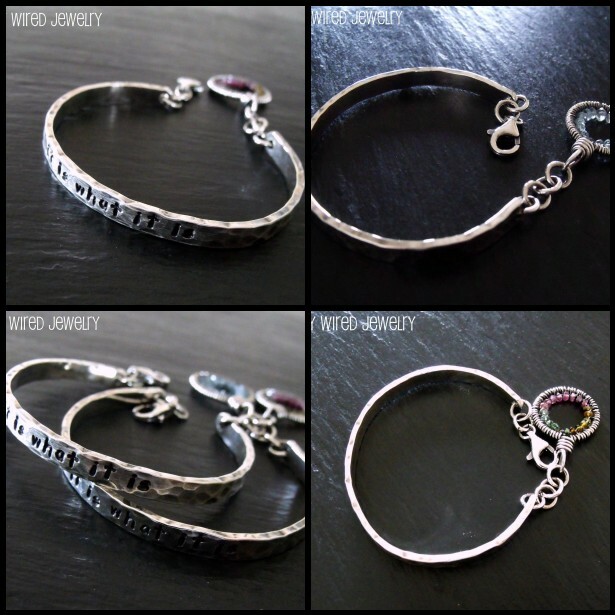 Stamped Sterling Cuff w/Rainbow Tourmaline - send email. 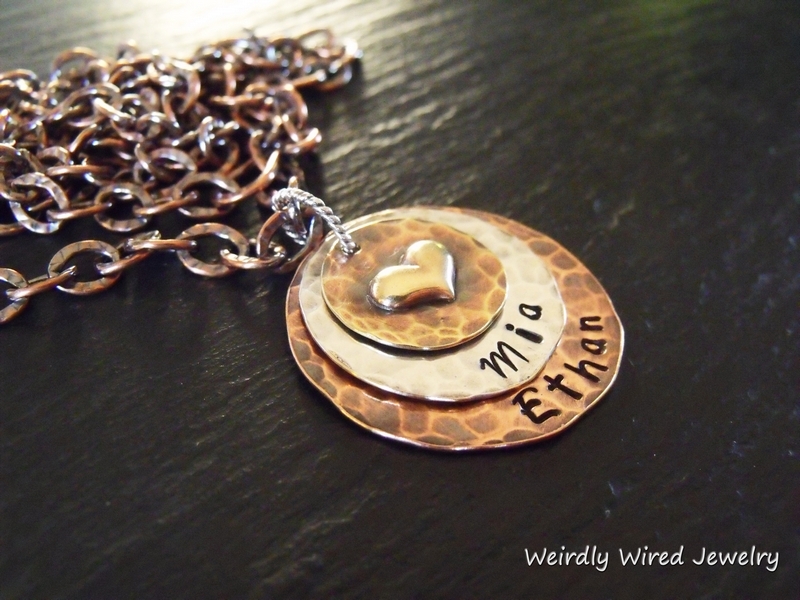 Custom Mother's Stamped Pendant Necklace - send email. Four Disc Stamped Pendant - send email. Symbols Sampler - send email. 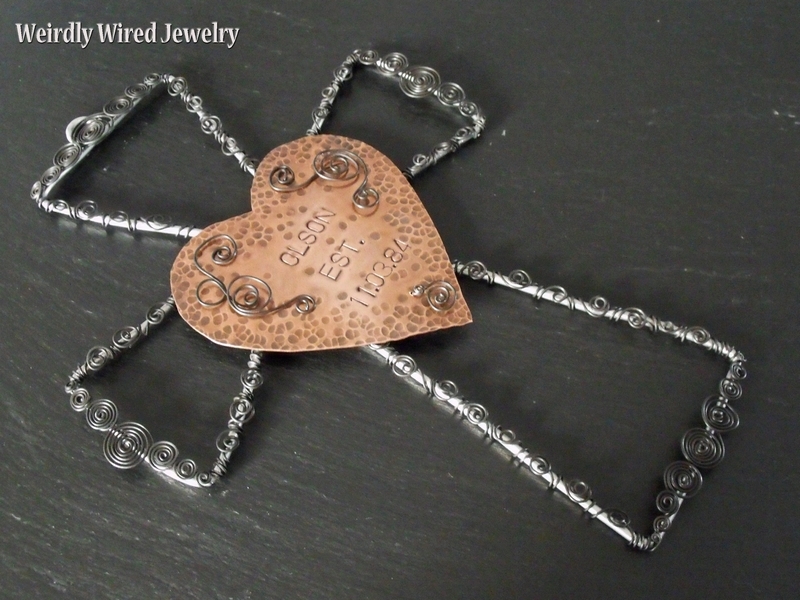 Custom Stamped Wire Cross - send email. 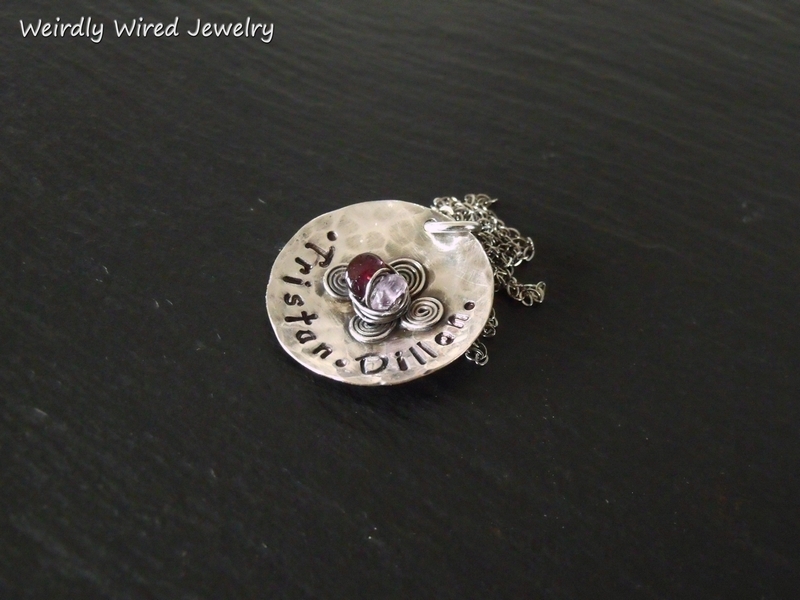 Stamped Pendant with Birthstones-Jana - send email. 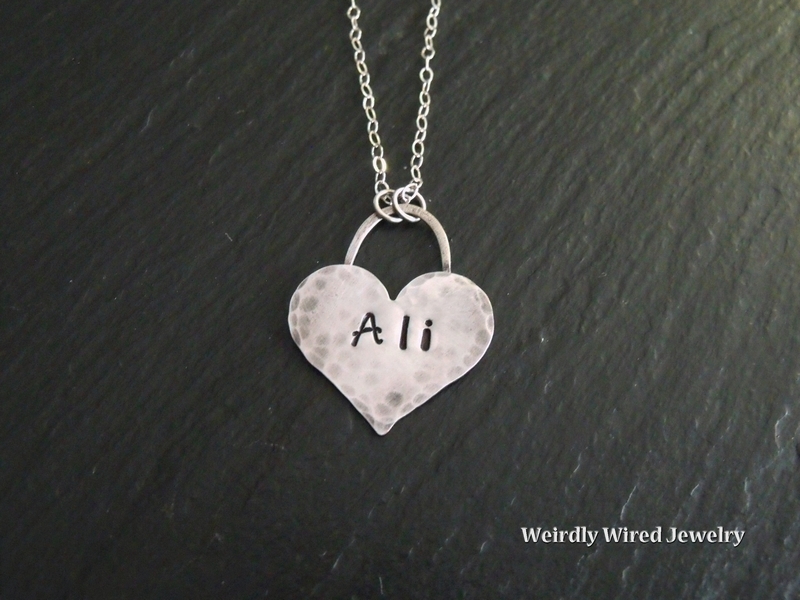 Stamped Remembrance Necklace - send email. Mixed Metal Pendant-Blank - send email. Stamped Mixed Metal Keychain - send email. 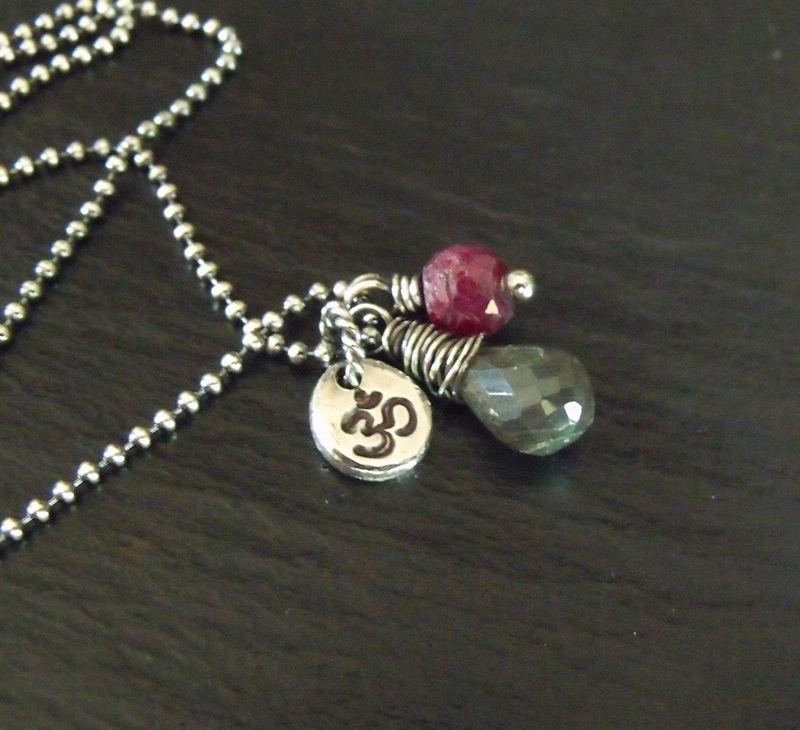 Sterling Silver Ohm Necklace - send email. Engraved Mother's Bracelet-Jade - send email. 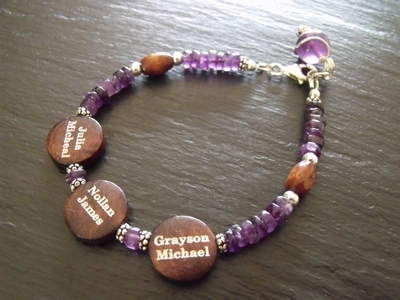 Engraved Mother's Bracelet-Amethyst - send email. 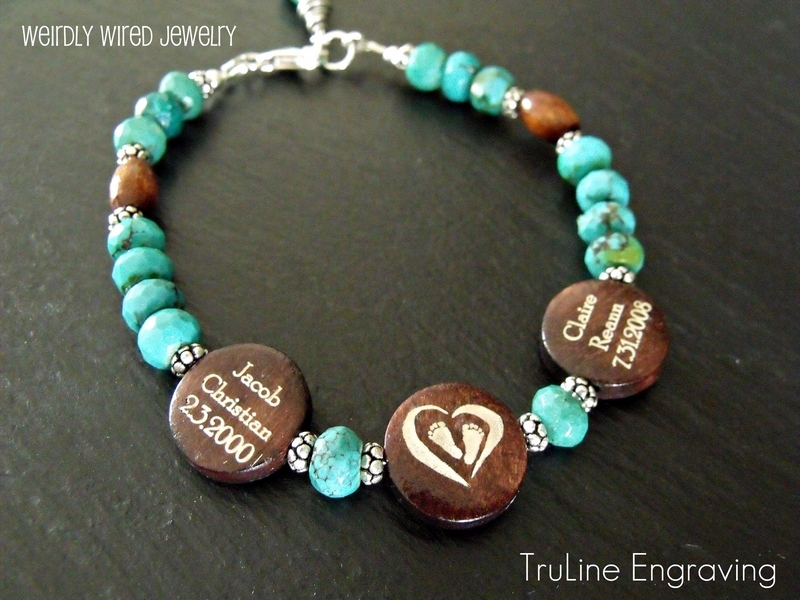 Engraved Mother's Bracelet-Turquoise and Wood - send email. 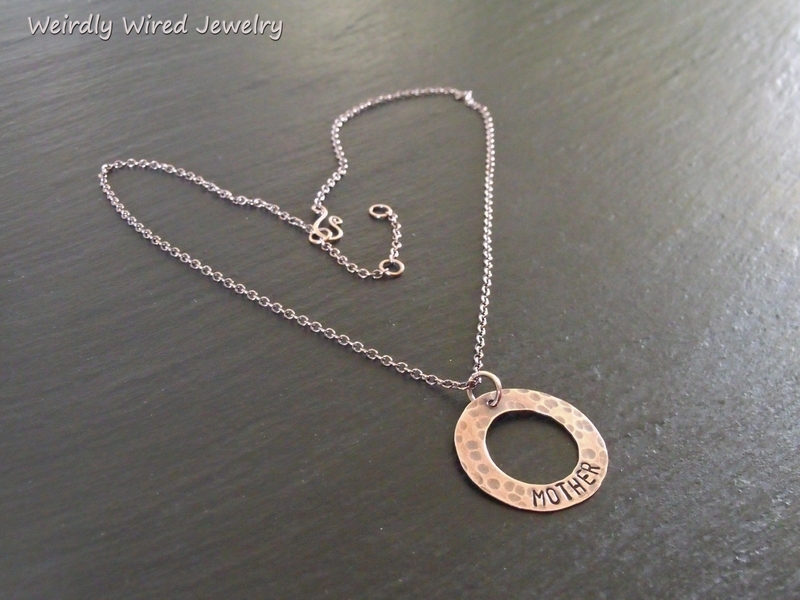 Stamped Copper Washer Mother's Necklace - send email. 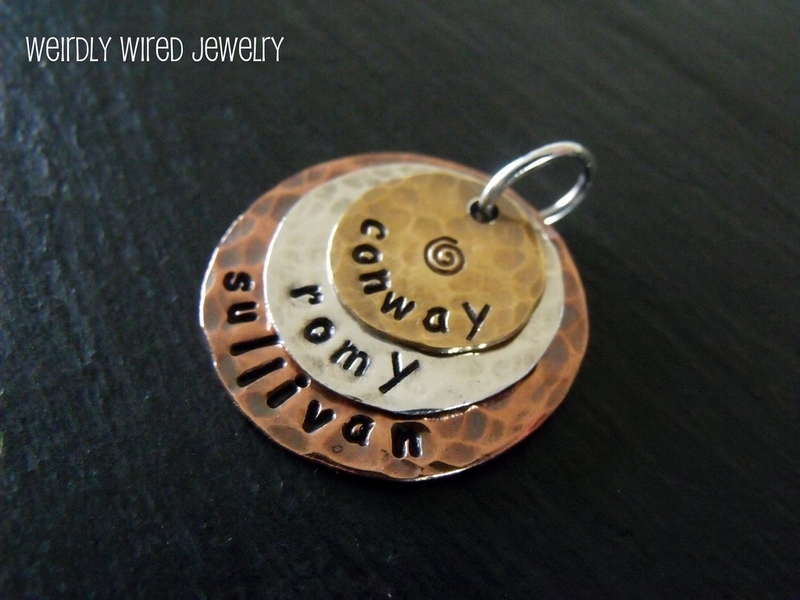 Mixed Metal Stamped Charm-Toth - send email. 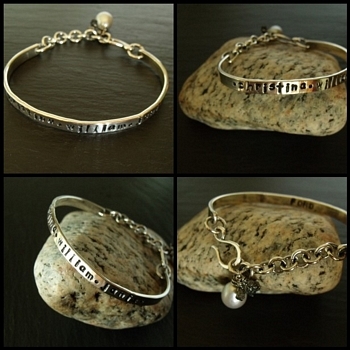 Stamped Sterling Bracelet Center - send email. 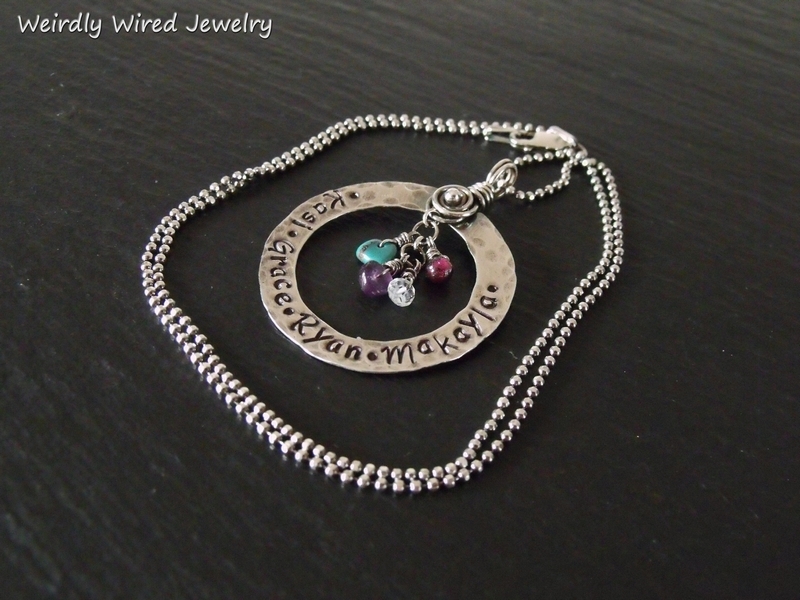 Stamped Necklace Charm with Swarovski and wired bail - send email. Stamped Sterling Cuff w/Labradorite & Black Diamonds Flower - send email. 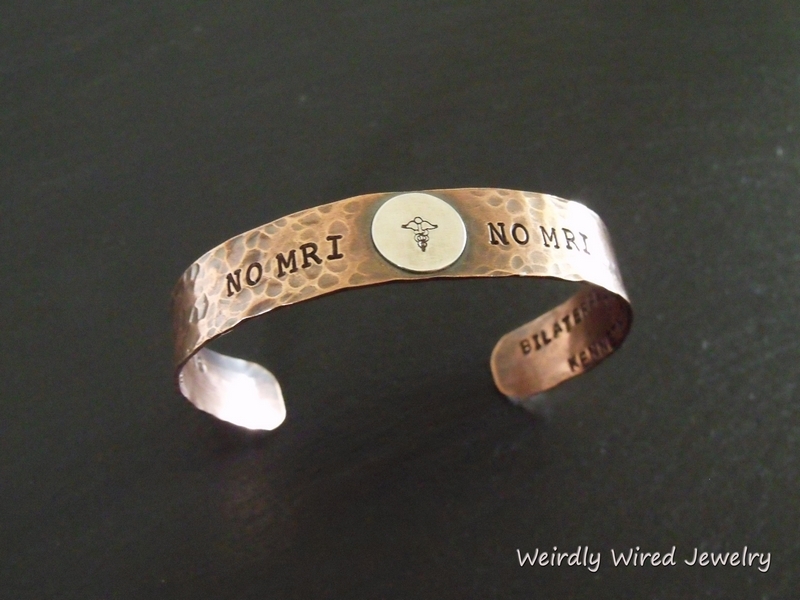 Stamped Medic Alert Copper Cuff - send email. Mixed Metal Stamped Keychain - send email. 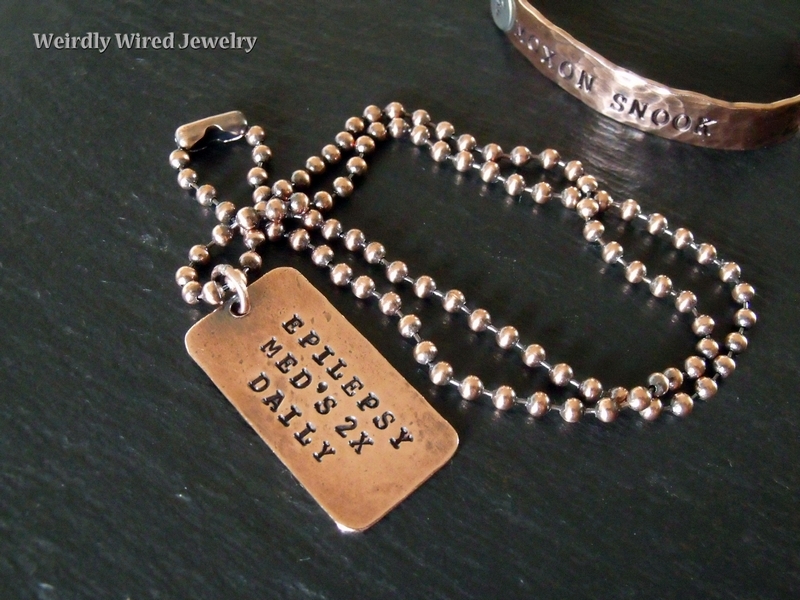 Stamped Medical Alert Bracelet - send email. Stamped Necklace Charm with Swarovski - send email. 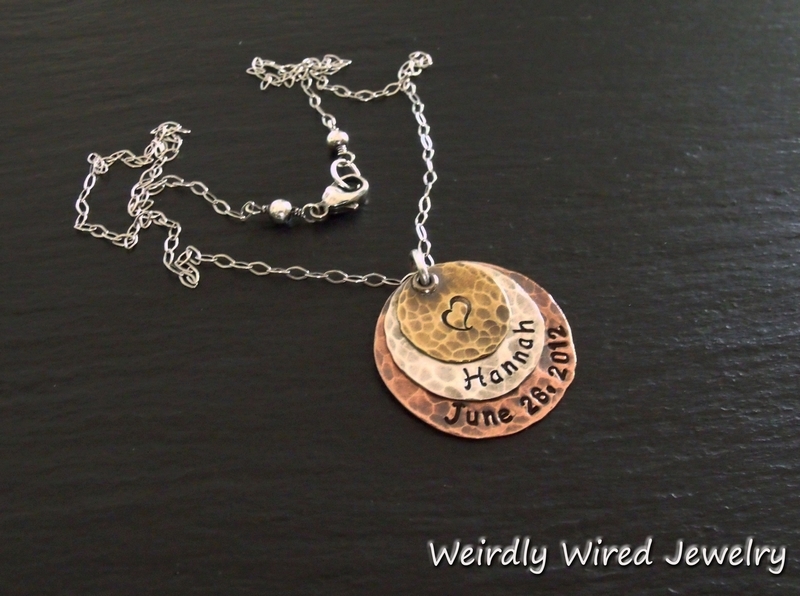 Mixed Metal Stamped Pendant with Wedding Date - send email. 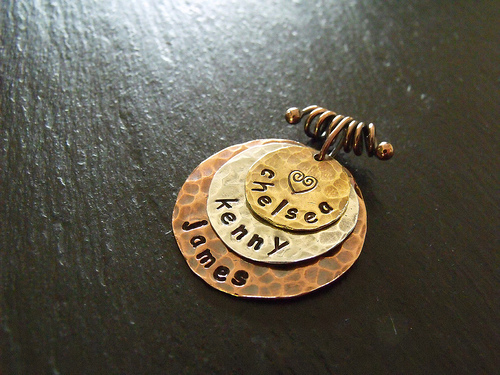 Mixed Metal Stamped Pendant-Coil Bail - send email. 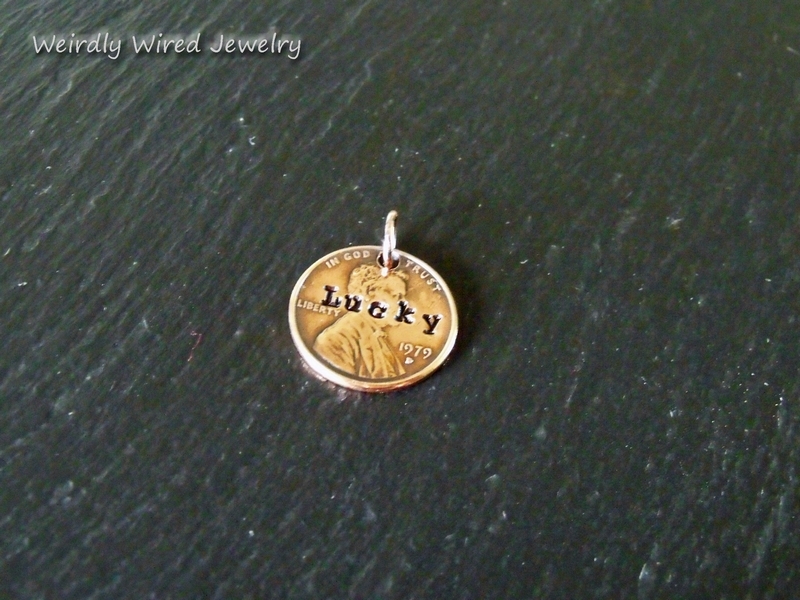 Mixed Metal Stamped Pendant-Coil Bail2 - send email. 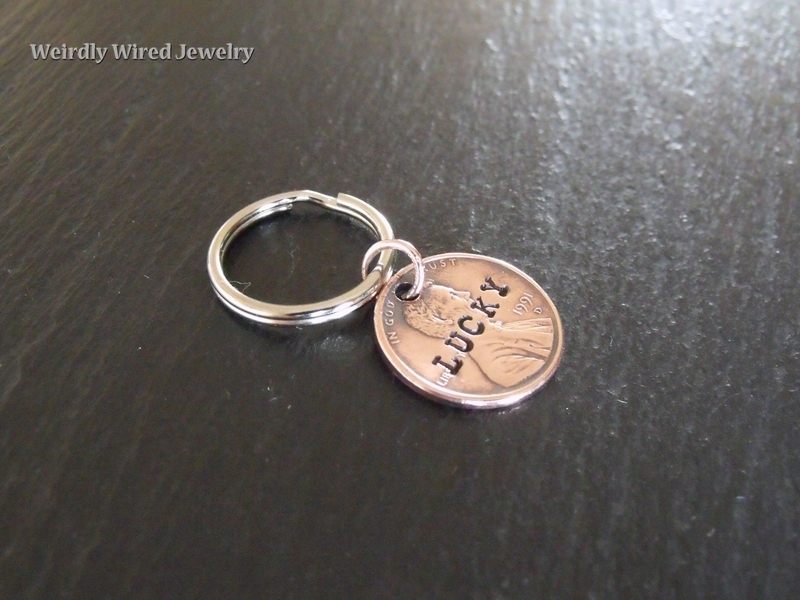 Stamped Copper Keychain - send email. 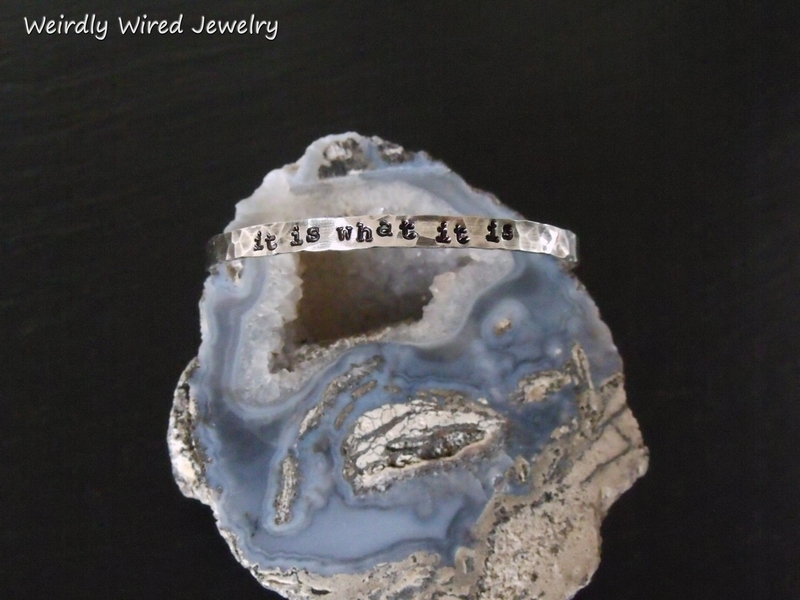 Stamped Sterling Cuff Bracelet - It is what it is - send email. 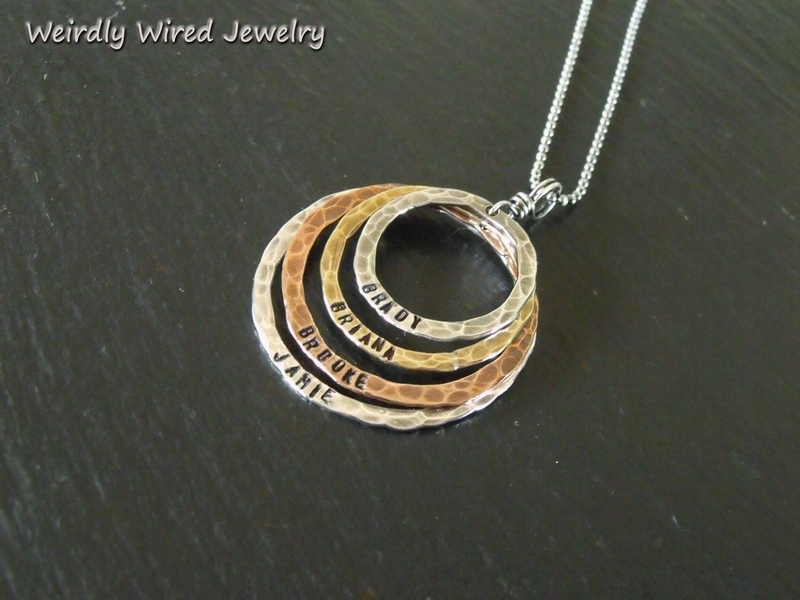 Stamped Layered Circle Mothers Pendant - send email. Broken Heart & Band Aid's Pendant - send email. 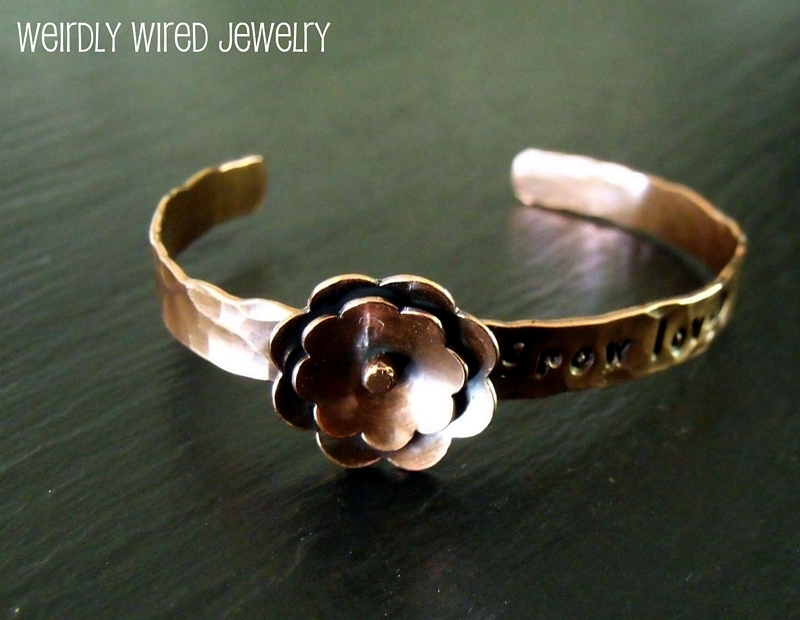 Stamped Copper Cuff - send email. 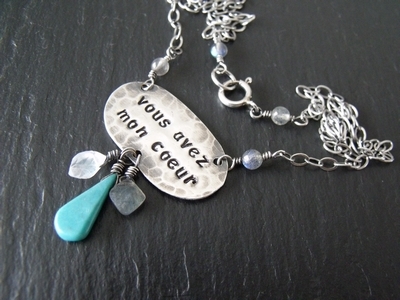 You Have My Heart Necklace - send email. Stamped Sterling Cuff - Sarah - send email. 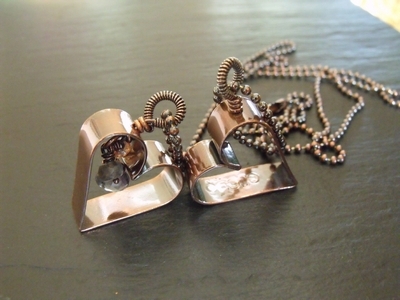 Hollow Copper Heart Pendant - Moriah - send email. Hollow Copper Heart - Both - send email. 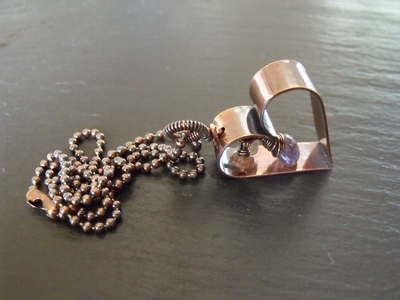 Hollow Copper Heart - Sheila - send email. 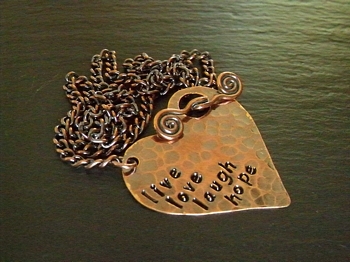 Stamped Copper Washer Necklace - send email. Hollow Copper Heart Pendant - Chris - send email. 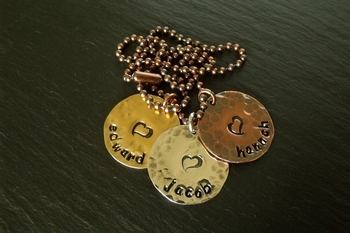 3 Metal Stamped Necklace Charm - Marie - send email. 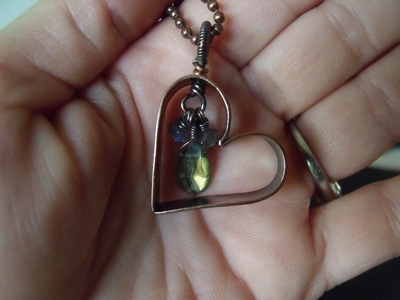 Jordan's Hollow Copper Heart w/Labradorite - send email. Stamped Cuff Bracelet-DARK - send email. 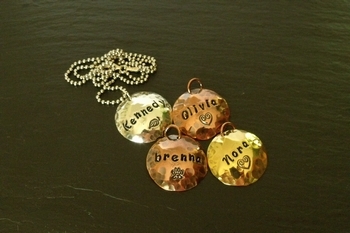 Four Names Stamped Mother's Necklace - send email. 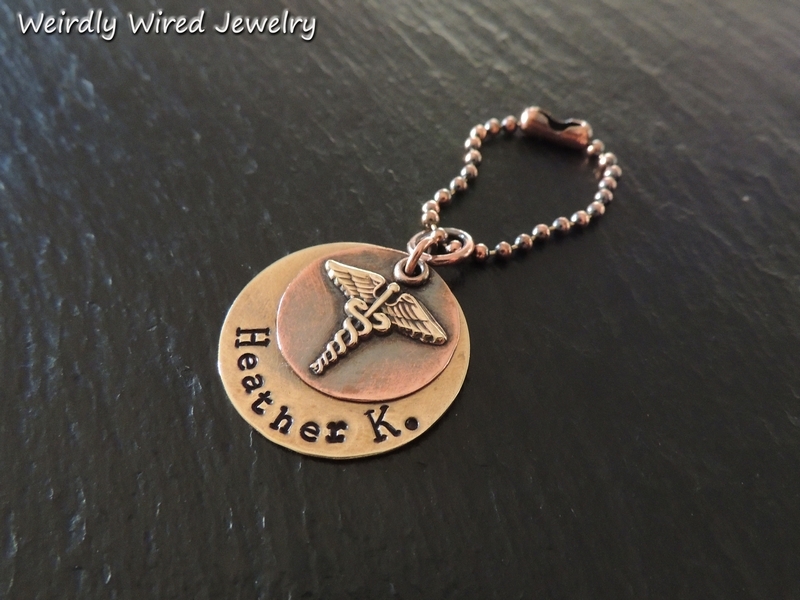 Stamped Copper Tag Charm W/Tourmaline - send email. 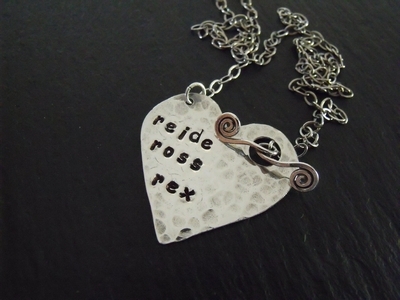 Stamped Sterling Heart Pendant - send email. 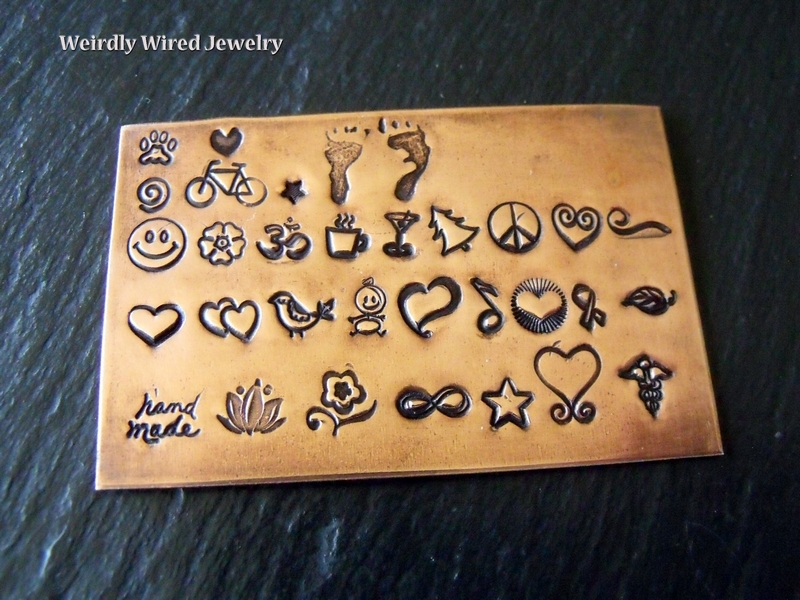 Stamped Necklace Charms-Copper and Brass - send email. 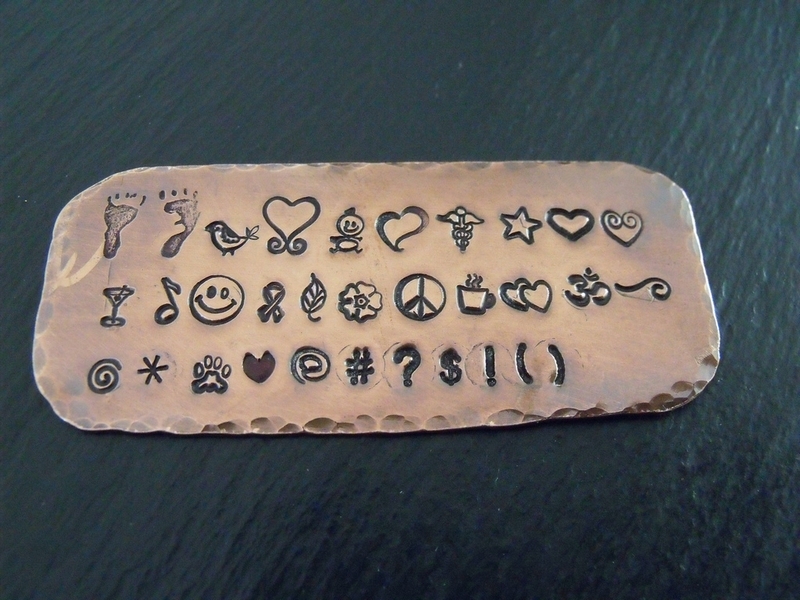 Stamped Copper Heart Bracelet Charms - send email. 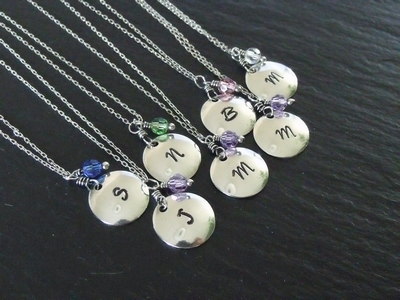 Sterling Stamped Brides Maids Necklaces - send email. 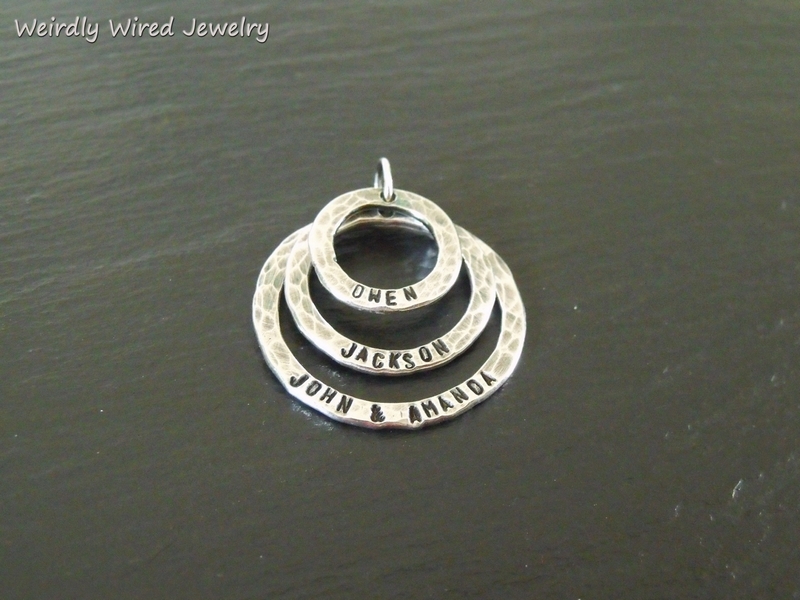 Three Metal Stamped Necklace Charm Pendant - send email. 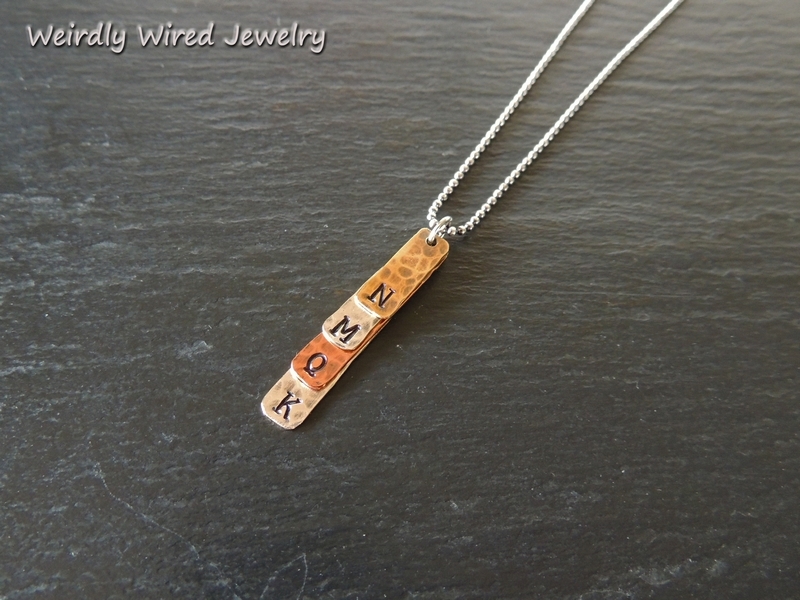 Four Name Stamped Mother's Necklace - send email. Skylar Stamped Pendant - send email. 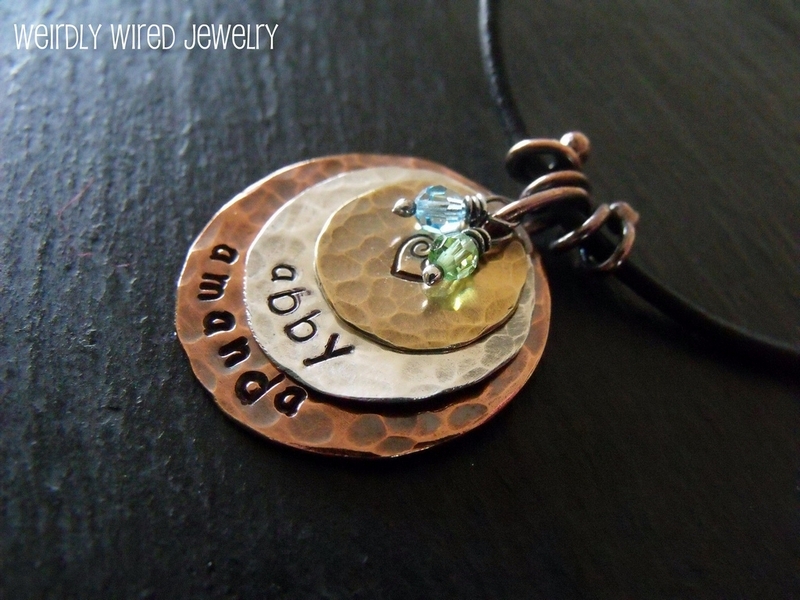 Three metal stamped pendant w/Baby - send email. Three Boys - three metals - send email. 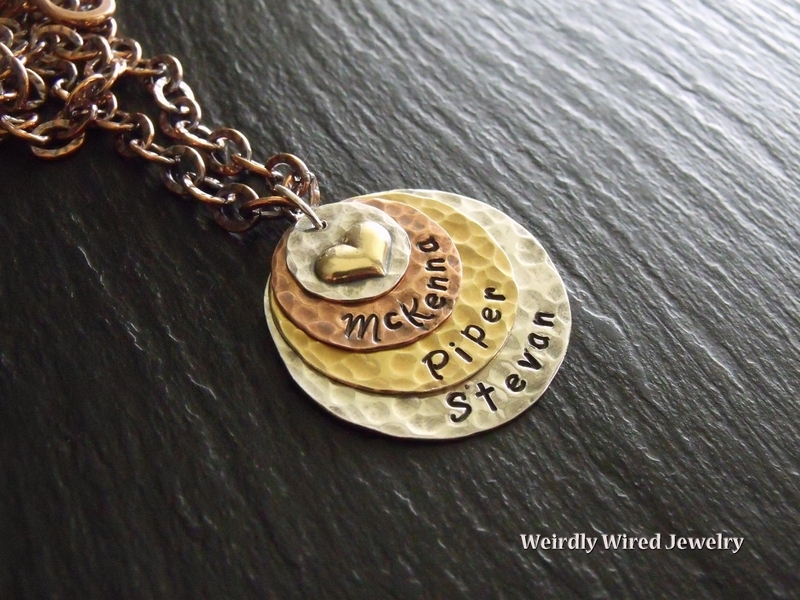 Three metal stamped pendant w/Swirly Heart - send email. Stamped Charm Bracelet w/Swarovski - send email. 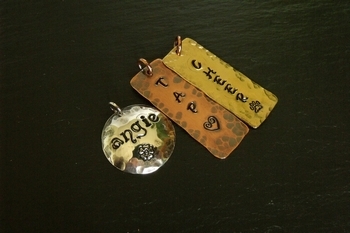 Brass round, Copper Tag Stamped Pendants - send email. KLD Set - send email. Stamped for Angie C - send email. Three Name Stamped Set - send email. Four Stamped Charms - send email. 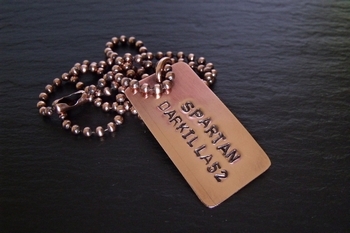 Halo Dog Tag - send email. Hunter & Hadley Bracelet - send email. 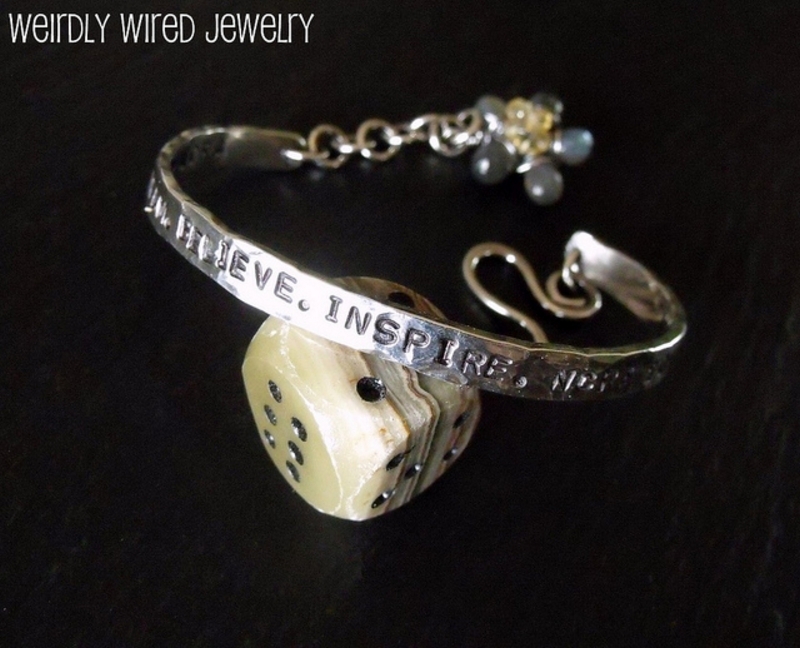 Stapmed Cuff Bracelet - send email. The Family Necklace - send email. 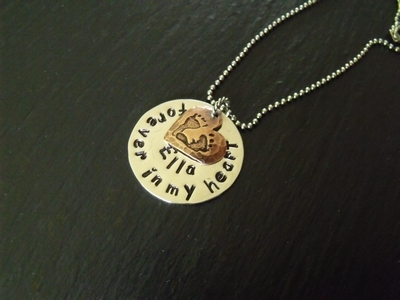 Stamped Focal Heart Necklace - send email. 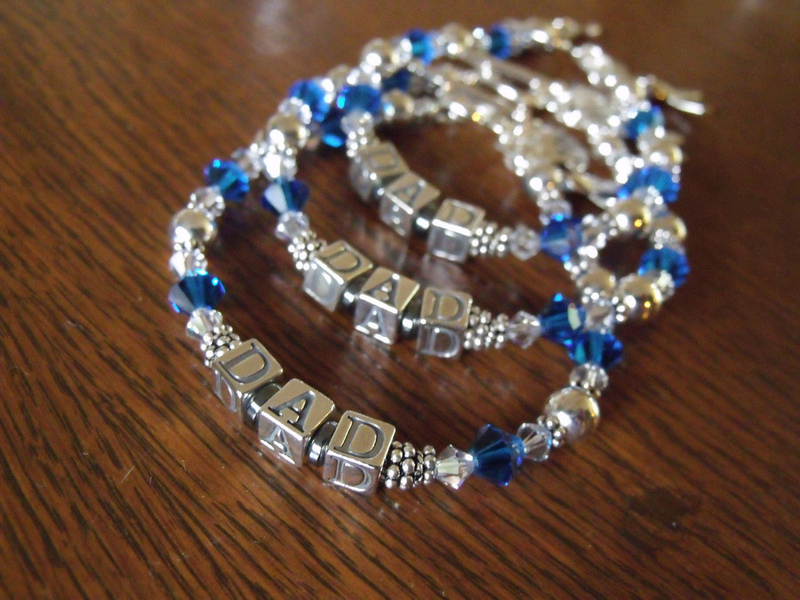 The Family Bracelet - send email. 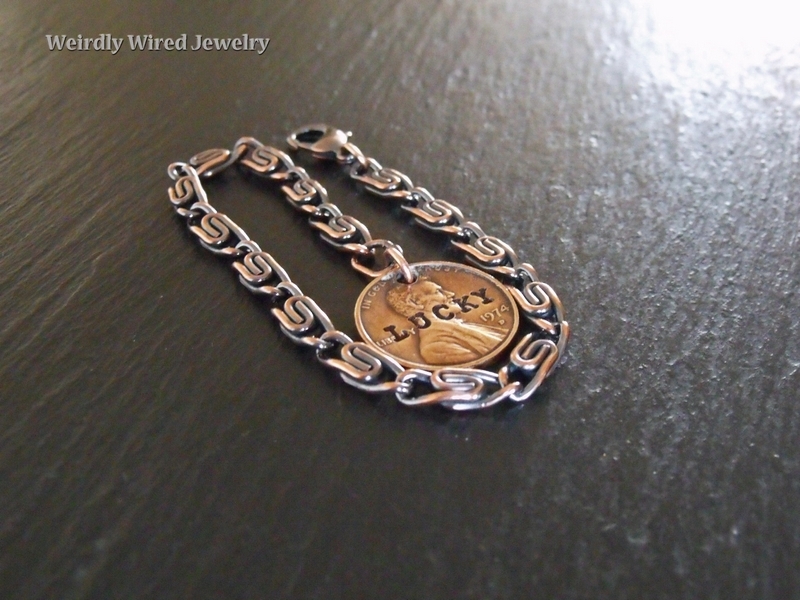 Three Metal Stamped Bracelet Charm - send email. 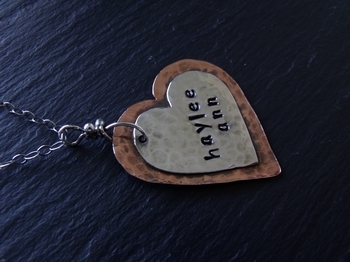 Mixed Metal Stamped Heart - Haylee Ann - send email. Stamped Hearts/Layered Circles Mosaic - send email. 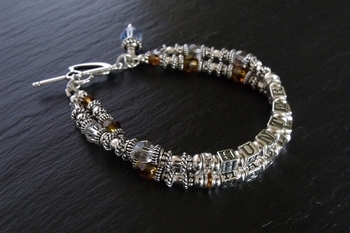 Remembrance Bracelet #2 - send email. 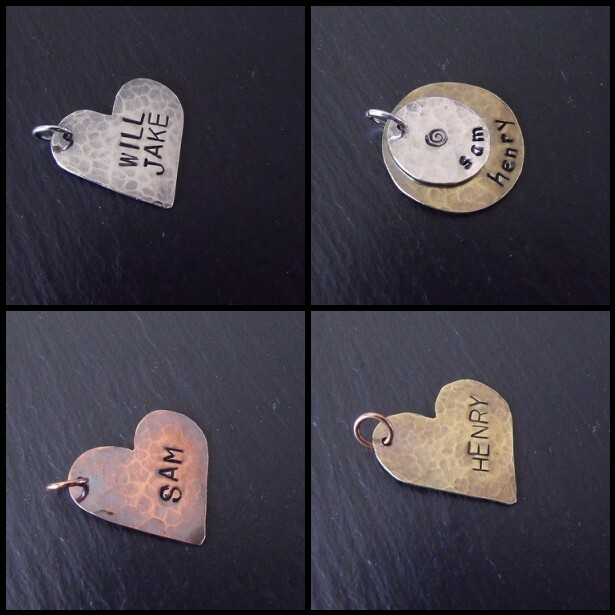 Four Names Stamped Heart Necklace - send email. 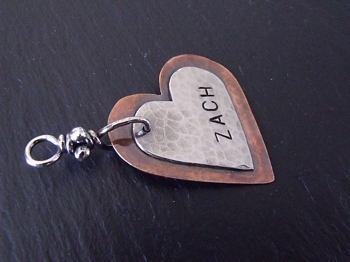 Zach-Stamped Layered Mixed Metal Heart - send email. 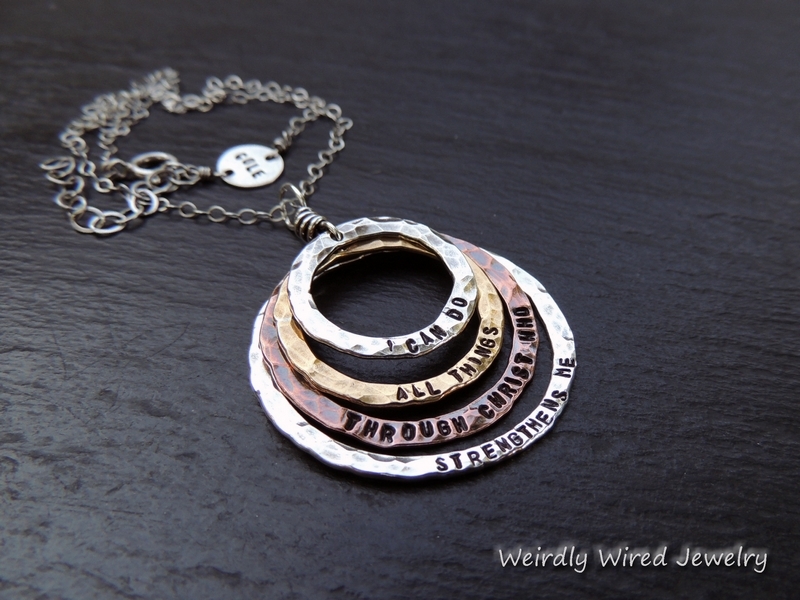 Mixed Metal Layered Circle Charm-Owen - send email. 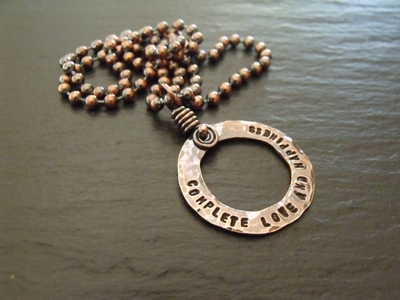 Layered & Riveted Necklace Charm - send email. Jackson Mothers Stamped Bracelet - send email. 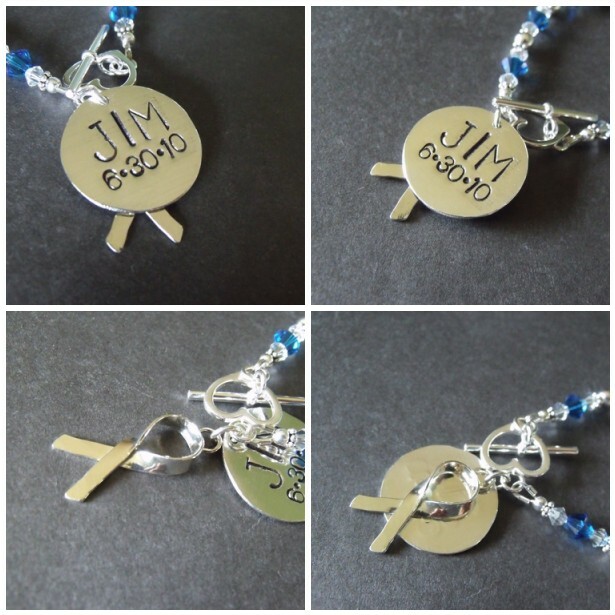 GMA & GPA Bracelet - send email. 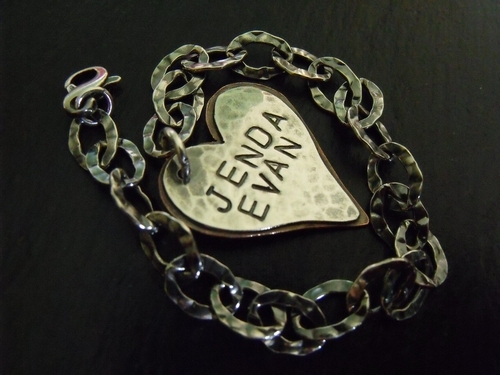 3 Disc Stamped Name Bracelet - send email. Remembrance Bracelets - send email. 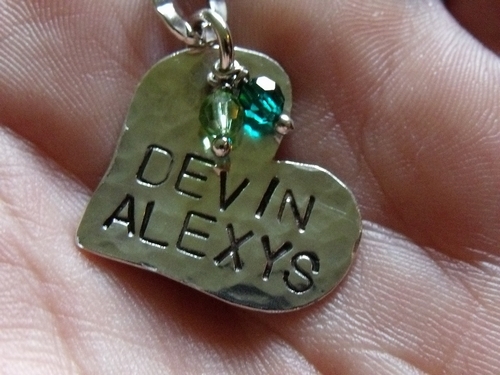 Stamped Heart Charm - send email. Three Strand Mother's Bracelet-Ewalt - send email. Grandmother's Bracelet in Silver & Gold - send email. Swarovski Heart Pendants - send email. Swarovski Birthstone Cross Necklace - send email. 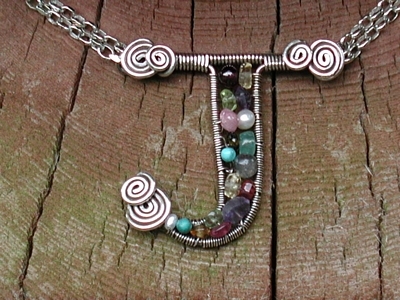 J Mixed Gemstone Pendant - send email. 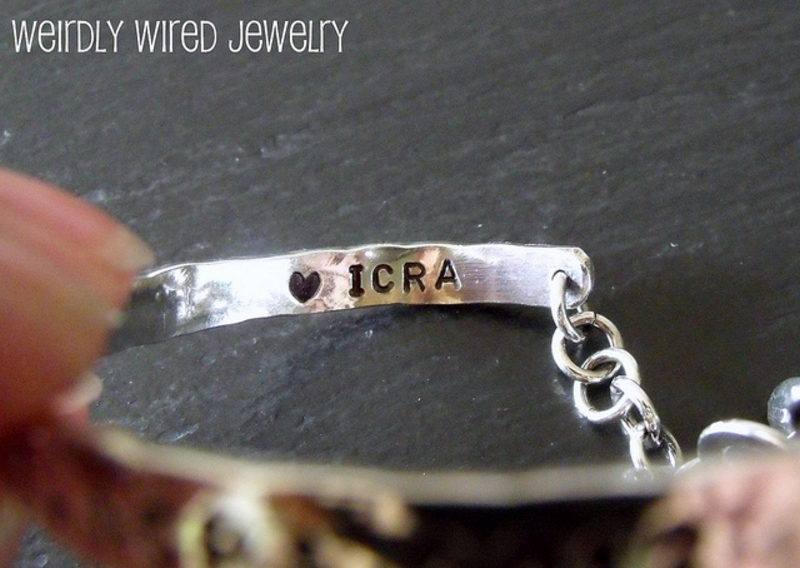 Wire Heart Mother's Name Bracelet - send email. Wire L Monogram Swarovski Pendant - send email. 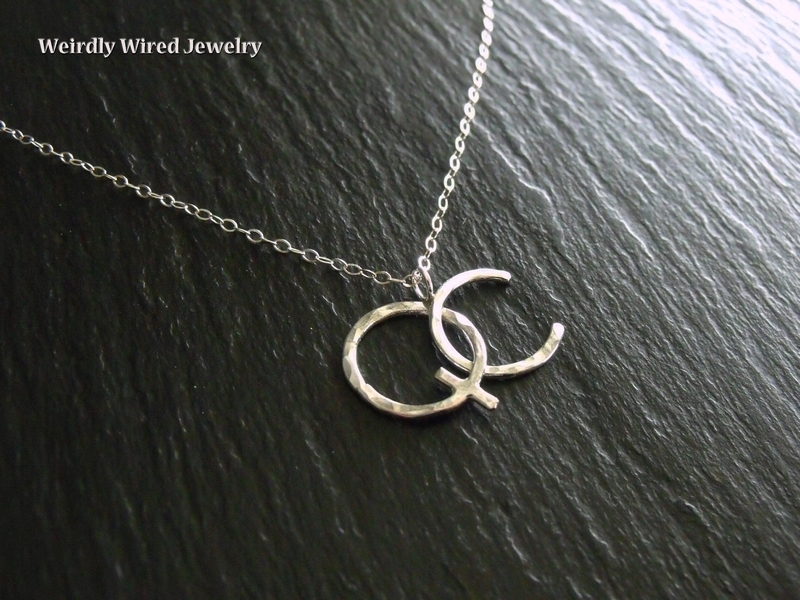 C Monogram Wire Pendant - send email. Letter A Wire Monogram Swarovski Pendant - send email. 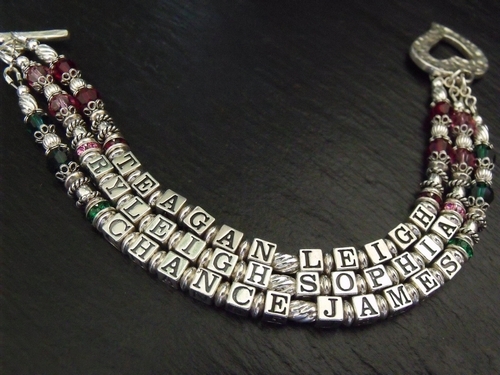 Nelson Mother Name Bracelet - send email. Two Strand Mother's Bracelet - send email. Chakra Name Bracelet - send email. Coiled Heart Swarovski Birthstone Pendant - send email. Letter N Monogram Mixed Gemstone Pendant - send email. Mixed Gemstone Mother's Bracelet - send email. 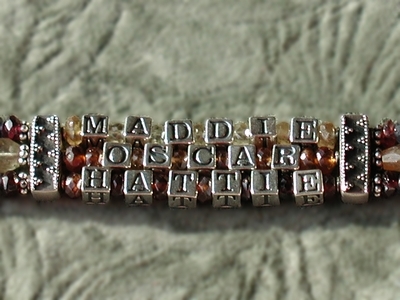 Three Strand Mother's Name Bracelet - send email. 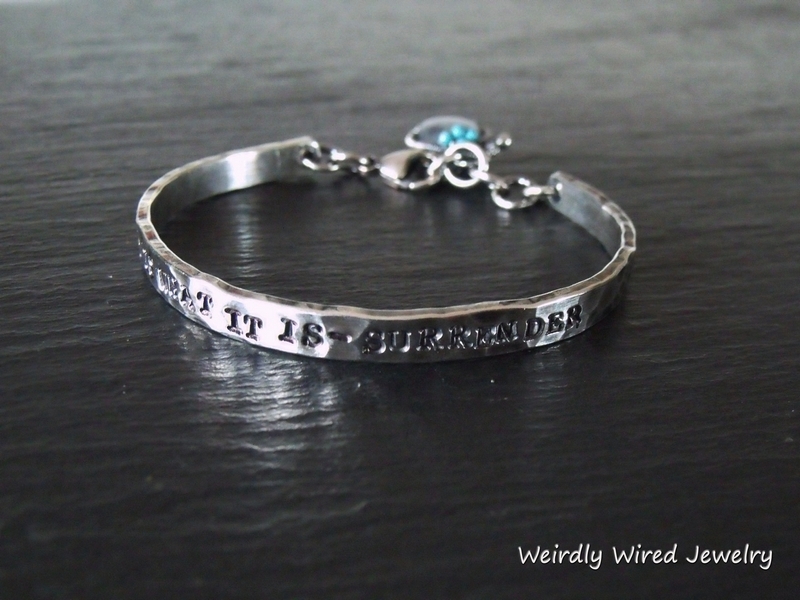 Turquoise Name Bracelet - send email. 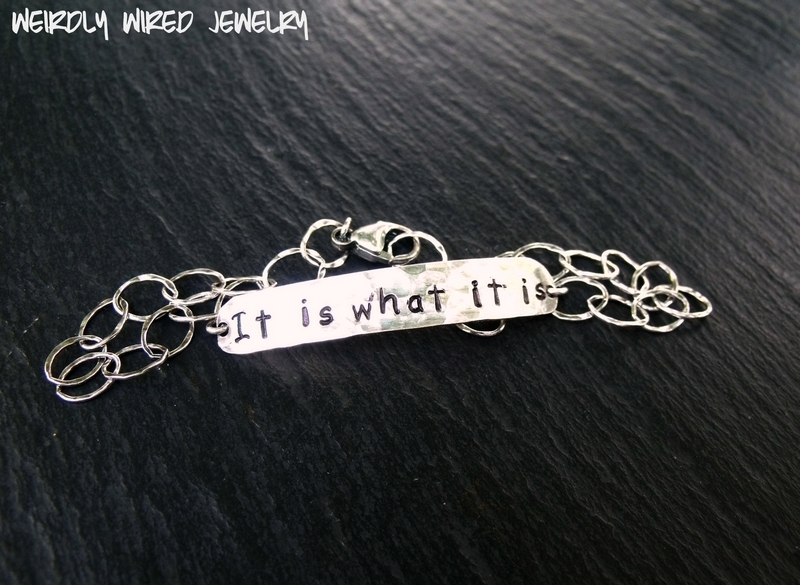 Wire Components Name Bracelet - send email. Letter S Mixed Gemstone Monogram - send email. Letter C Mixed Gemstone Monogram - send email. Bling Mother's Bracelet - send email.